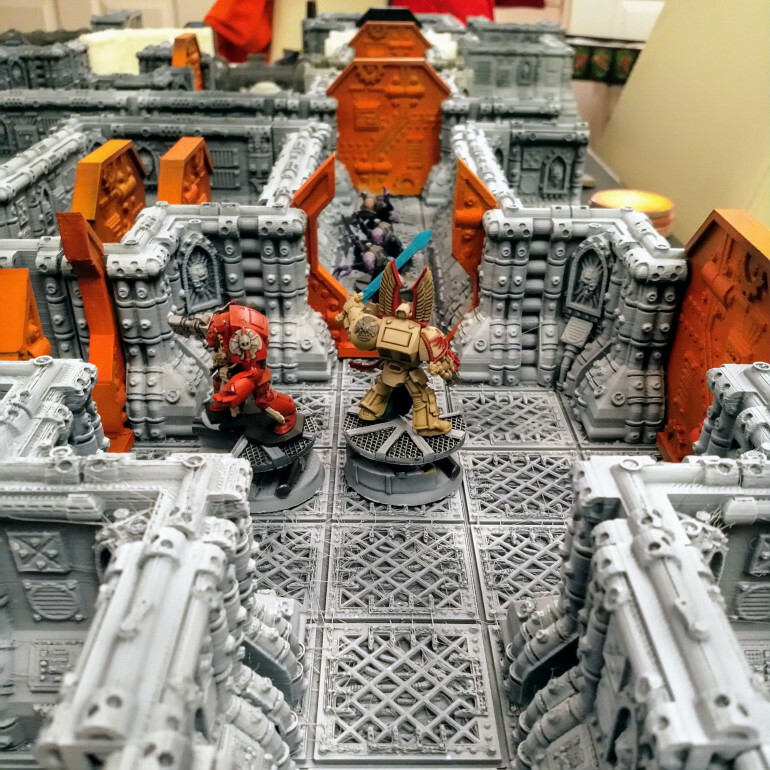 Got the game setup to play for the first time and I’m really please with it. 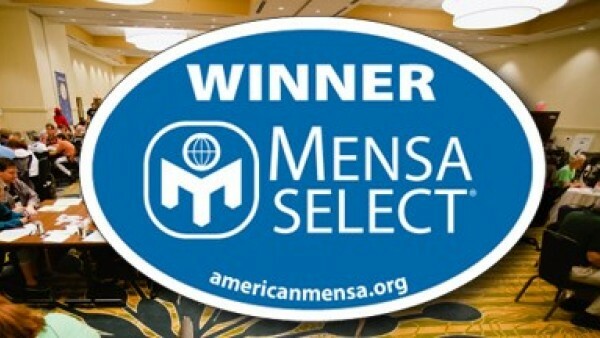 Should have read the instructions an I would have had the right starting squads, but hey ho. Ironically the printers are still going, and will complete 2 parts of the ship while the game is playing – that’s M2 technology right there. I’ll keep going with this past the deadline as it’s been epic and I ‘ll probably look to do more on the painting / customising side. 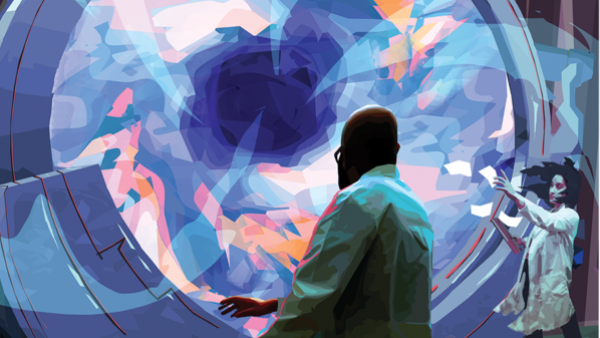 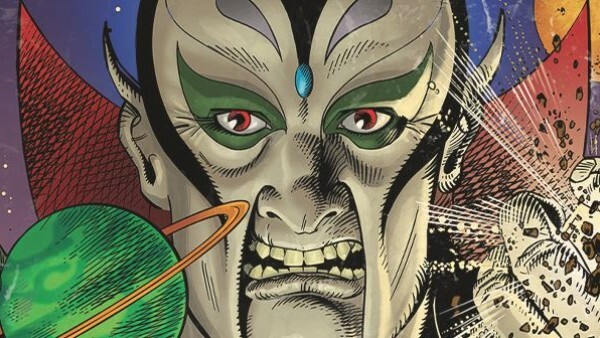 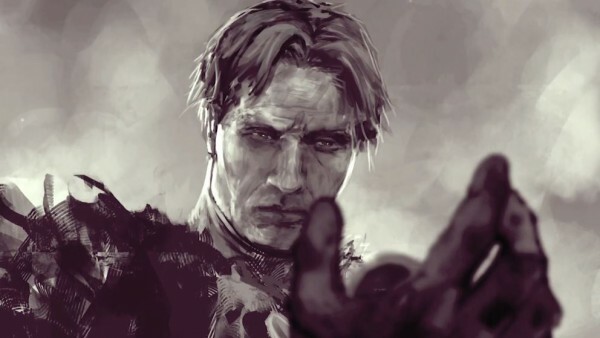 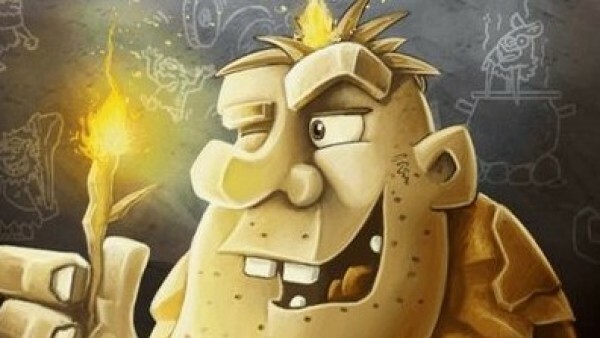 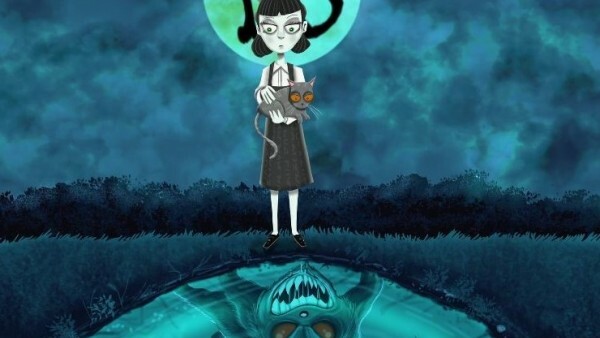 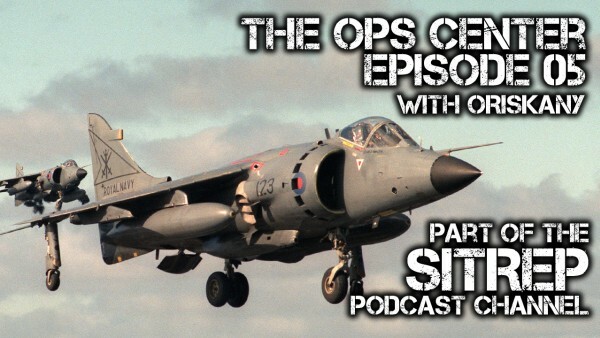 Producing all the parts in the timeframe has been the big constraint on the project but it was great fun to do. 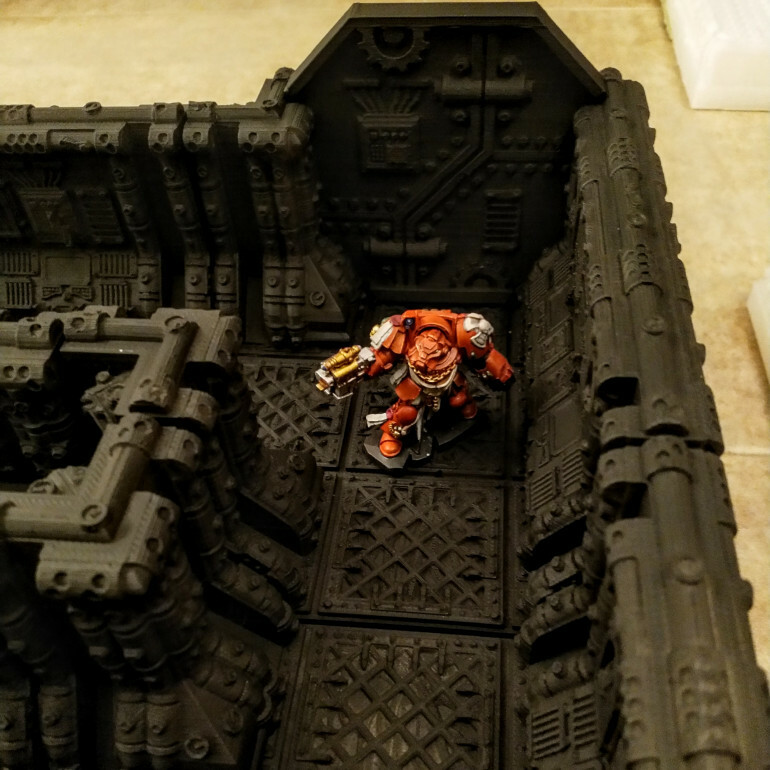 Getting the last of the painting done. 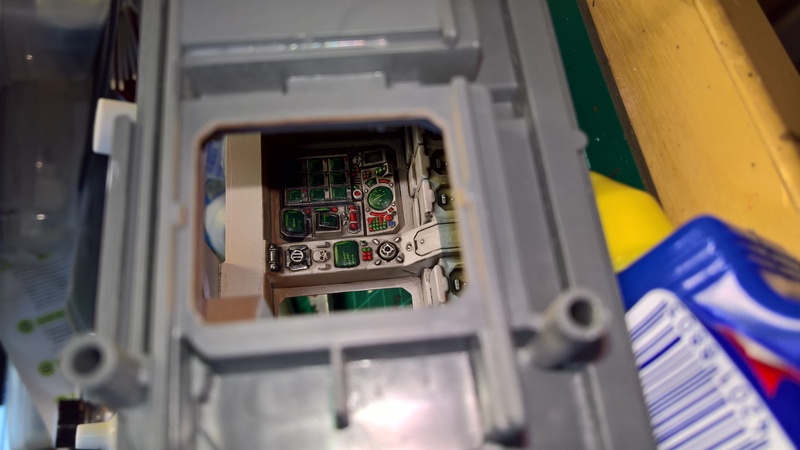 The doors now have their main colour down, there aren’t enough of them , so we’ll use a few from the main box. We have a number of the plastic rafts as a left over from the so we can draw some squares on these and use them in place of the corridor sections that we don’t have. 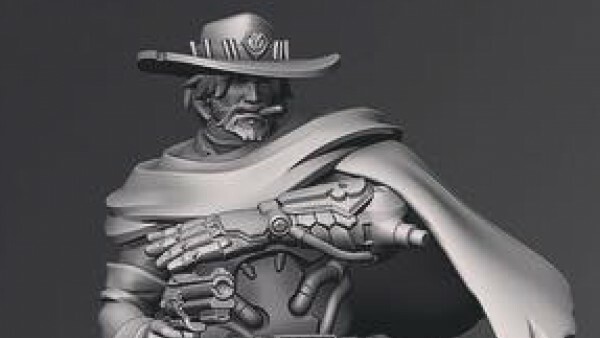 So this is really the last night before the deadline. 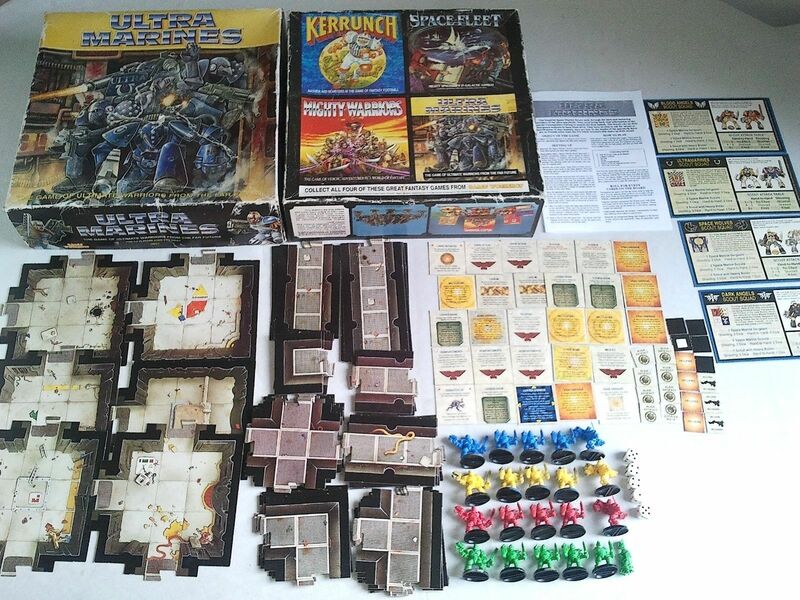 I have enough parts to play a game, not enough to complete the board, but roughly 75-80% of it at a rough estimate. 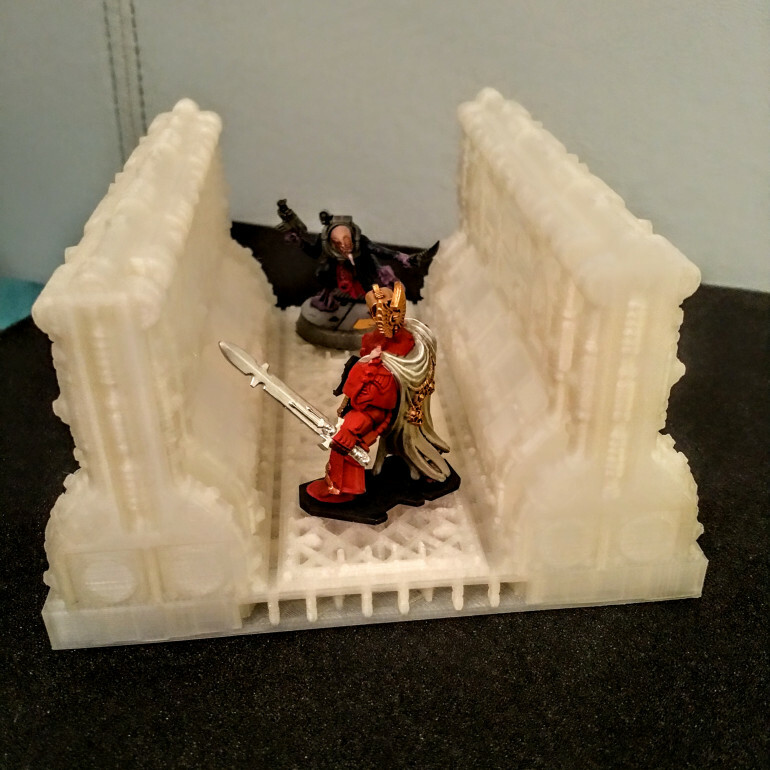 Having the second printer (the Adventurer 3) helped boost the project, but it took longer than anticipated to get it to find it’s rhythm in printing parts with low duds – it doesn’t really like the filament that I’ve been using for the Finder. 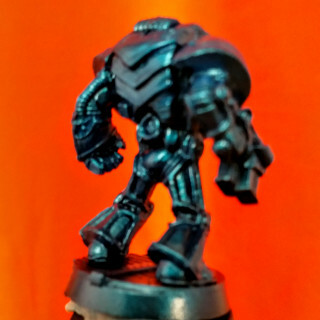 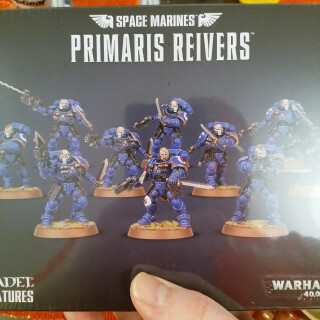 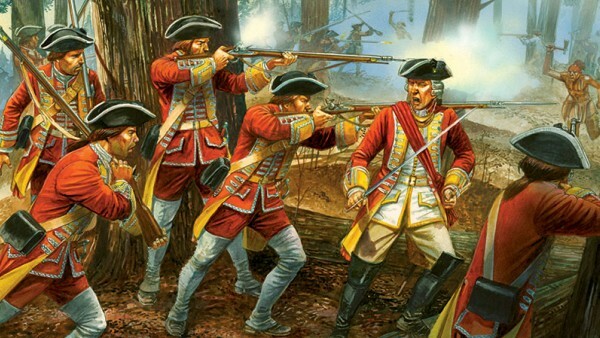 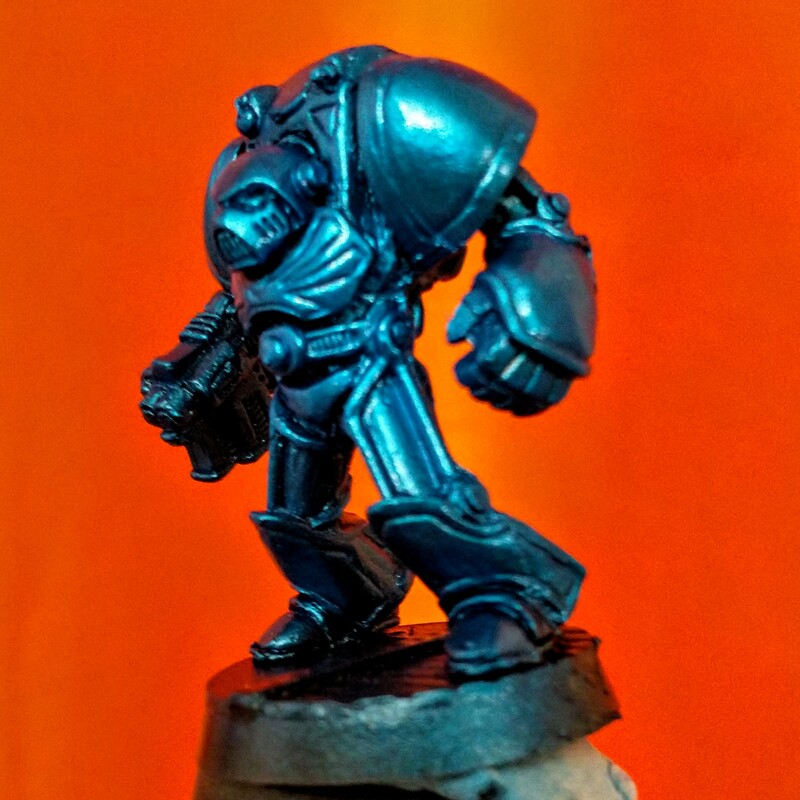 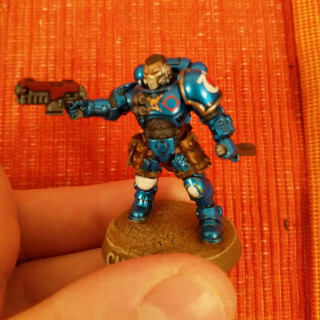 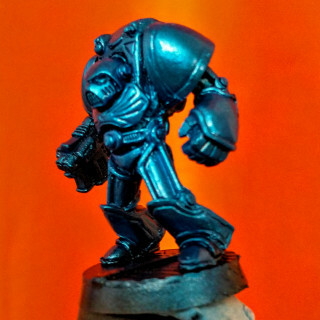 you have a lot of time to find other stuff to do before you can really paint terrain sets I’ve looked at models and I think I have enough of those I’ve built some scouts using reivers and metal devastator weapons for the ultramarine game. 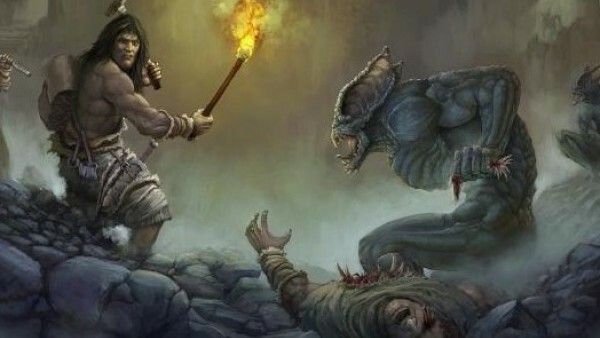 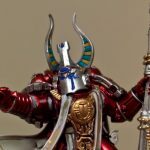 I’ve looked into Tyranid attack and started looking at warriors. 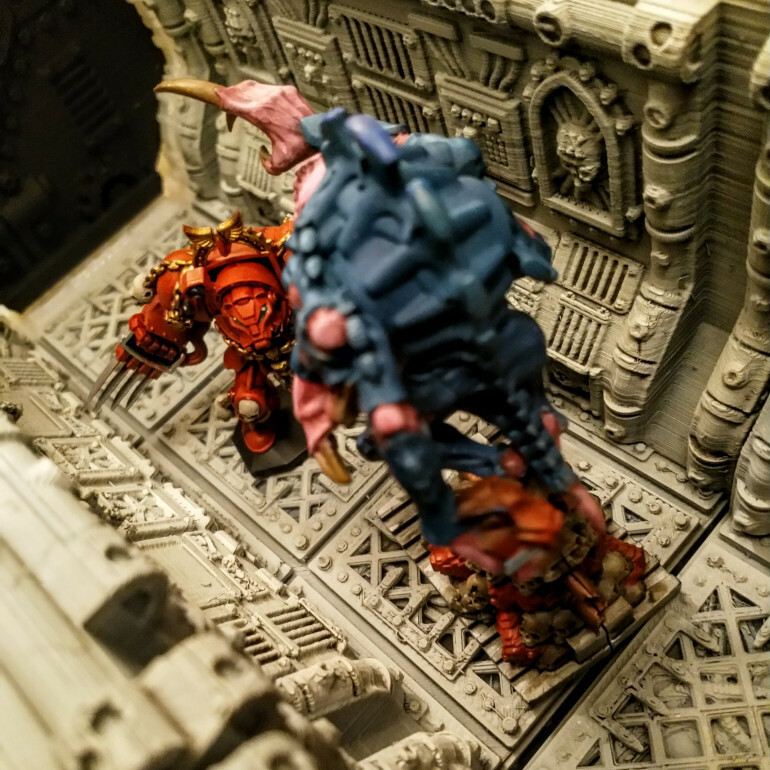 I’ve added the image gallery below with some pics from the final push…. 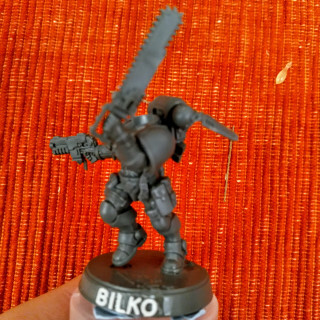 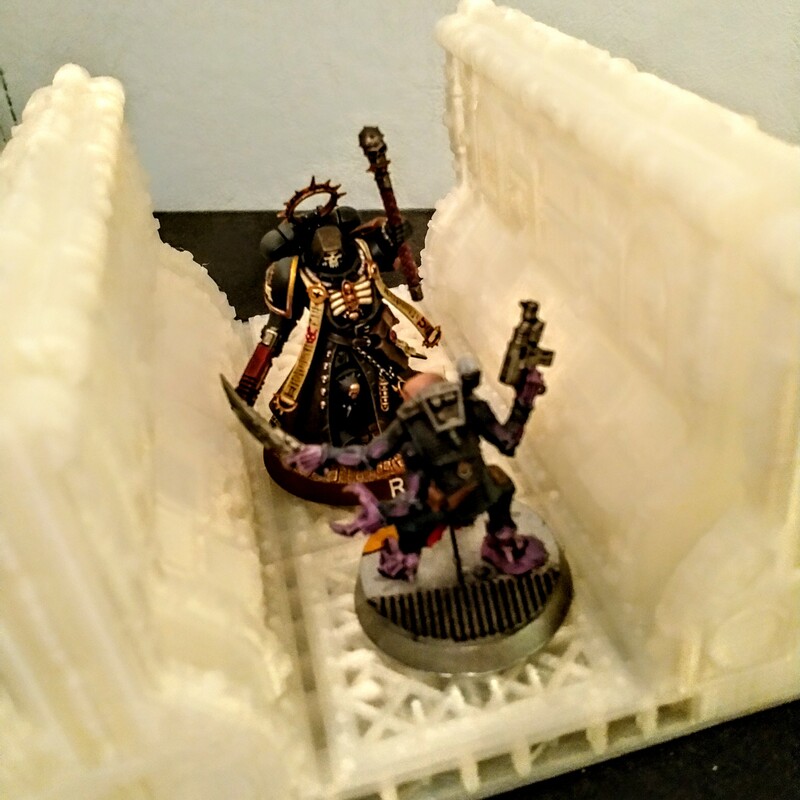 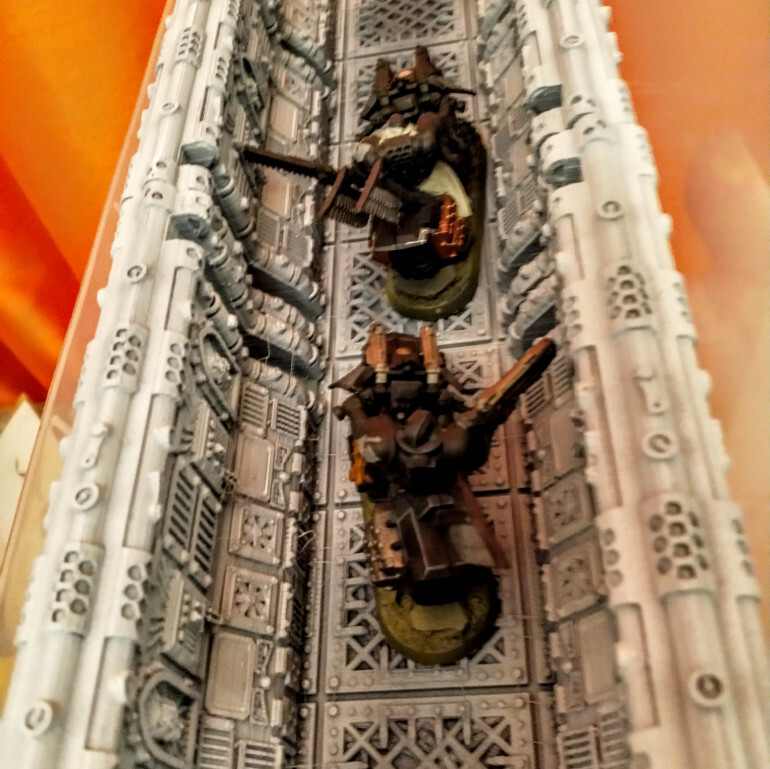 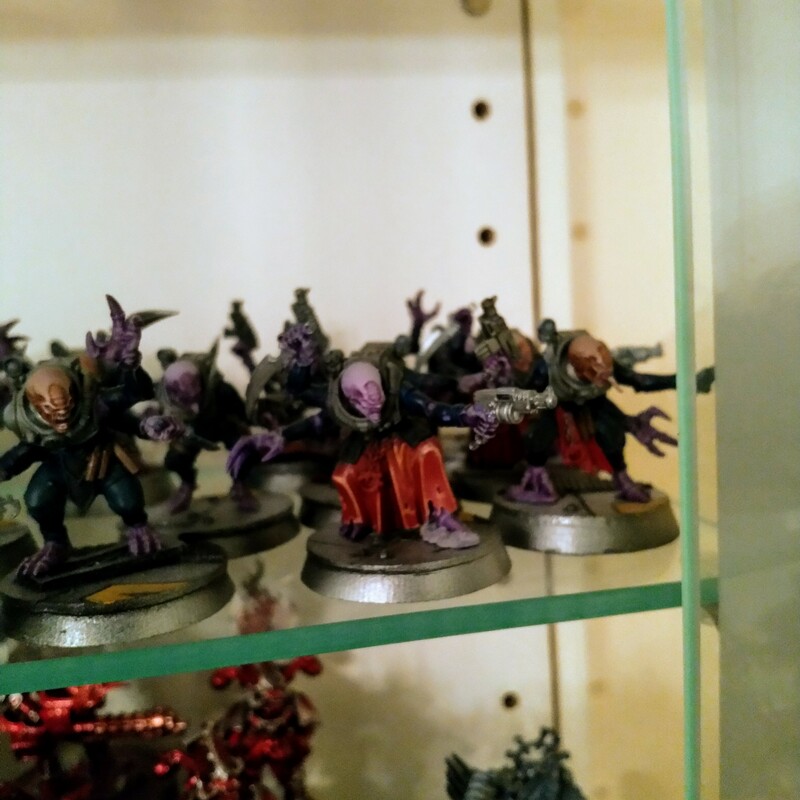 I’ve spent a bit of time just swapping the minis for different ones – Prospero, Calth, Deathwatch overkill, Dark Imperium, ‘Ultra Marines’ [scouts] event the Ravening (I should add that I was just being silly here, but I can kitbash the stl files to make wider corridors and I do have the Speed Freaks set) and each time you do , the lore swaps with it, an ti becomes a whole different game. 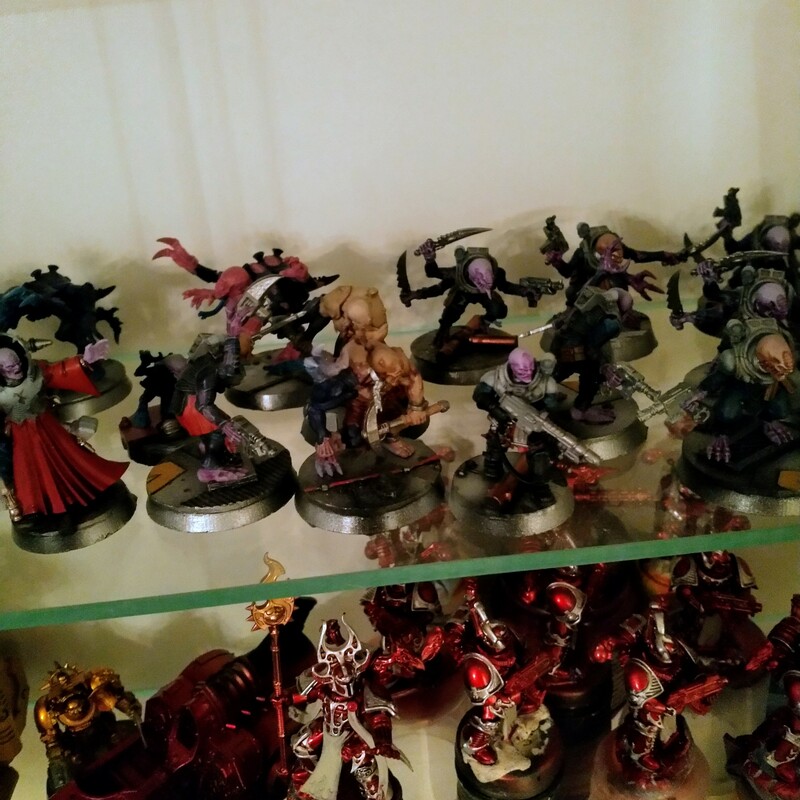 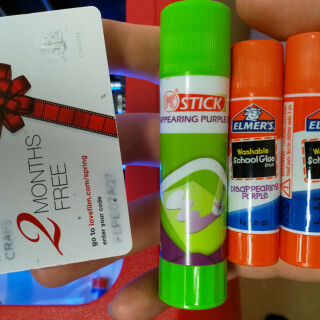 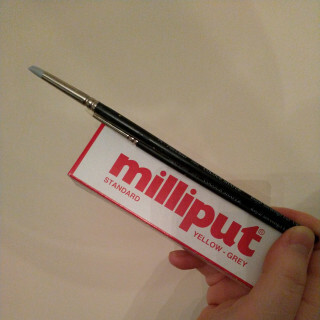 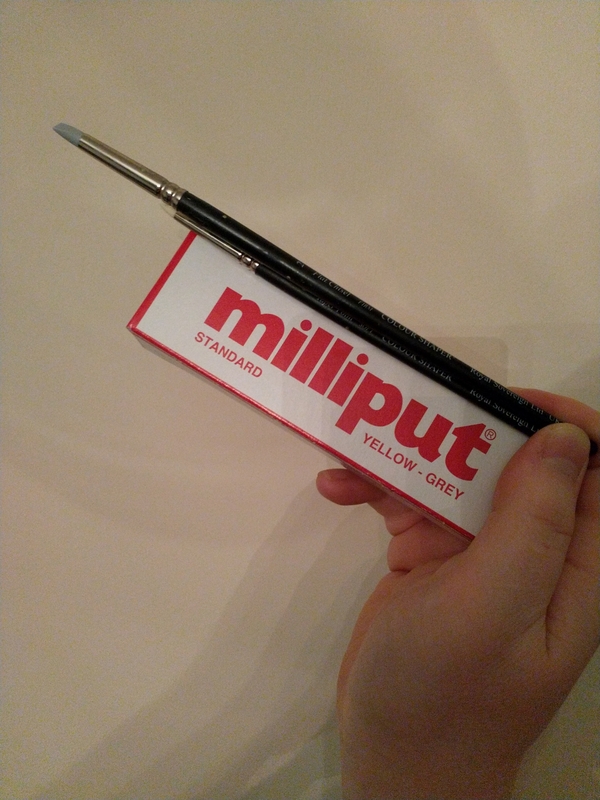 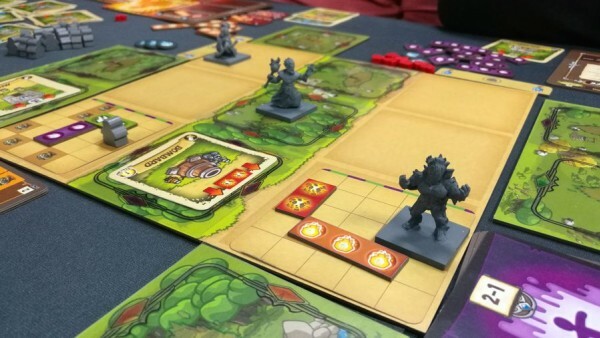 I had a lot of fun just swapping minis and thinking, what if….. anyway I’ve run out of layouts that I can add to this post so I guess I’ll have to leave it here. 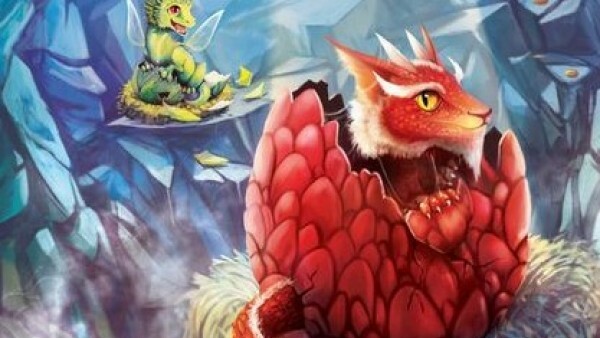 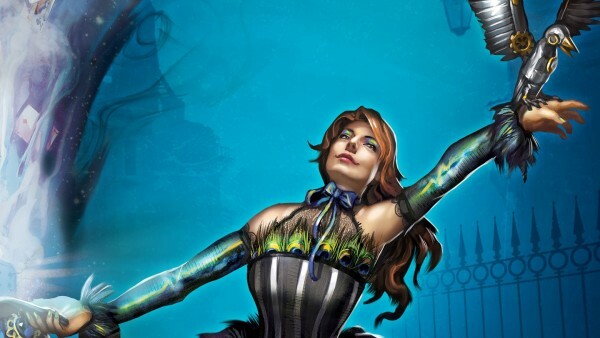 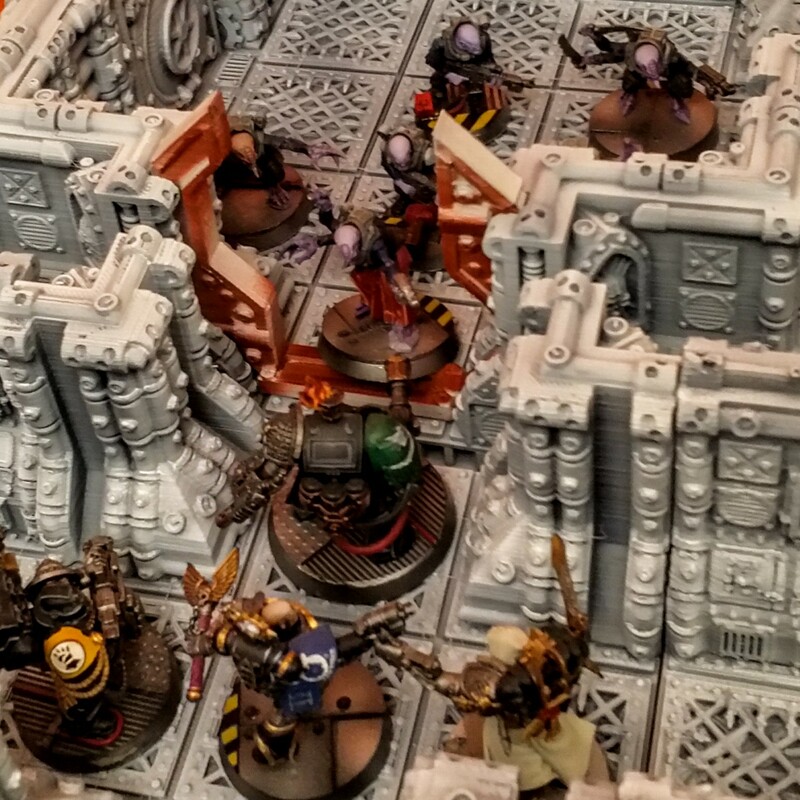 What are the Ravenwing doing here? Thess so far based on the updated list. 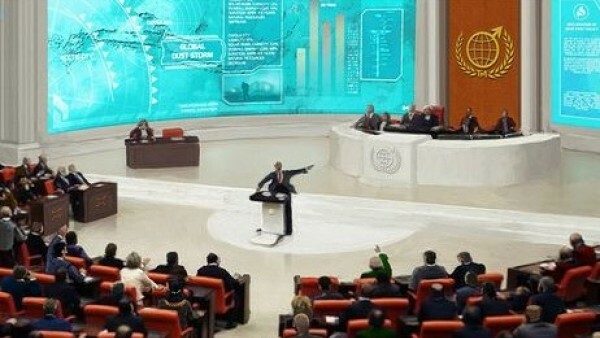 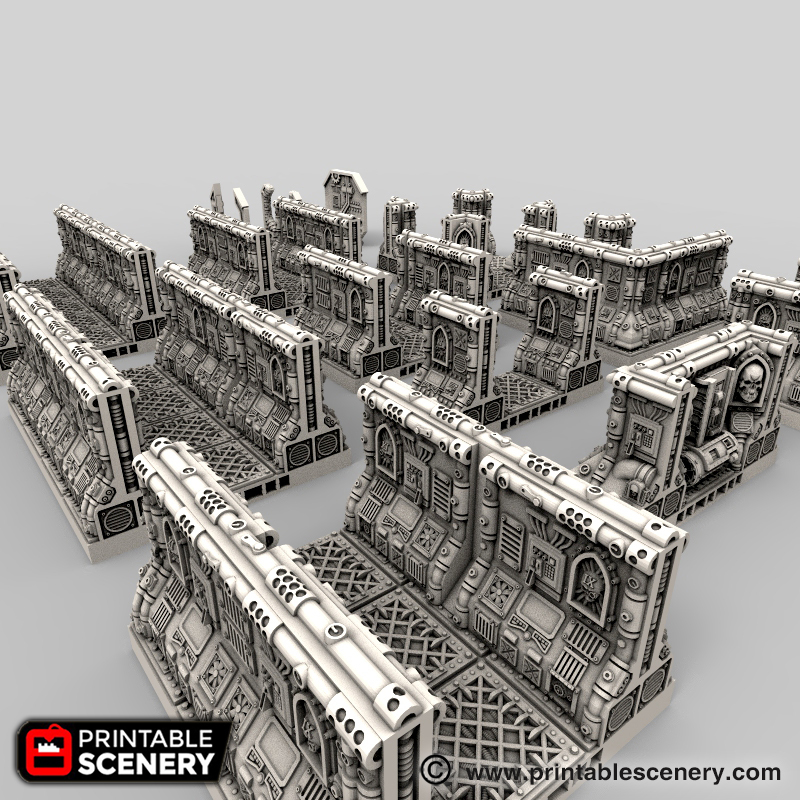 I’m going to prepare the the models to play some of the other games as well with the terrain set. 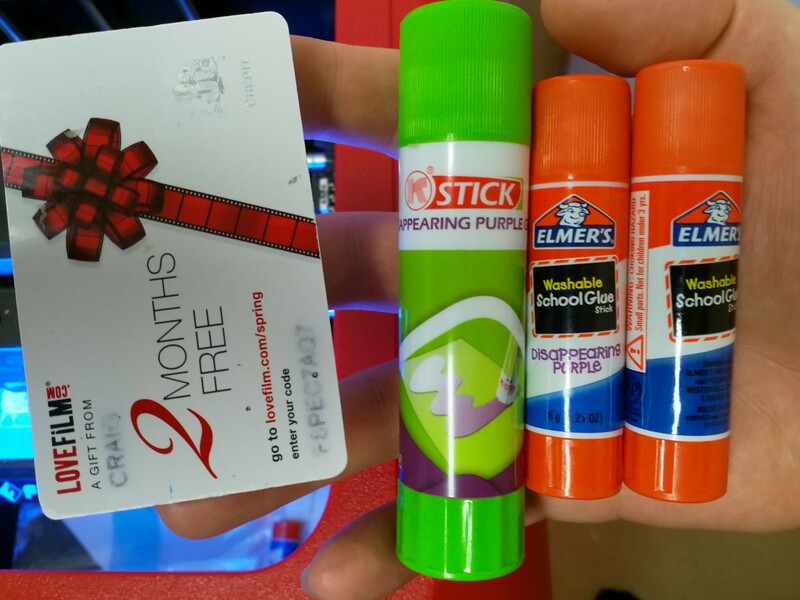 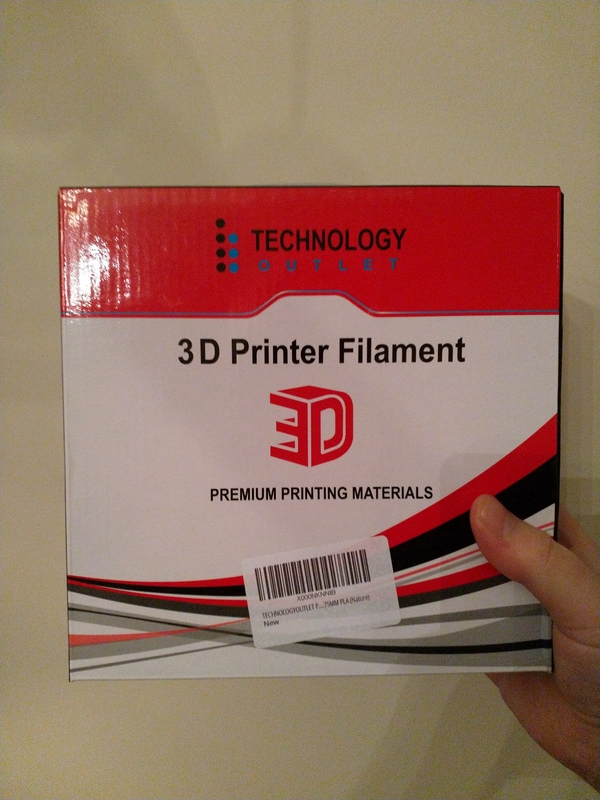 This will allow me to keep going with the models while the 2 printers are fed PLA and ABS 24/7 to get the models out. 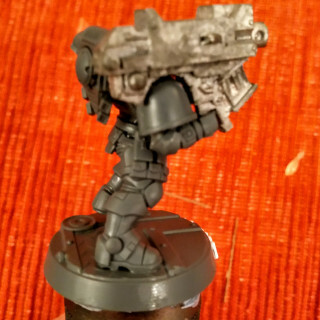 I never liked the old scout models, so we are going to start the models off with some Primaris Reivers and convert them. 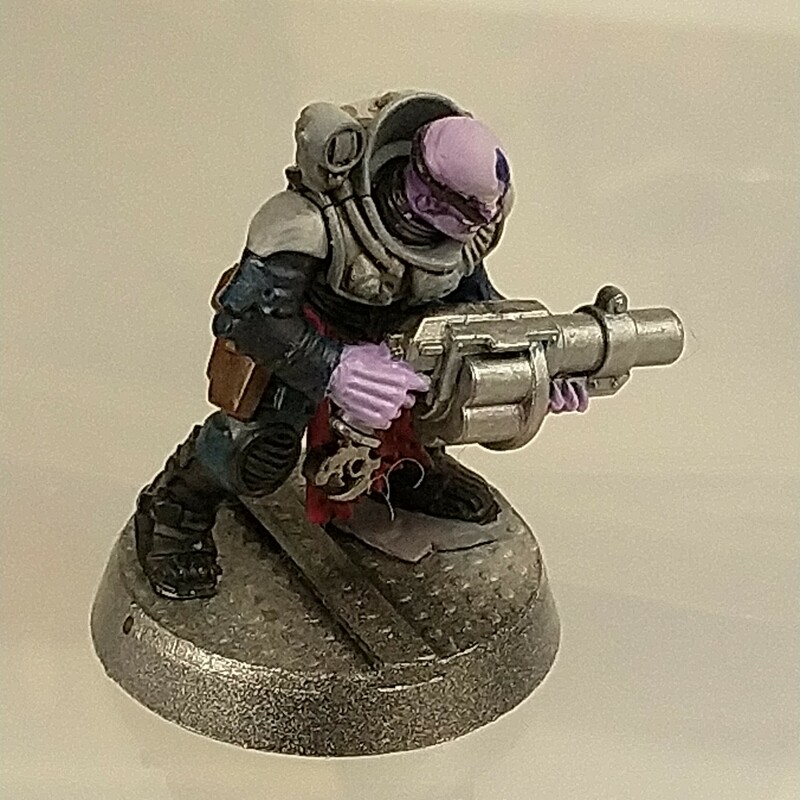 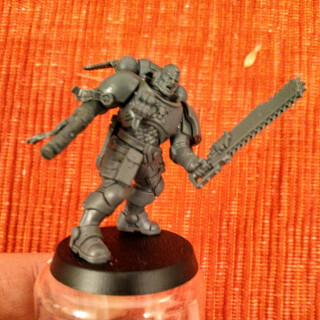 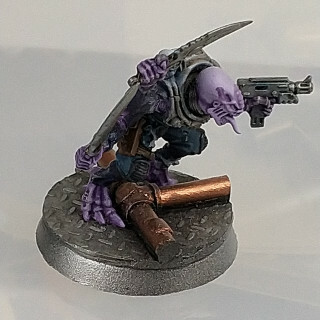 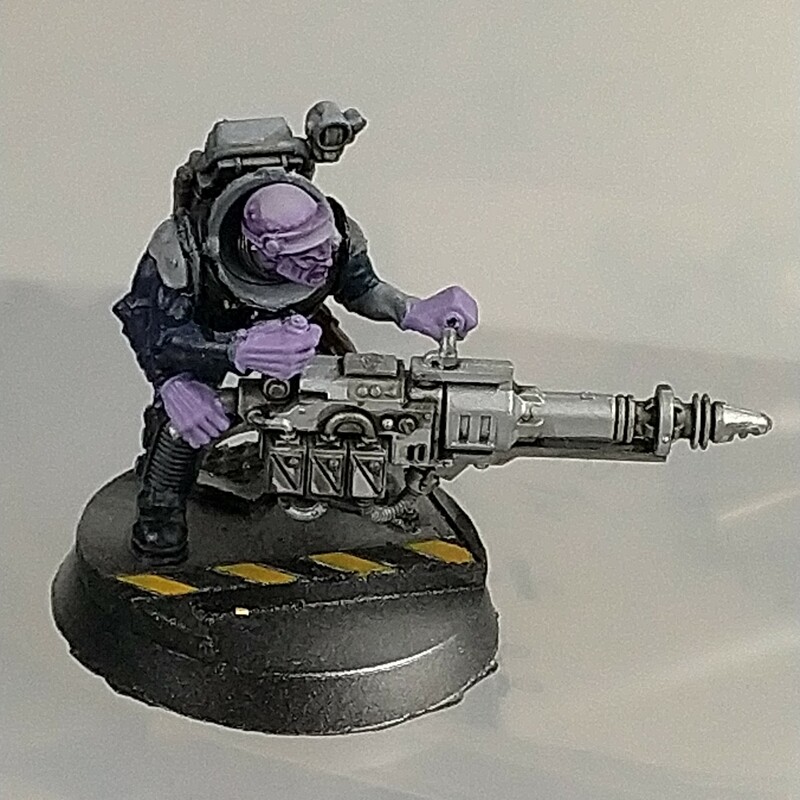 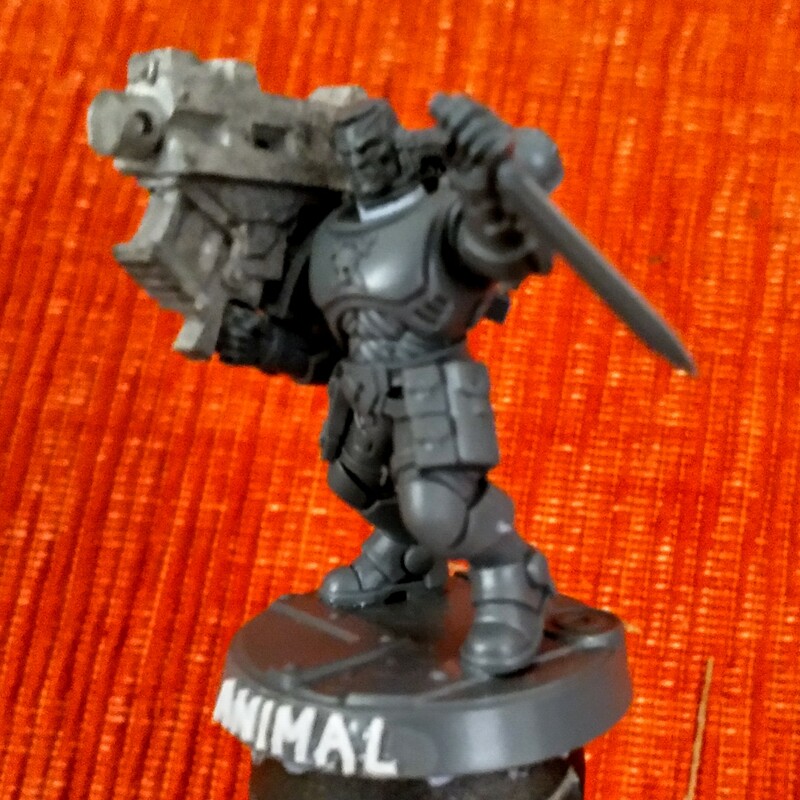 I ordered some of the old metal shoulder-mounted heavy weapons for this conversion of of ebay. 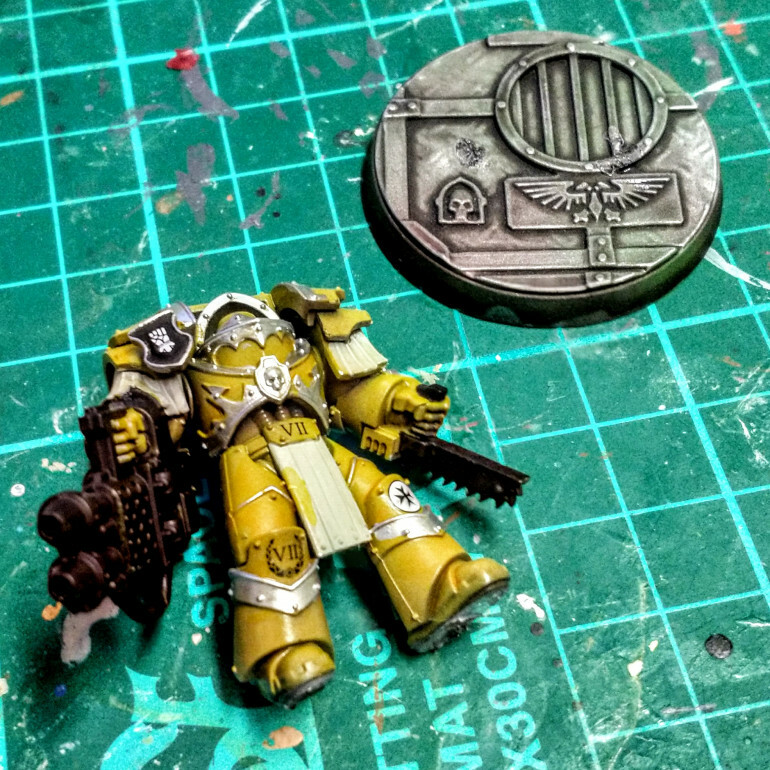 as below, using some spare arms and shoulderpads from the intercessors kit I converted them to the models below. 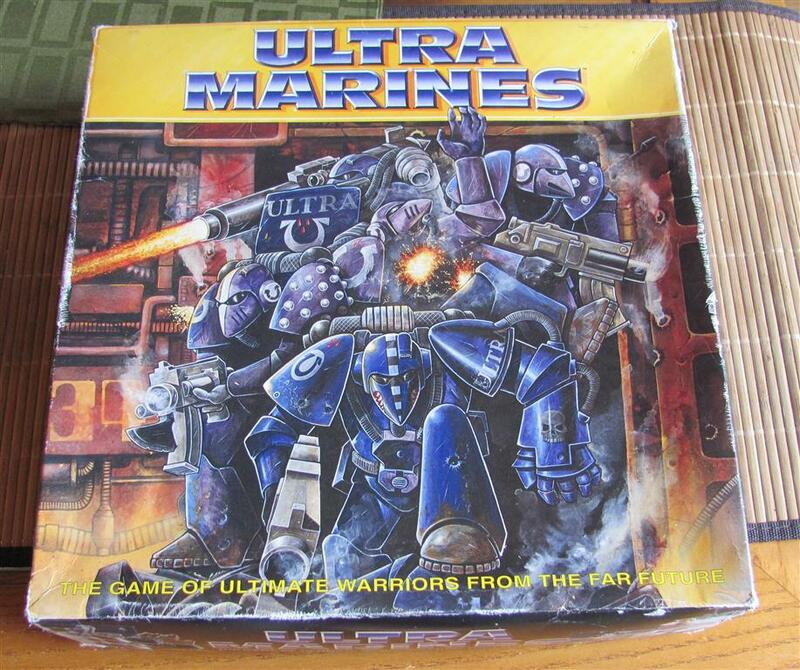 Space Marine Boxed Game Components that are ready to go. 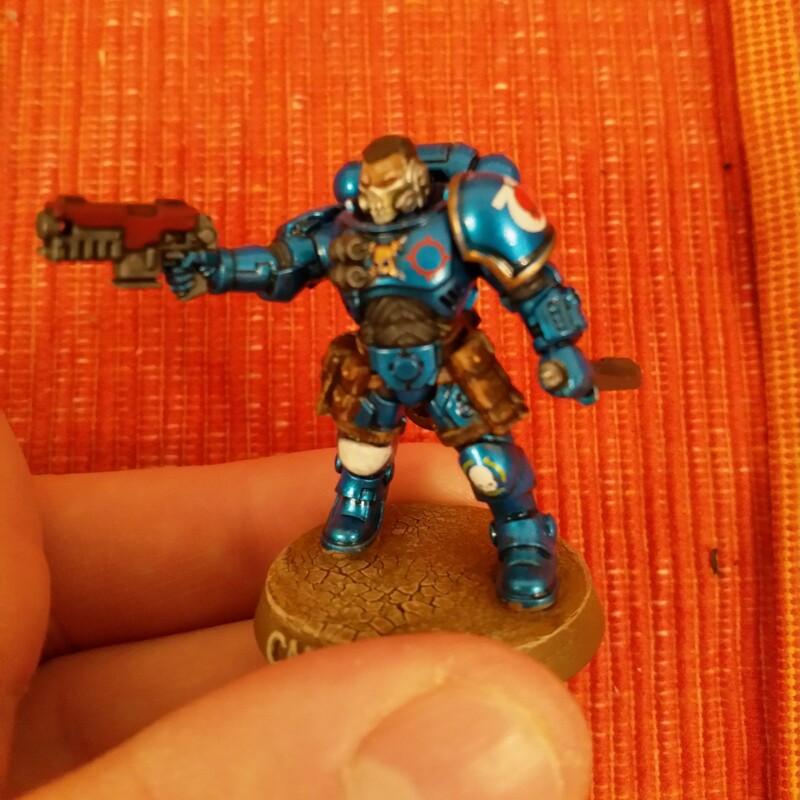 I have 3 Reivers already done for the Ultramarines in my metallic scheme, so just the 2 more to do. I’m just going to proxy the heavy weapons as I do quite like the las cannon and the Heavy Plasma which will be fire for me. 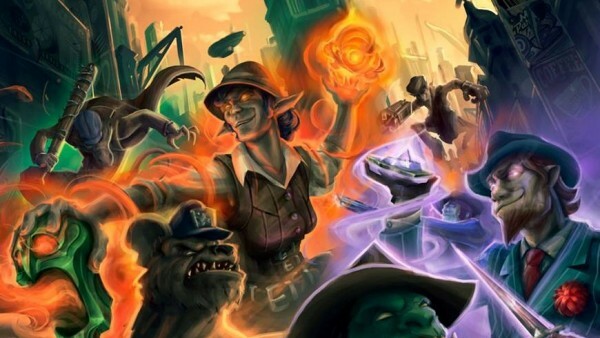 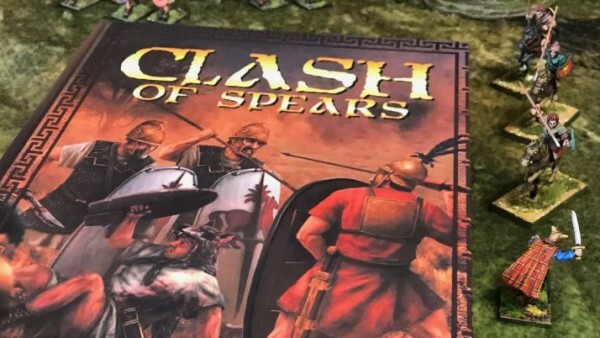 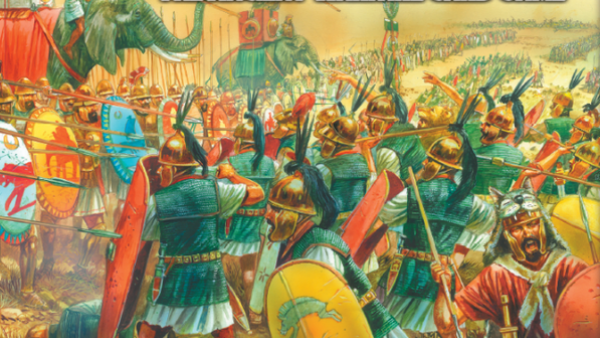 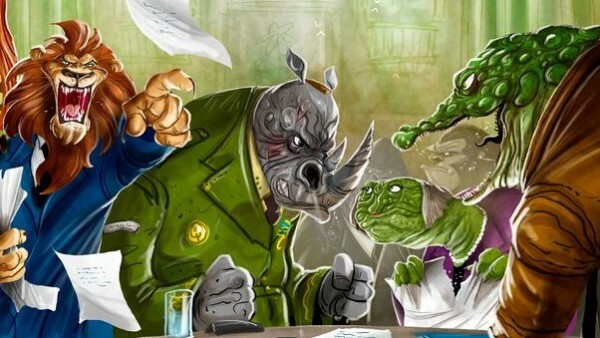 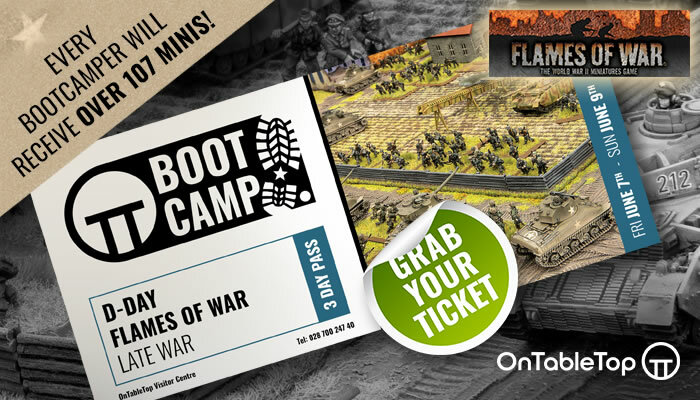 I am on the lookout for a digital copy of the rule book for this game, and I will probably need to get a s/h set tor really play, however I can get the board and minis ready in advance of that. 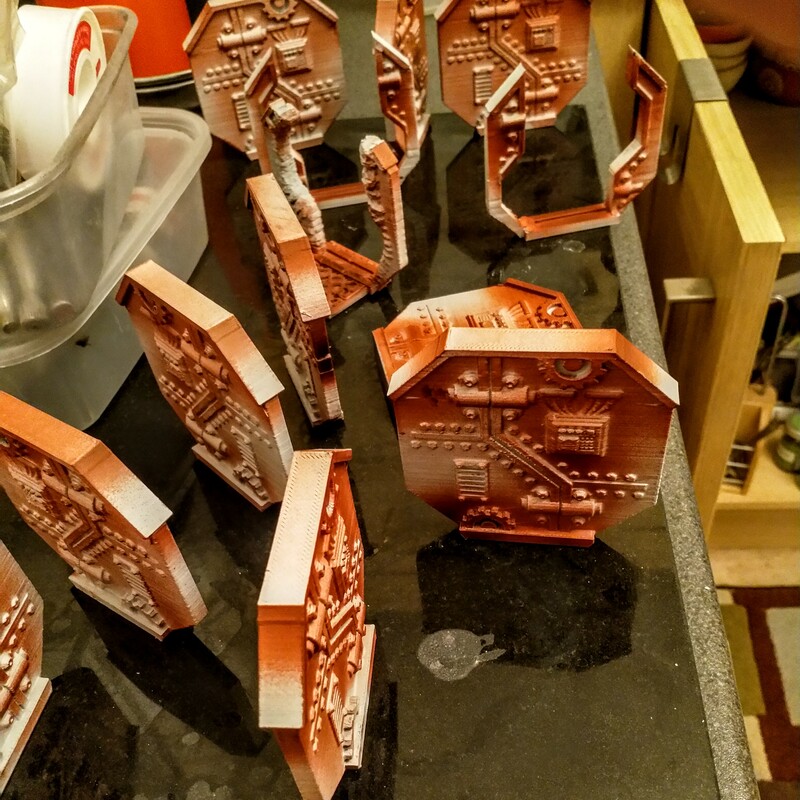 I’ve got another dozen or so parts printed and have laid them out – it’s starting to take shape. 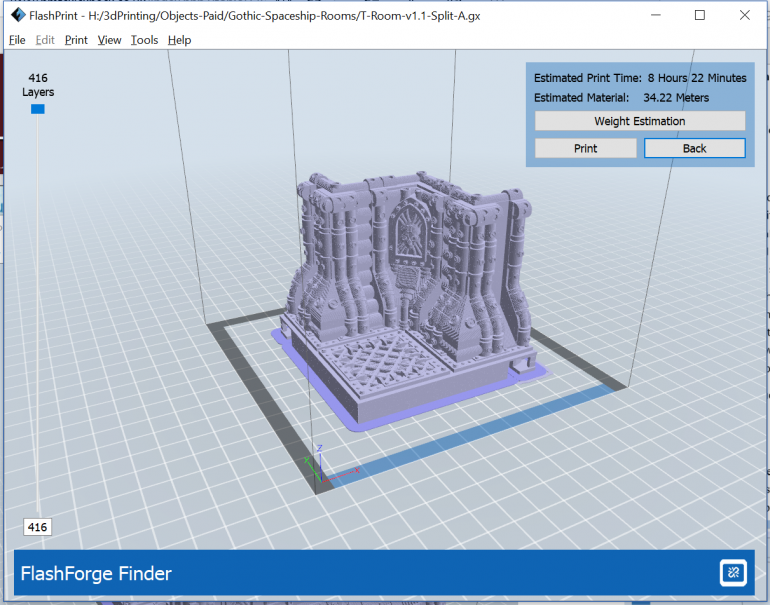 The bulk of the parts are still being printed by the Finder, I’m still getting used to the Adventurer 3, it’s essentially contributed the 3 parts of the room and the doors. 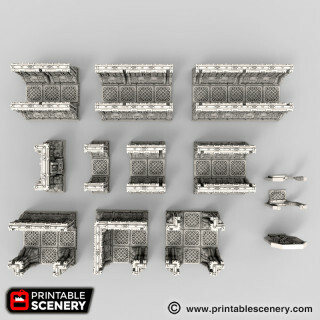 ( I said I would leave these, but they are actually quite good, there are alternative models for open doors and destroyed doors that I haven’t really touched on – I need 18 doors for the layout, this represents many of them (I think there is 9ish printed) I would probably get away with 12 open and 4 destroyed for most games. 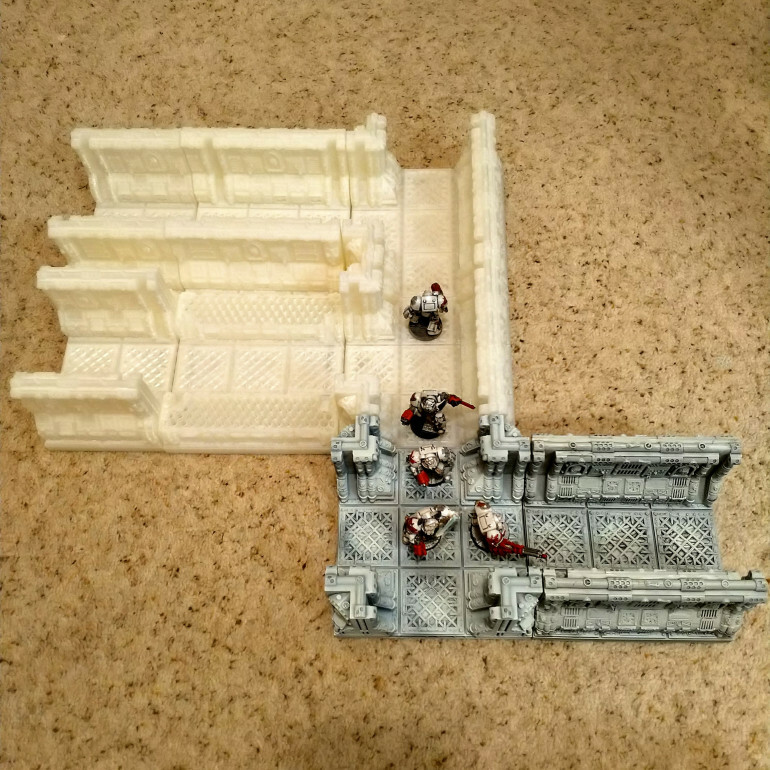 So just a quick update on progress. I now have 8 parts printed and am getting ready to start on the a few of the rooms. 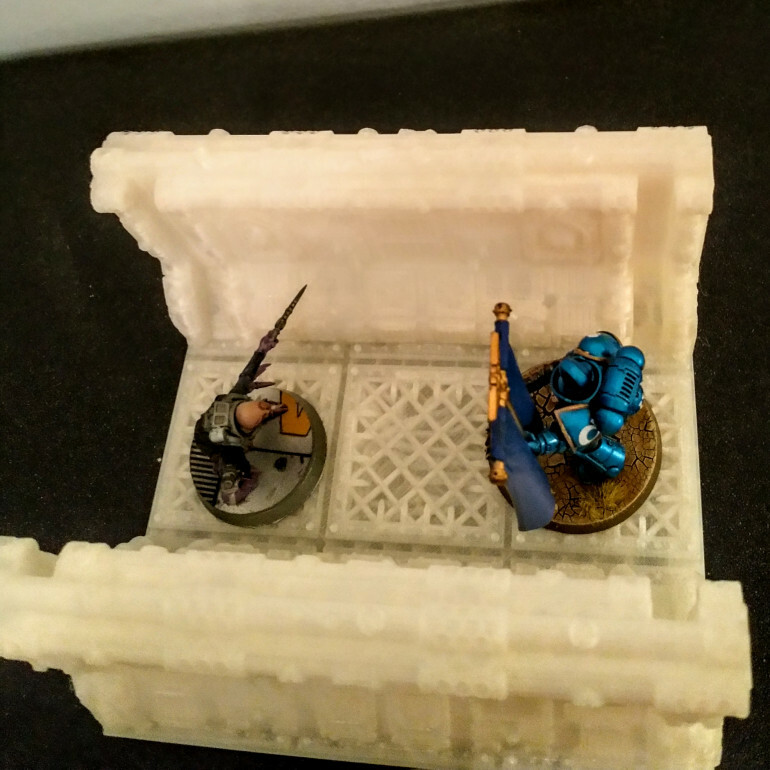 The new printer arrived today so I’m just testing it out with a door print before I get it started on the rooms. 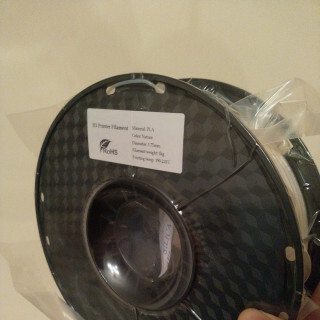 The first thing I’ll need is a 1kg reel adaptor, so I have got a design for that from thingiverse and have started the other printer on printing that out. 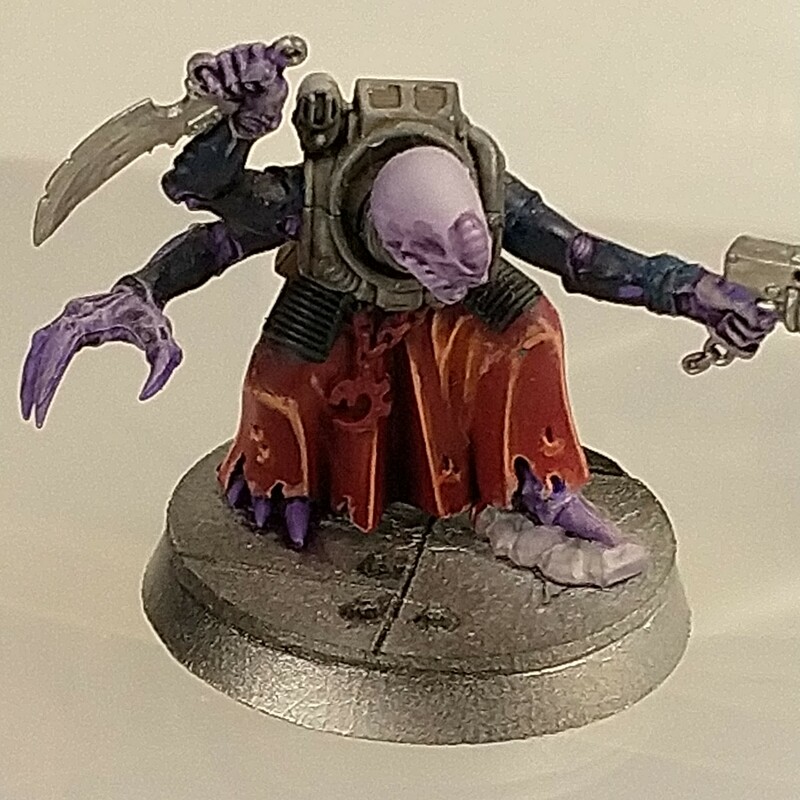 Next stages would be a 50% Grey wash and a white drybrush. 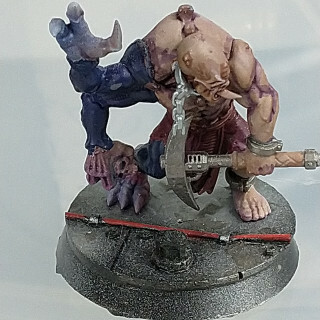 Not sure if it’s light enough though – might go heavier on the Ivory before I do the last few stages. 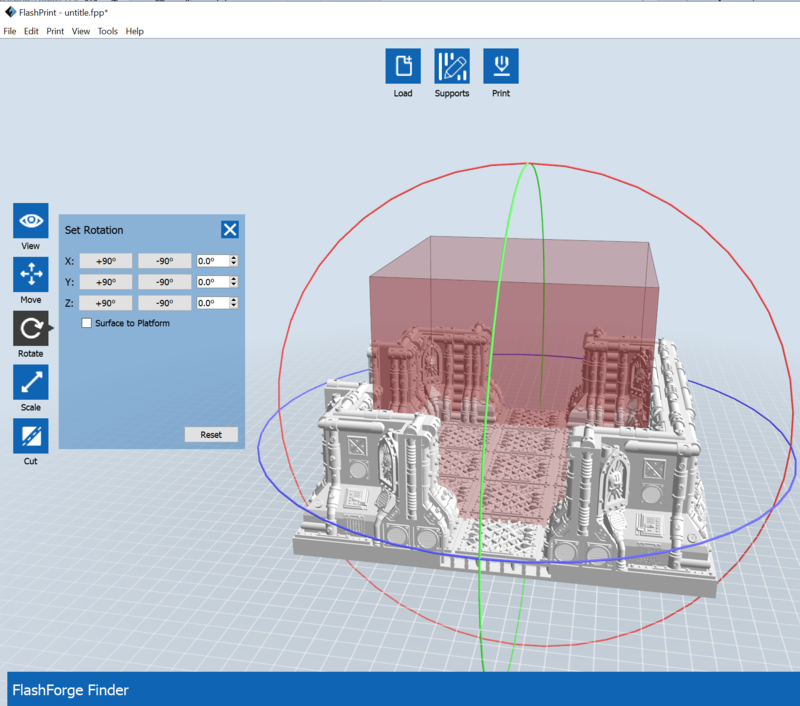 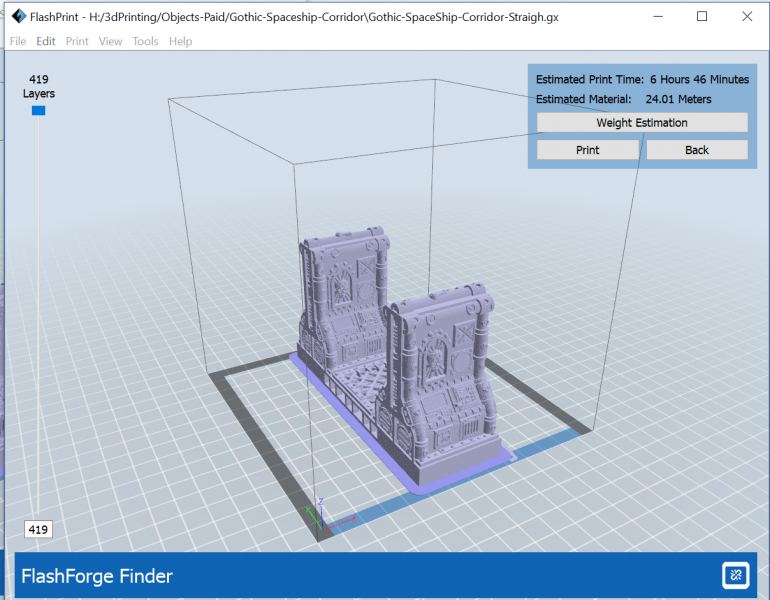 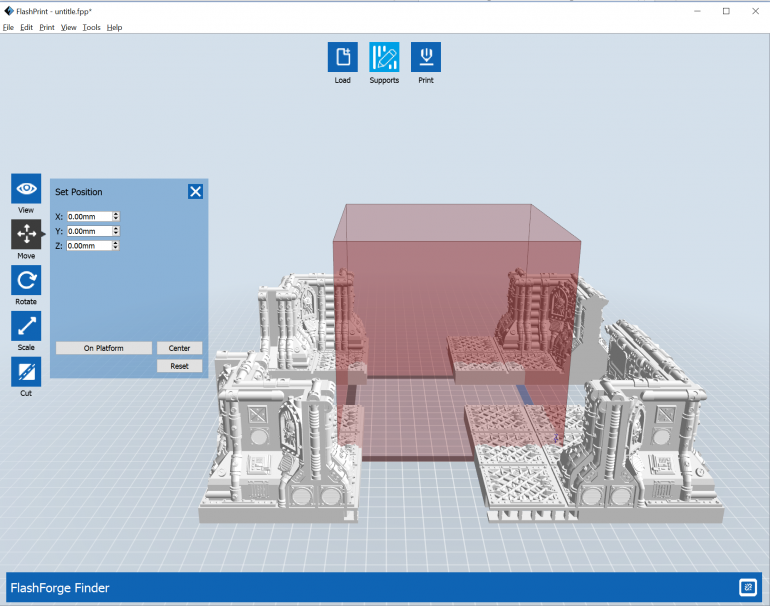 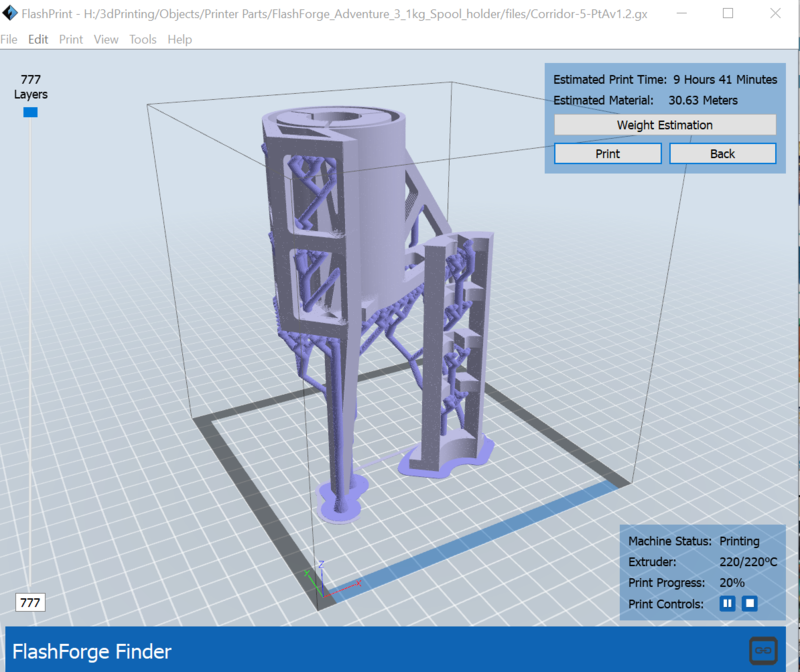 I’ve been considering for a while what the best way to solve the print capacity issues are for terrain printing the Finder on it’s own would probably have to run, 24/7, constantly monitored and fed with stc (opps, I mean stl) files to get close to the desired timeline. 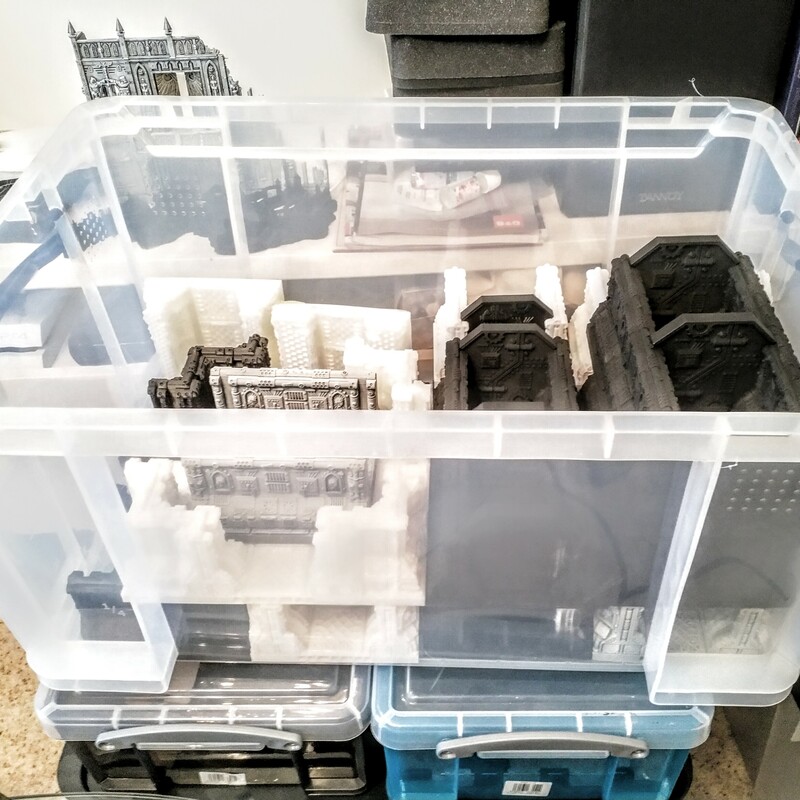 It’s not just this project, during the last one (fantasy terrain board buildings), the rate of producing components using a single printer was a significant project constraint – essentially I’m finding 2-3 months is too long to print the components for a board, and I have generally lost interest by the time the parts are ready. 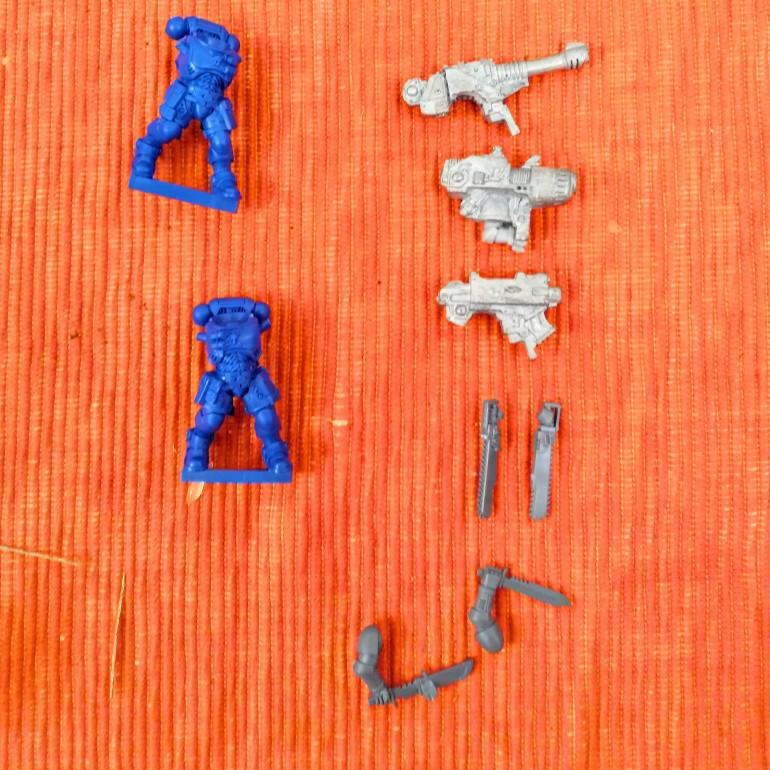 I’ve had a look at commercial options, but they seem geared towards rapid prototyping rather than low-cost wargames terrain production. 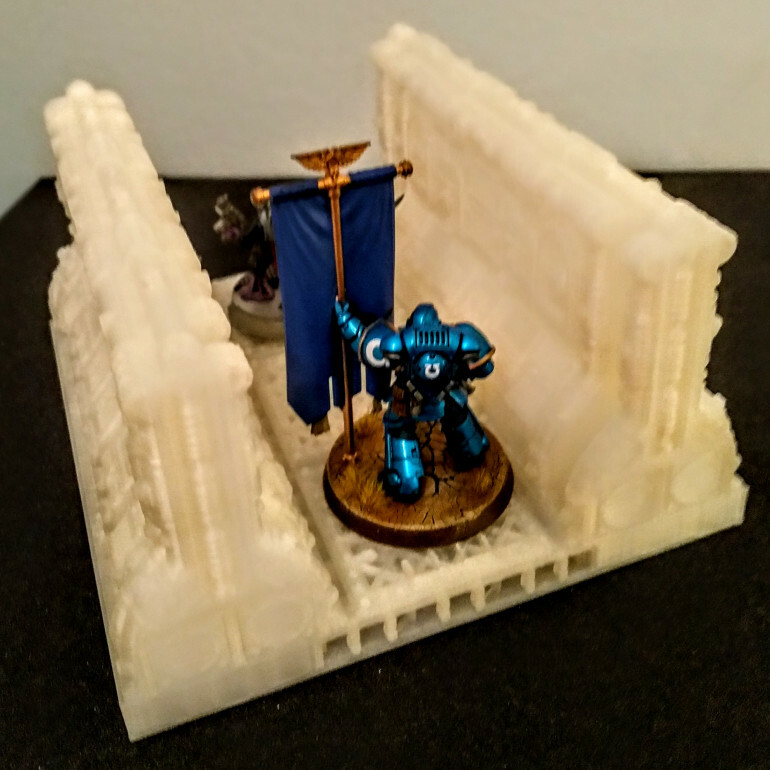 I tried the insta-quotes on a few of the more popular on-line printing websites I founds that most didn’t offer options like Infill or scaling on the site, and most could not handle the upload of stls greater than 50MB easily. 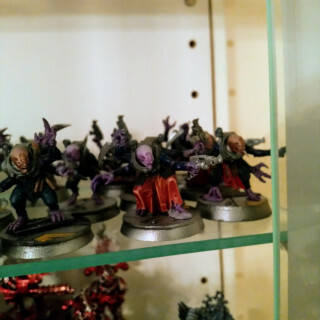 I looked at adding an extra finder, but new ones weren’t cost effective compared with other models and second hand ones on ebay had an asking price too close to the recently discounted new price. 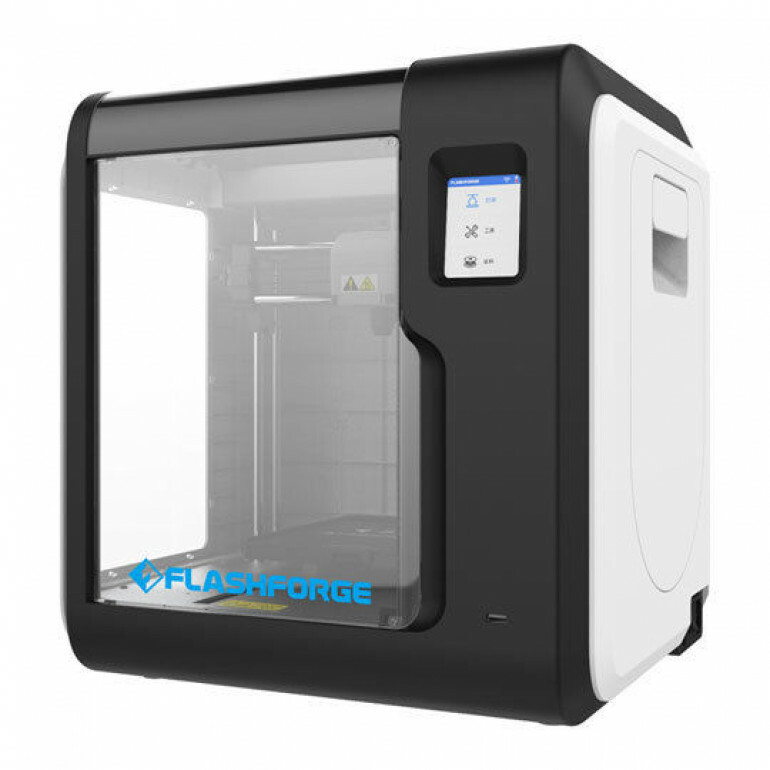 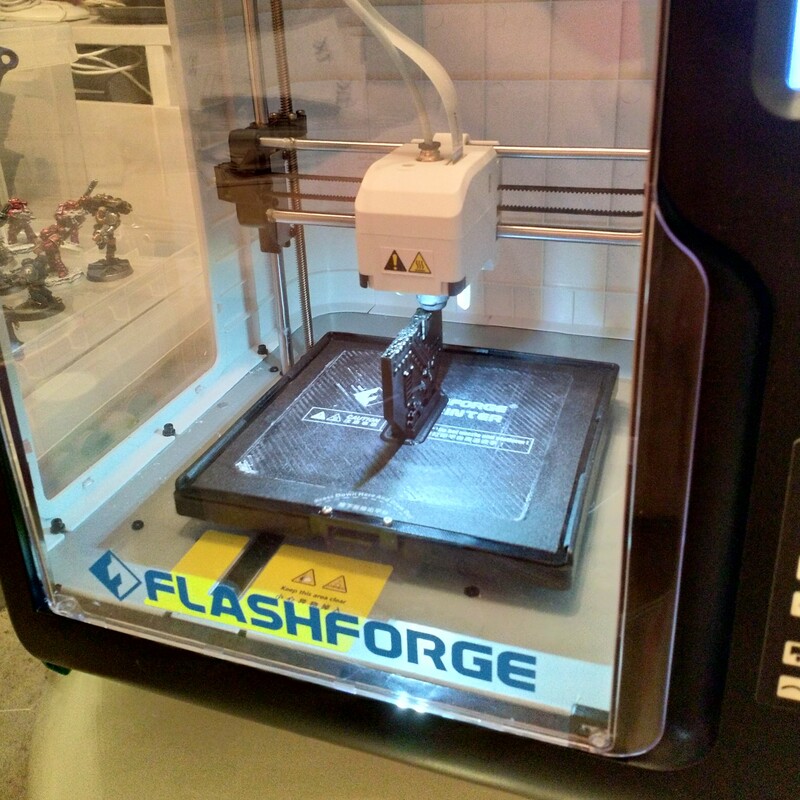 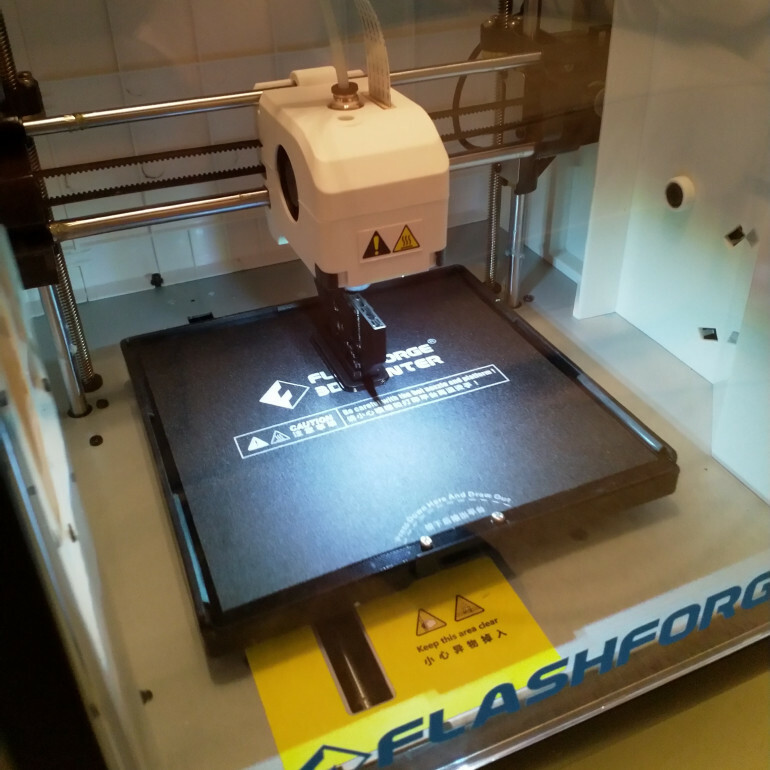 So the decision I made was to add a Flashforge Adventurer 3 (@ £340), with a view to running both and essentially double the rate that I can produce the parts without killing myself keeping them running. This should allow me to build the terrain density that I want at the notice I want. 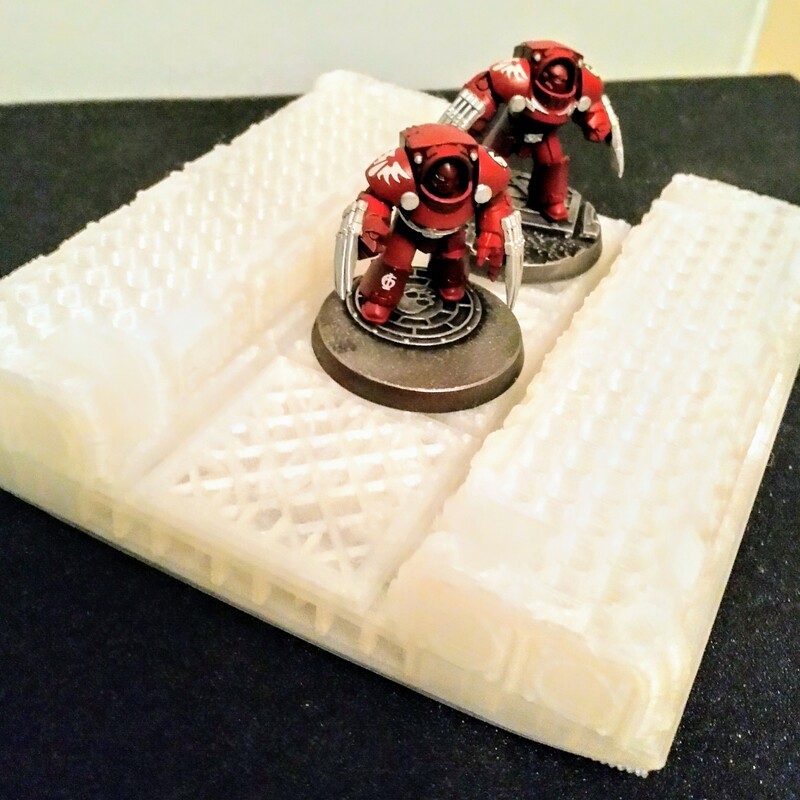 We have our first board piece printed, with a build time of 20 hours. 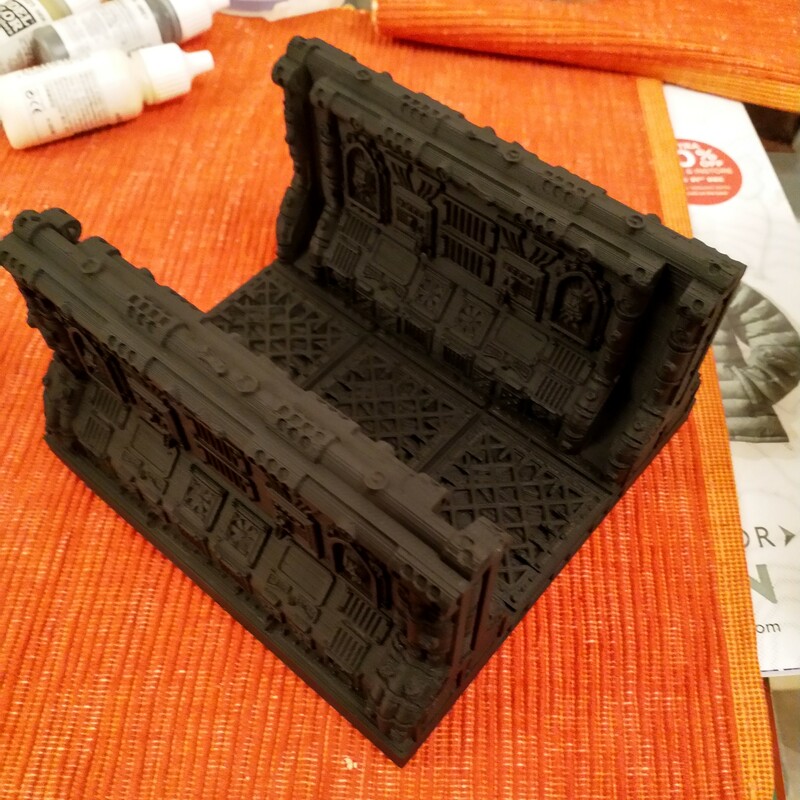 It’s come out rather well. I’ve taken a few pics with minis – the Primaris as the are the better models that I own feature in these shots. I’m really pleased with how the pieces have scaled up – this not only allows you to use 40mm bases, There is also room to get my hands in without demolishing everything. I’ve already got the next piece underway before I put this post together so as not to waste any printer time. To try an reduce the warping, we’ve added a few draught shields to our Finder to see if that makes a difference. 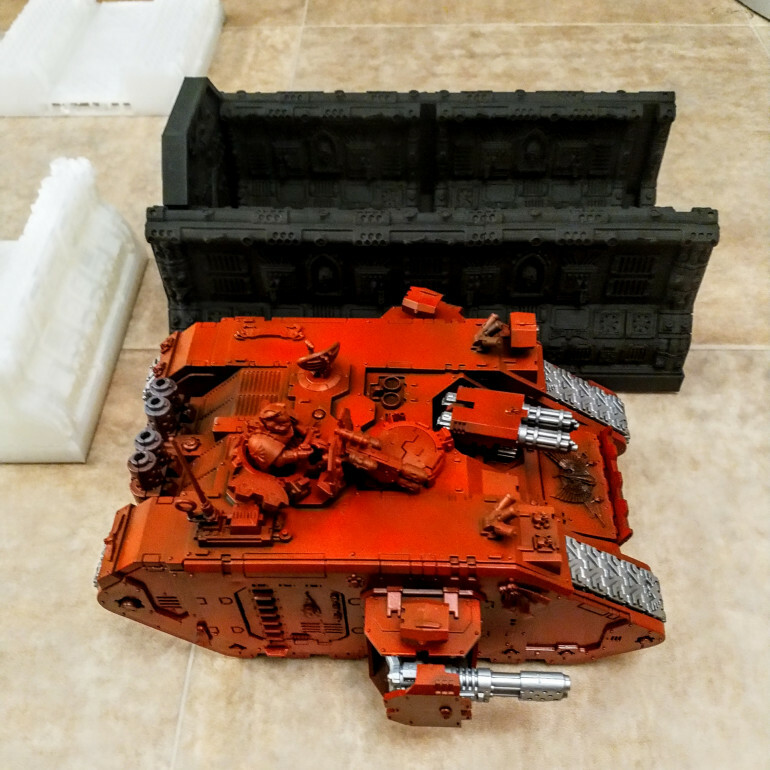 As you can see, only the highest grade parts were used in the this mod and in no way did we stick 2 kitchen towels on the sides with masking tape. 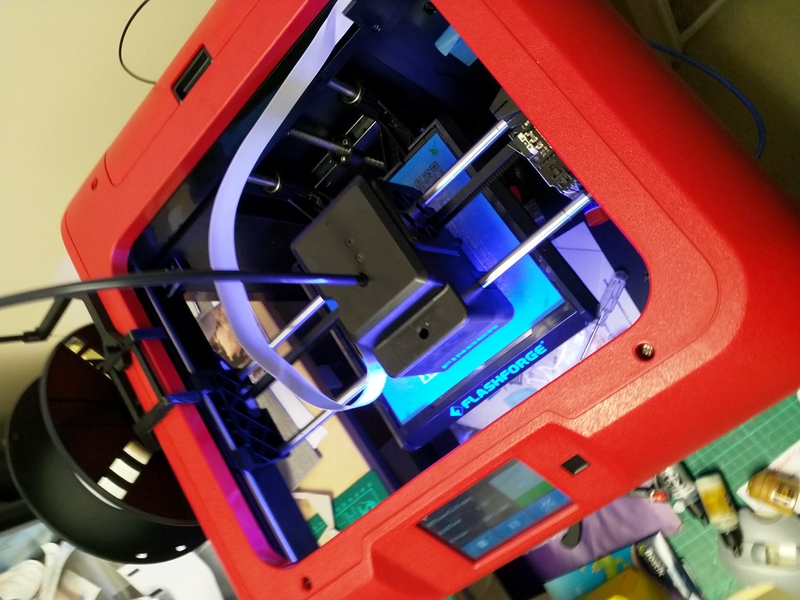 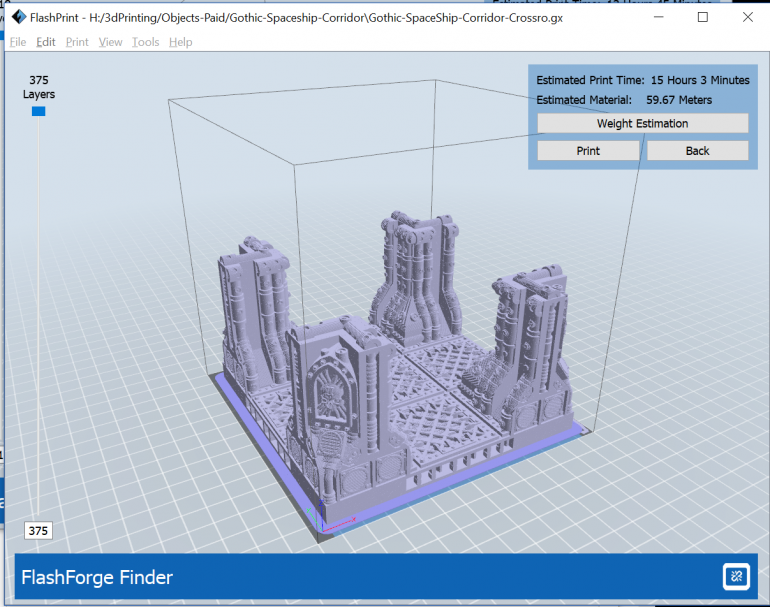 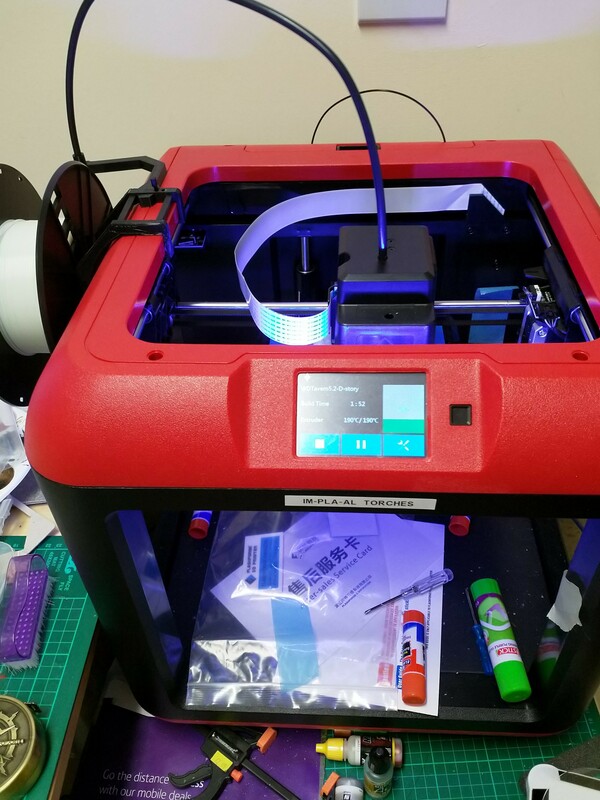 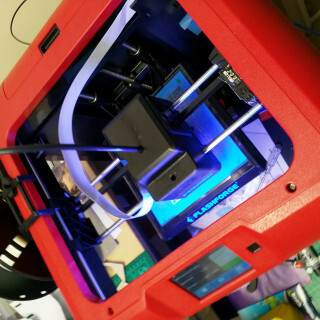 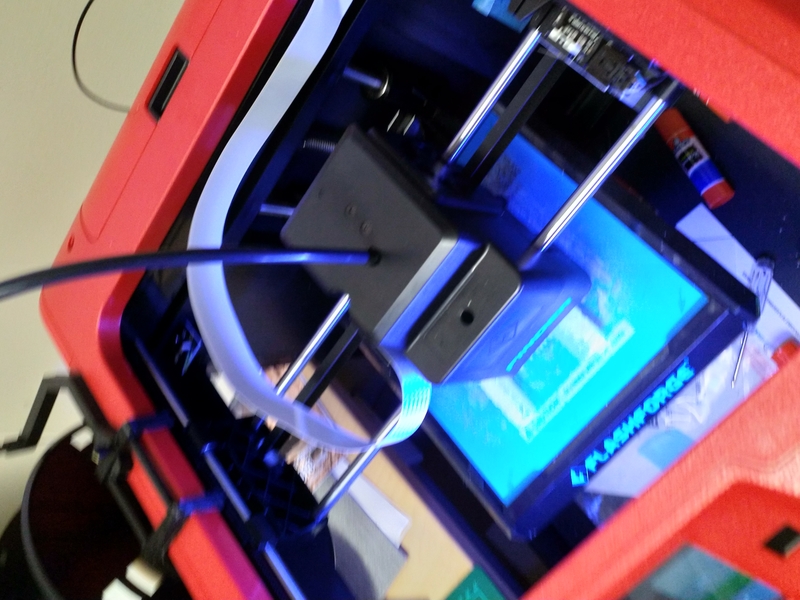 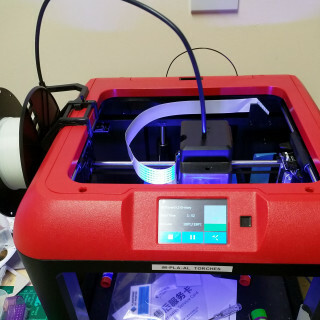 We had an issue with the first print attempt for the 3-square corridor section which failed at 10ish hours – this sometimes happens when you have the usb cable connected and the pc goes into sleep mode – the printer stops and goes immediately off. 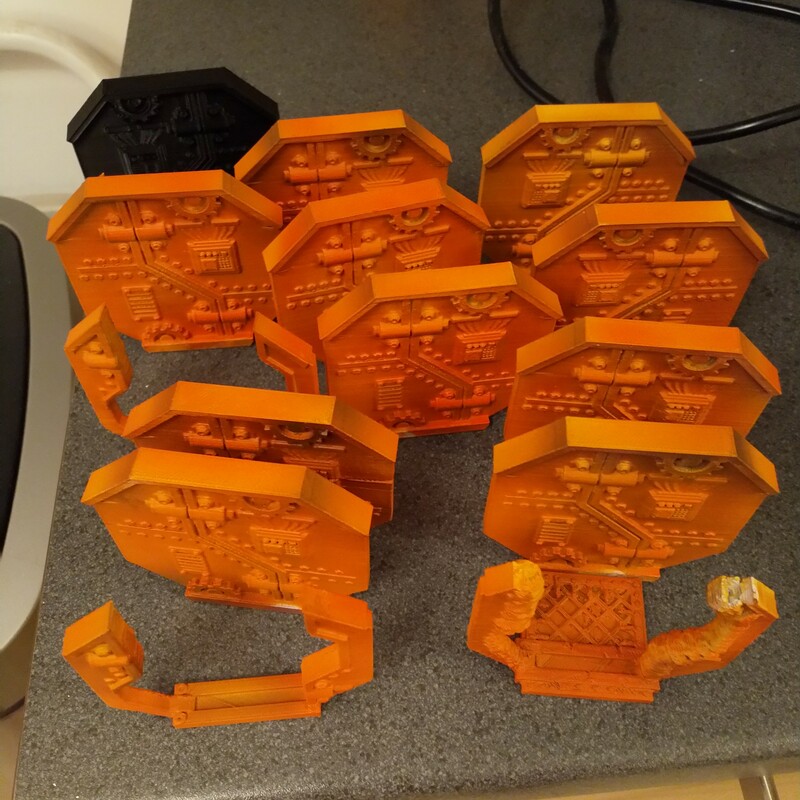 The prints are below at the 140% scale I mentioned earlier and the minis pictured are on 40mm bases. 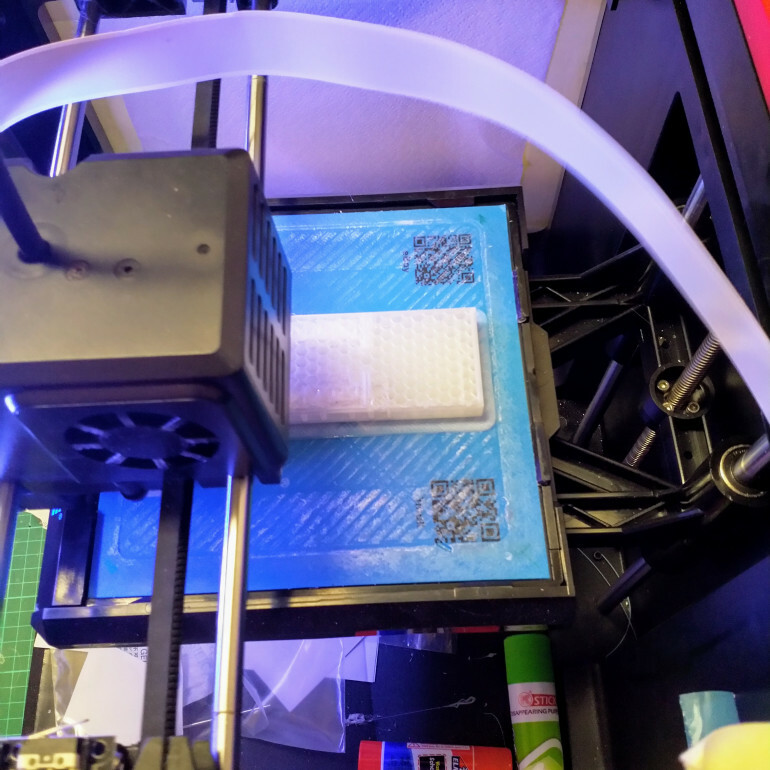 take a bit of care removing the print from the bed in particular the OpenLOCK connector as I broke one of them pulling the print off the bed – running the plastic card underneath should do for this, but I wasn’t being careful as the print failed. 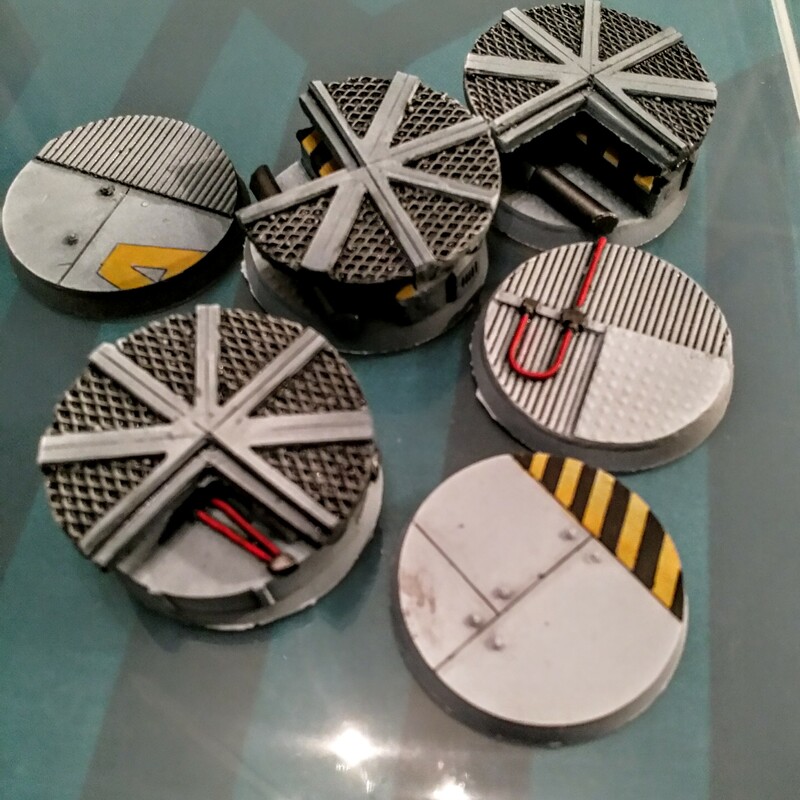 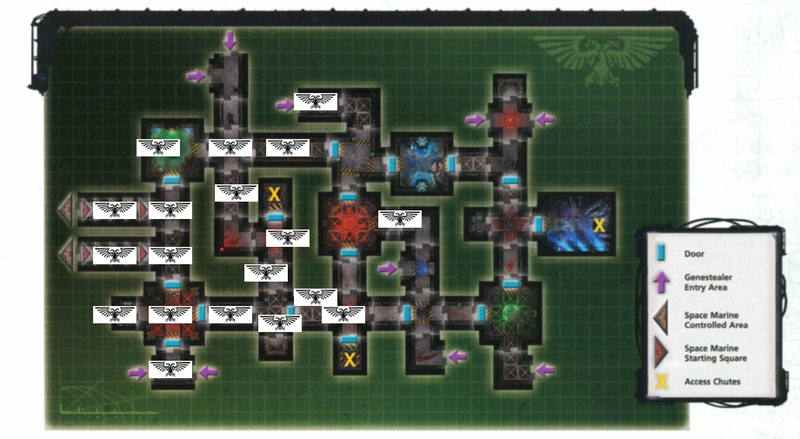 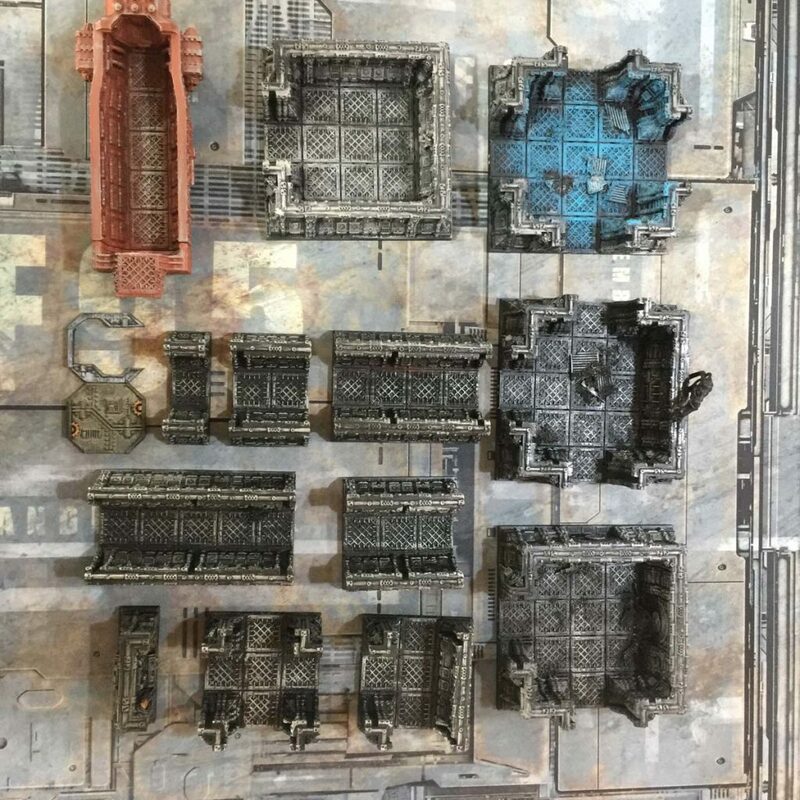 Traditional colour schemes for space hulk are usually in line with the board tiles and are grey / gunmetal. 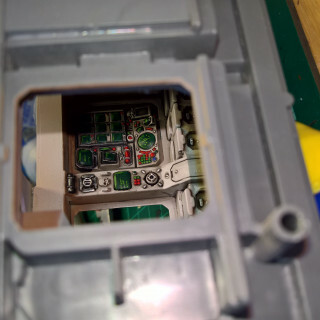 I’ve painted a few vehicle interiors in the last few years with lighter, schemes, with brown’s and creams, built up to white, then a black wash, so I’m thinking that might be an interesting idea. 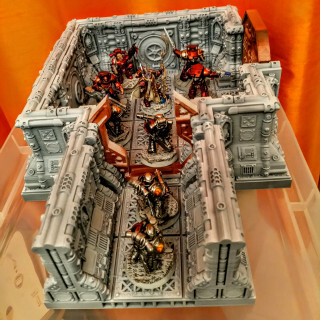 I would probably try out some chipping and light damage to the edges. 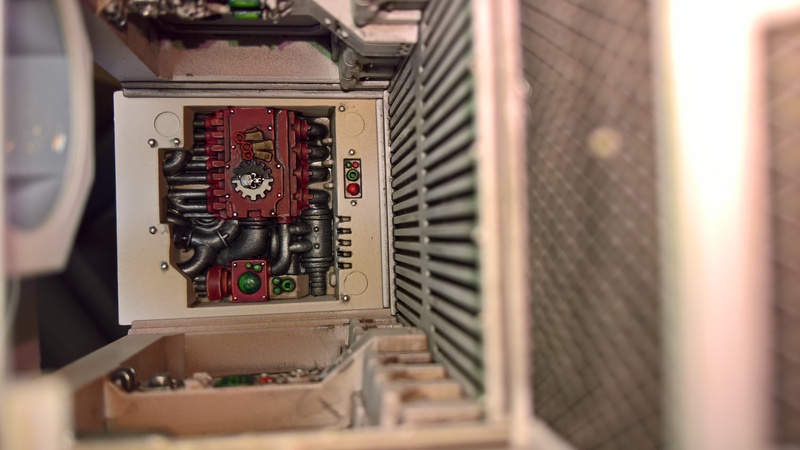 I think I would avoid rust (as it needs water and air and in space, there isn’t really very much of either) but corrosion around pipework and dirty / grime would be cool. Breaking up larger pieces to print on the smaller print bed is relatively straight-forward to do with the bundled software. 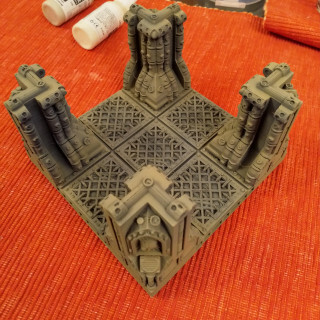 Since we know that 3×3 squares will fit on our print bed we just need to break the room into 4 pieces in a way that makes it easiest to hide the join when we glue the pieces together. With the tiling system that we are using, cutting between the floor squares should give us the best results. 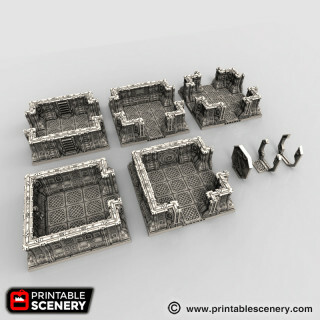 With all the cuts made, the 4 pieces are saved as separate files so they can be estimated separately and printed later. Well, nobody said it was going to be quick – 17 hours will be the longest single part I have printed, but we are underway and that’s the main thing. 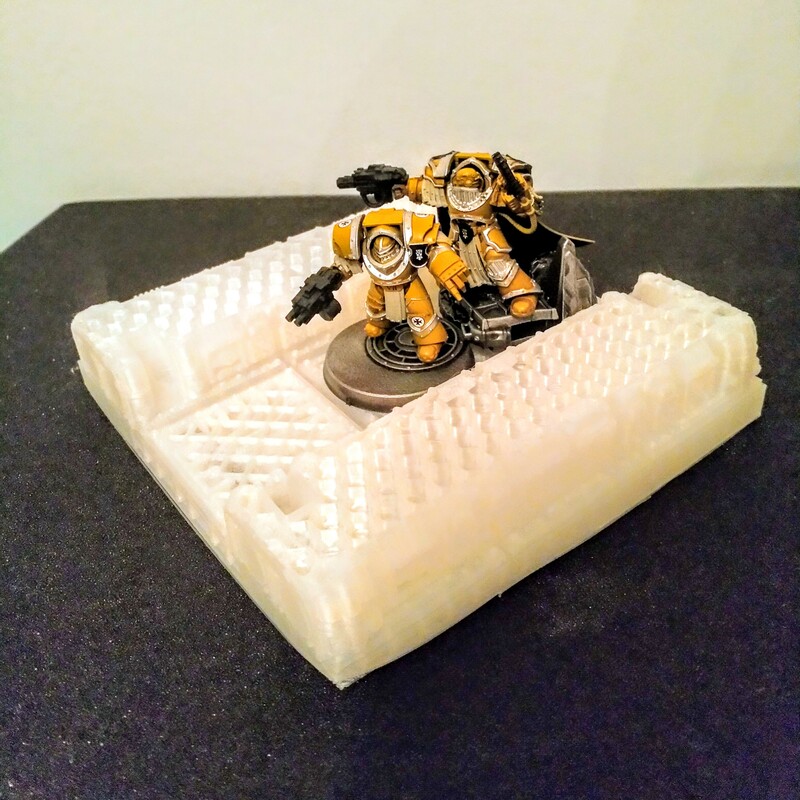 With the raft in place the print bed is entirely consumed with the print. 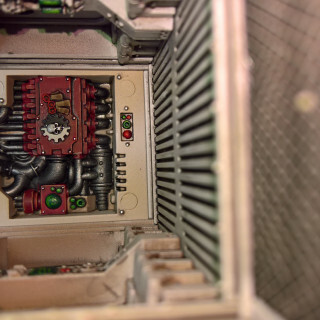 The OpenLOCK Socket is visible on the left side under the floor. 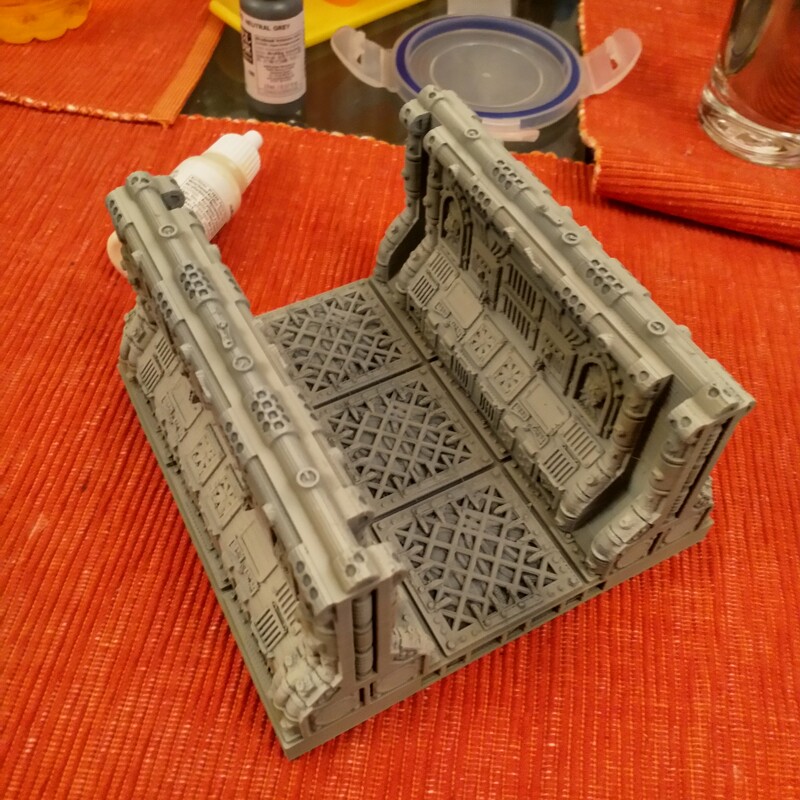 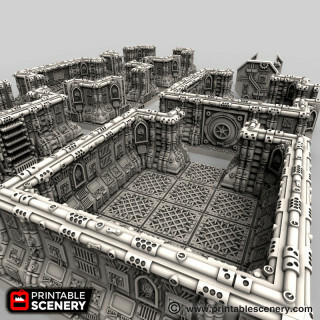 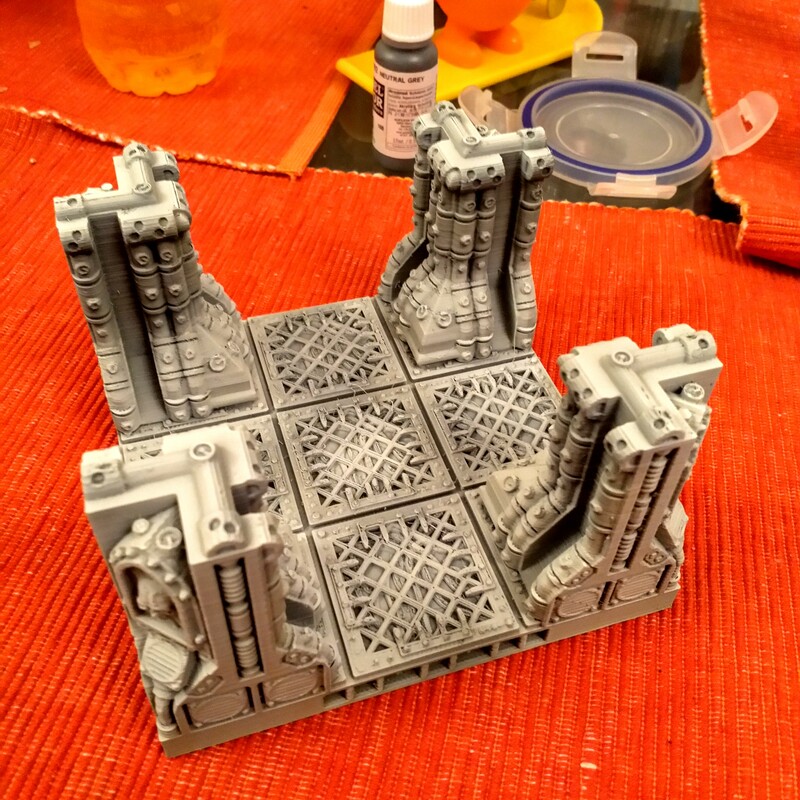 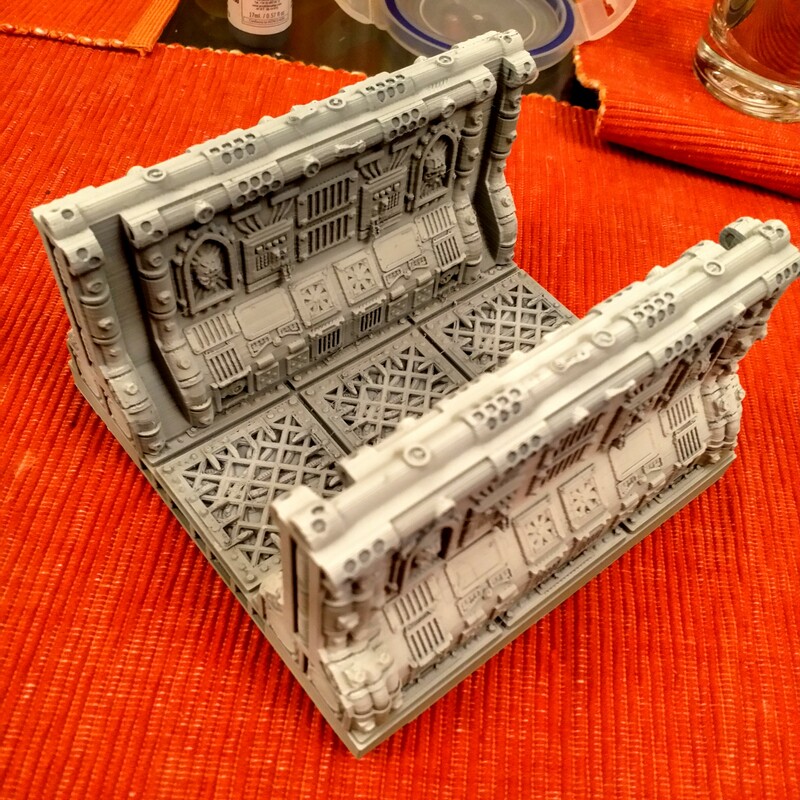 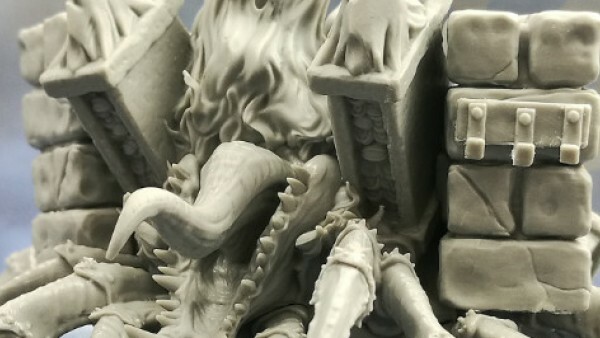 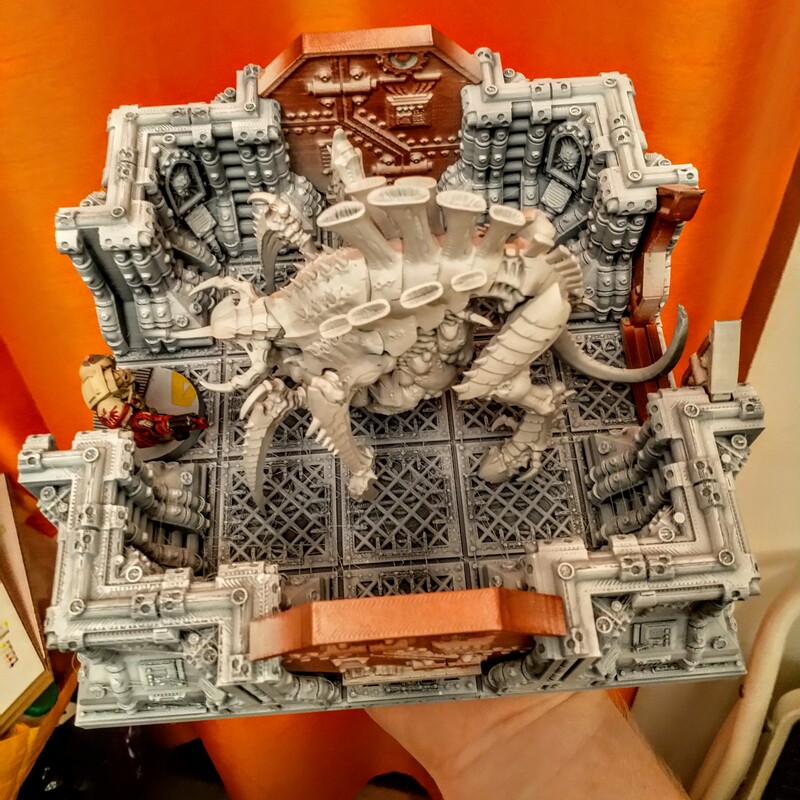 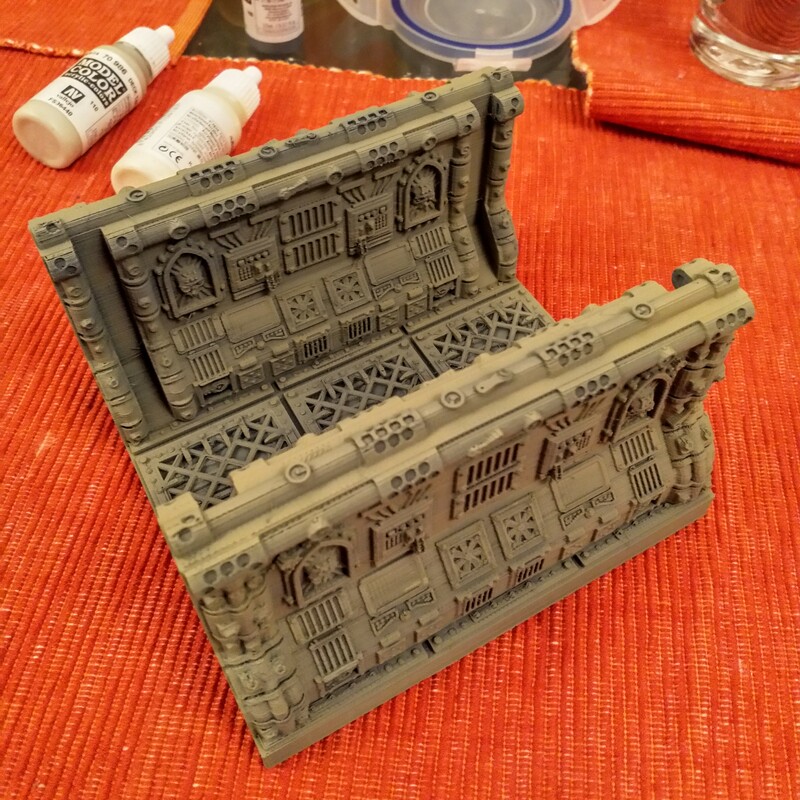 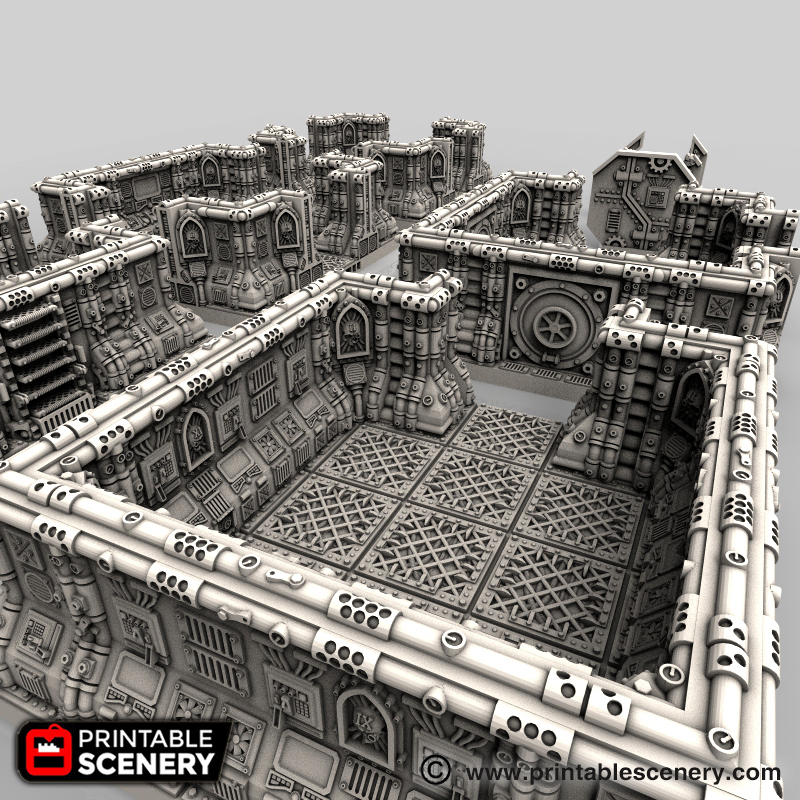 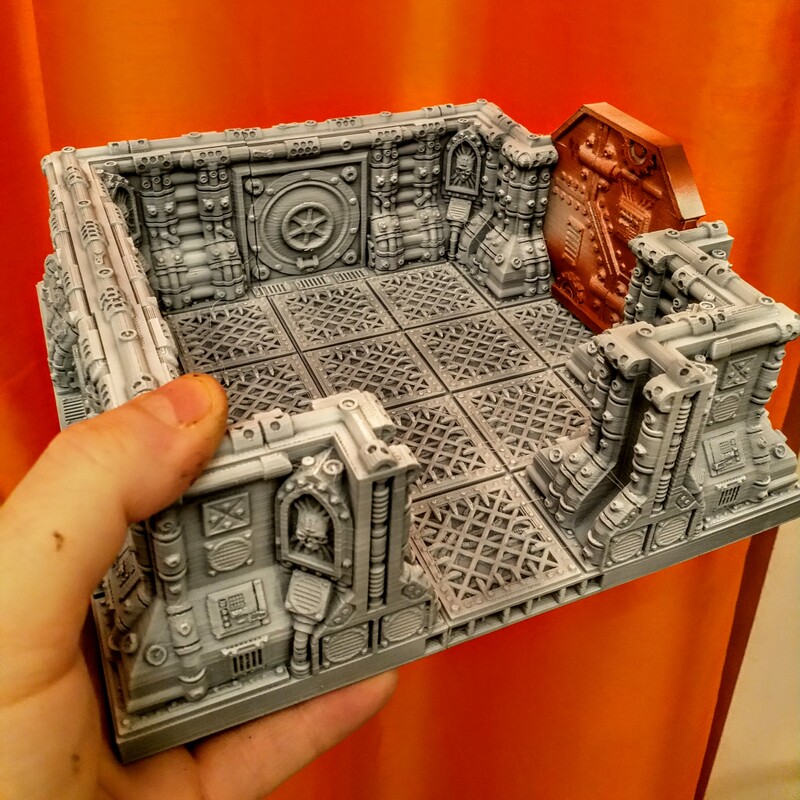 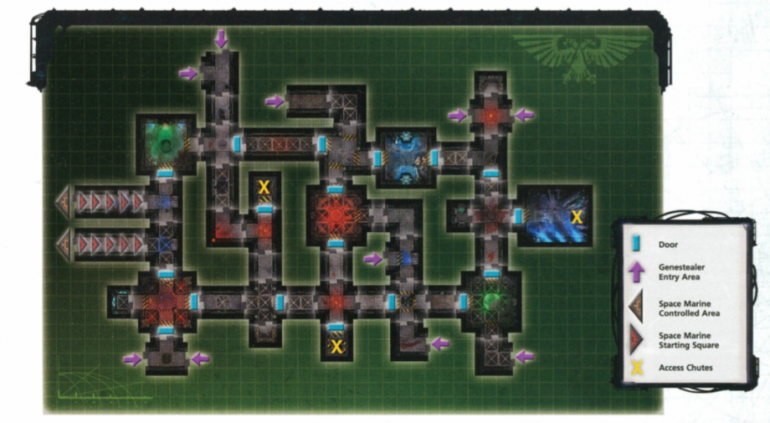 Let’s take a look at the traditionally smallest section for Space Hulk. 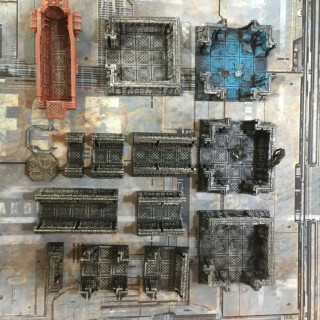 From the Mission Map above, it looks like we are going to need a lot of Pieces. From the very early build estimates it is starting to look as if there isn’t any chance of the board being complete in the 6 or so weeks remaining for the project, so it looks like we’ll need to try and save some time and scale back some of the plans a bit. If we use the original doors from 4th edition, that will save some printer time. 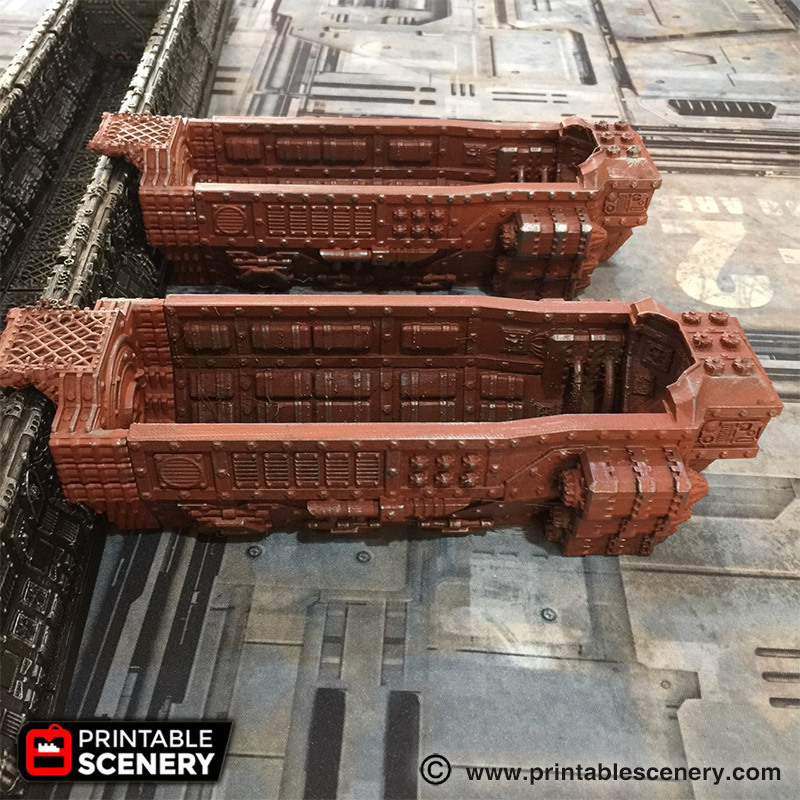 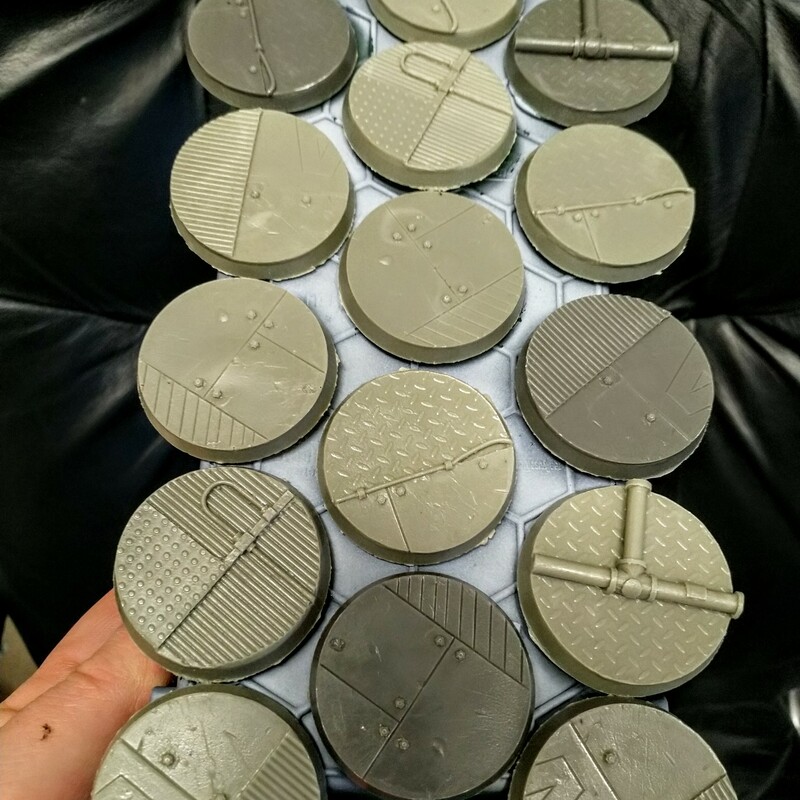 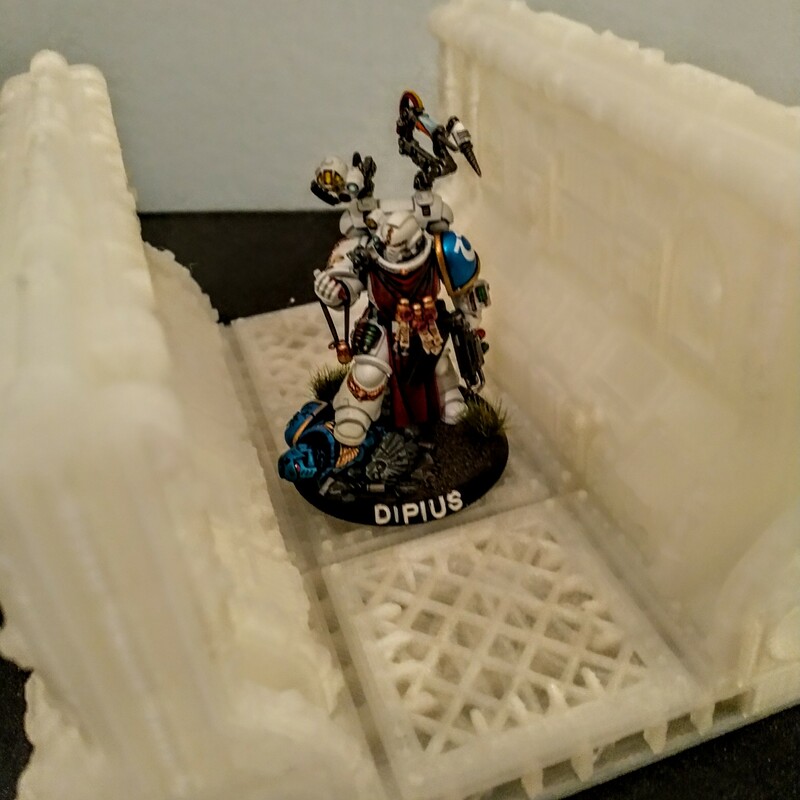 If we use a 2d laser printer, we can print out 140% tiles for the main space hulk board pieces, then we can move the finished parts (however many we end up with) around so that they are always in the active area – this should give the project as a whole a degree of robustness. I have a number of models that are pre painted and ready to go for once the scenery is in place. The bases for the models are from the Sci-Fi Deck range from Dark Arts Miniatures, should anyone be wondering. 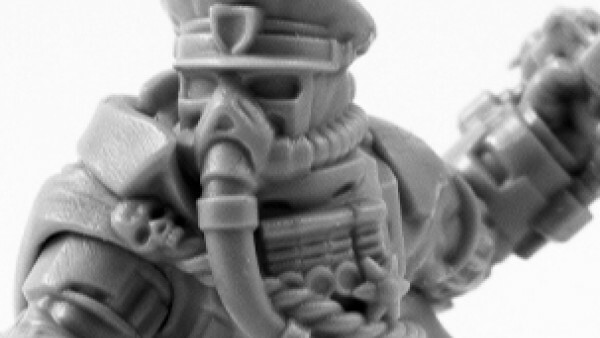 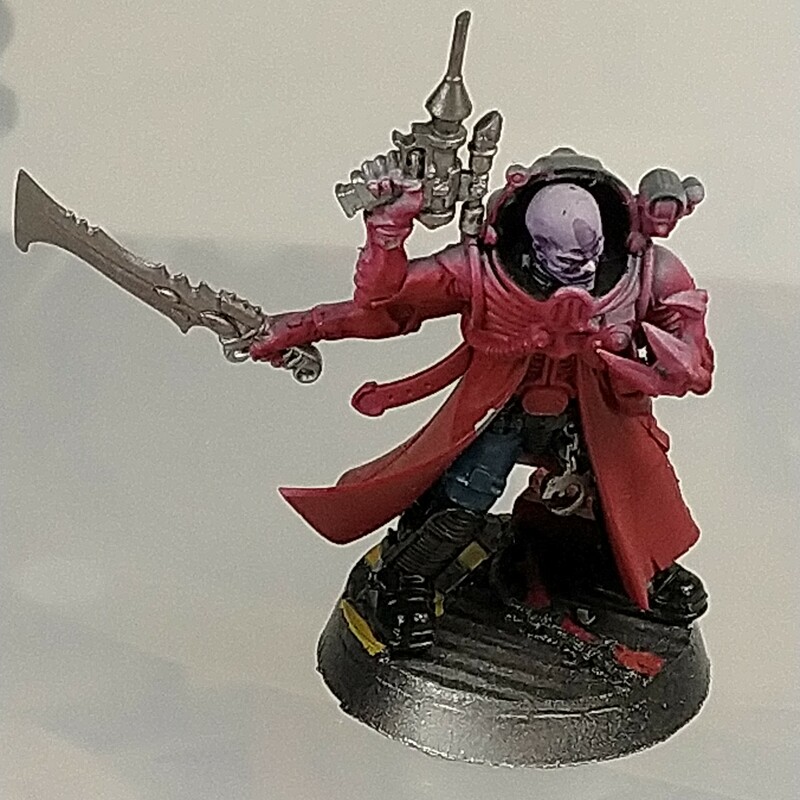 Rules were added for the models included inside the Deathwatch Overkill box in an Issue of White Dwarf – I have tracked down a pdf of these rules and included them below. 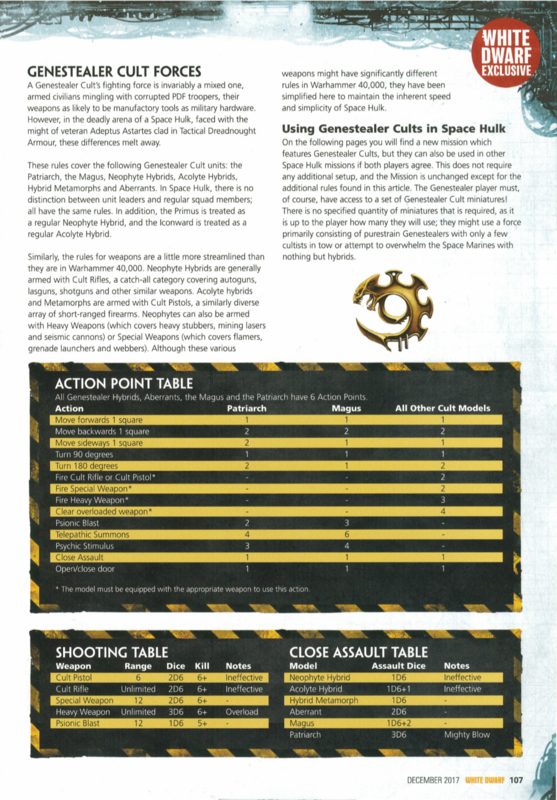 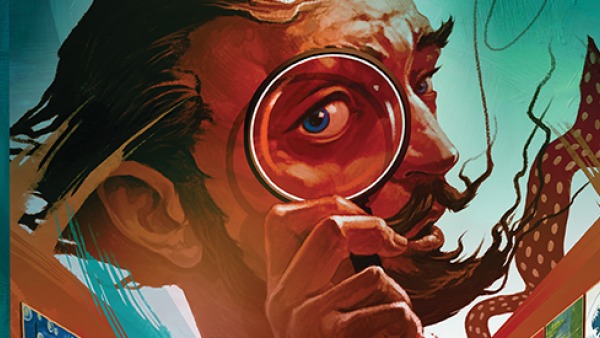 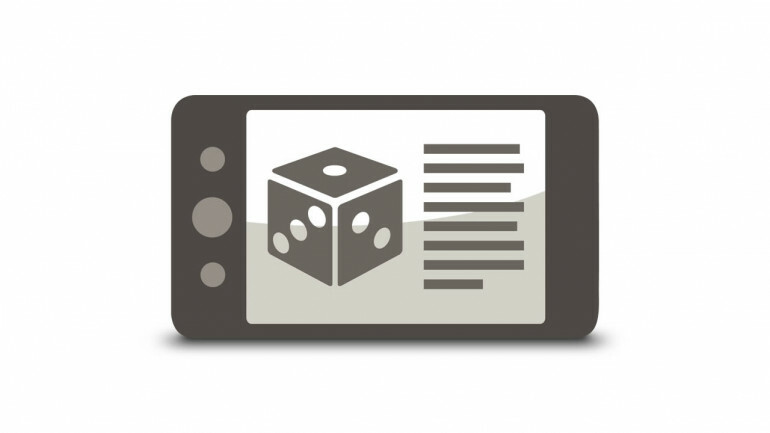 I’ve included a screenshot of one of the pages below – see the pdf for the complete rules set. 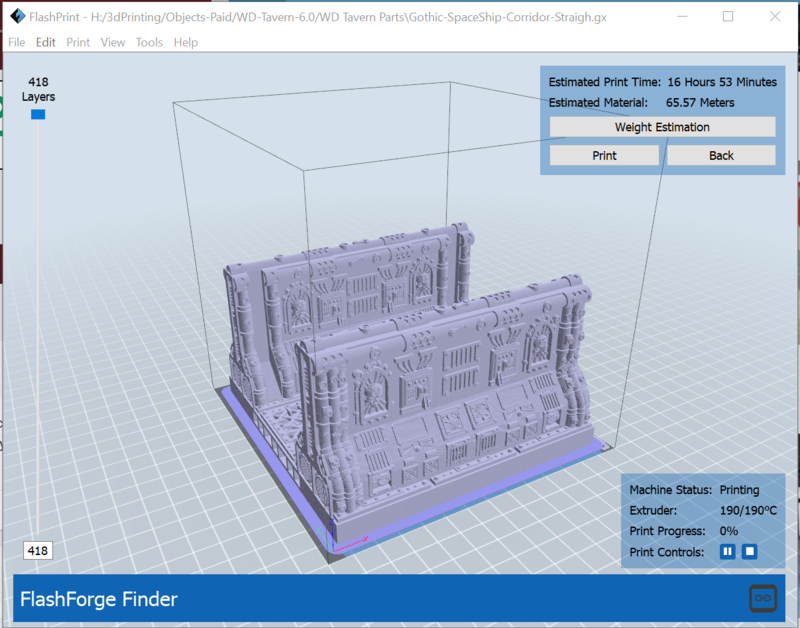 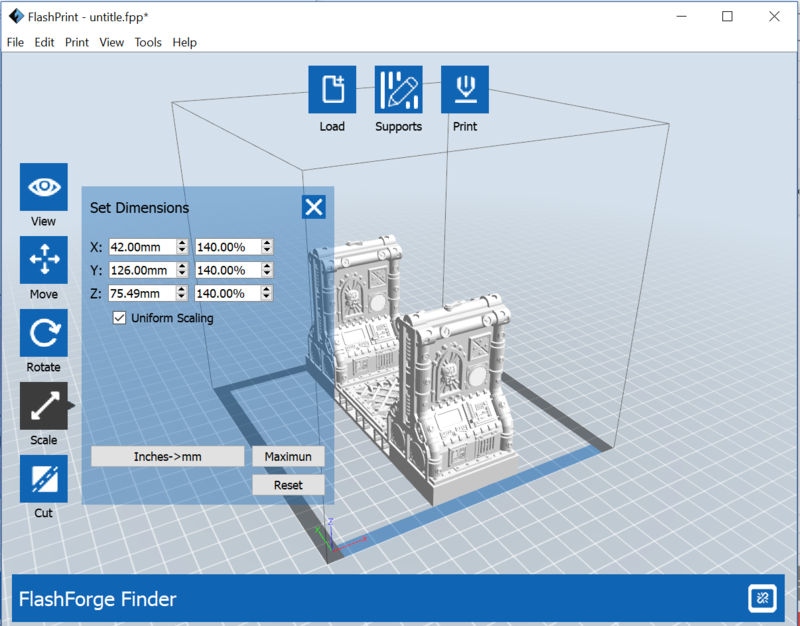 The finder has a 140mm x 140mm (unheated) print bed and prints using PLA only. 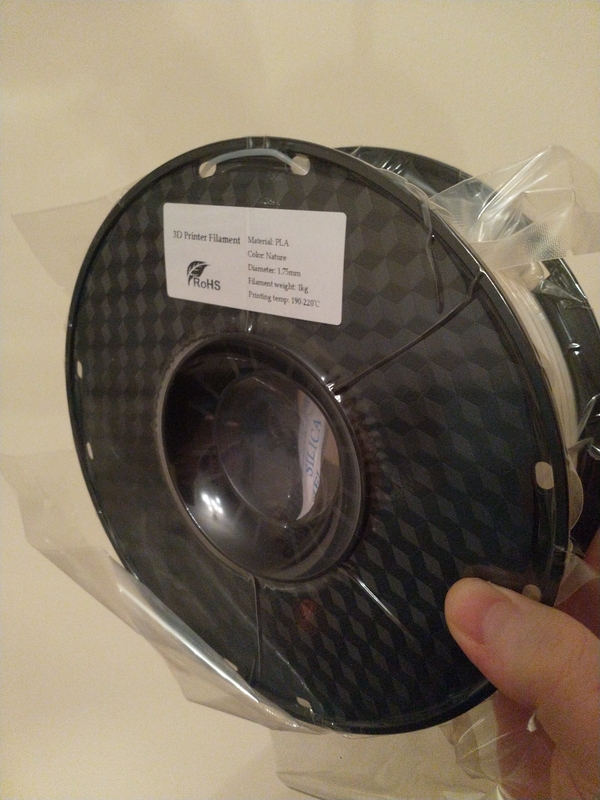 The only modification that has been made is that an external printer reel has been added to allow me to use the 1kg reels that I can get off Amazon Subscribe and Save. 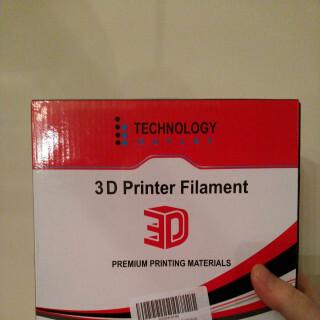 I’ll be using natural white PLA. 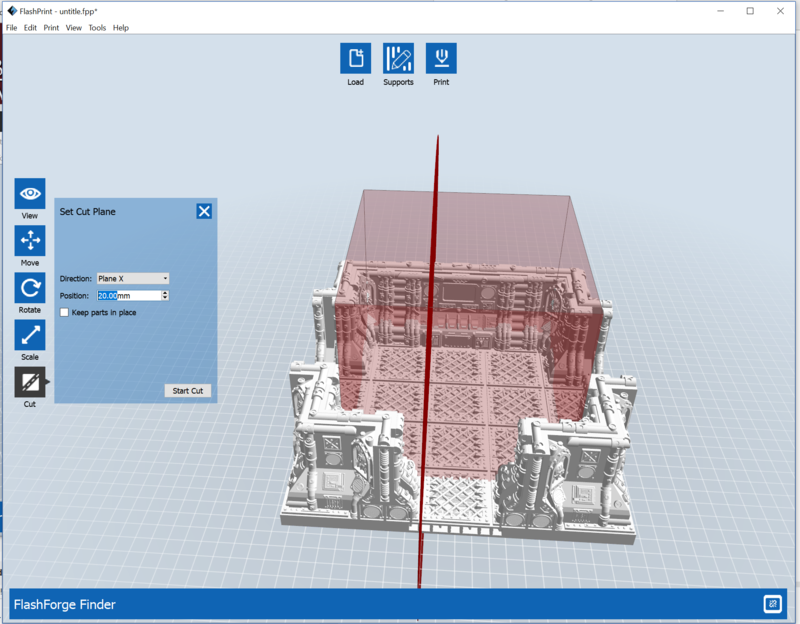 In terms of the printer settings, I am printing with a raft, and a temp setting of 190°C and the standard infill of 10%. 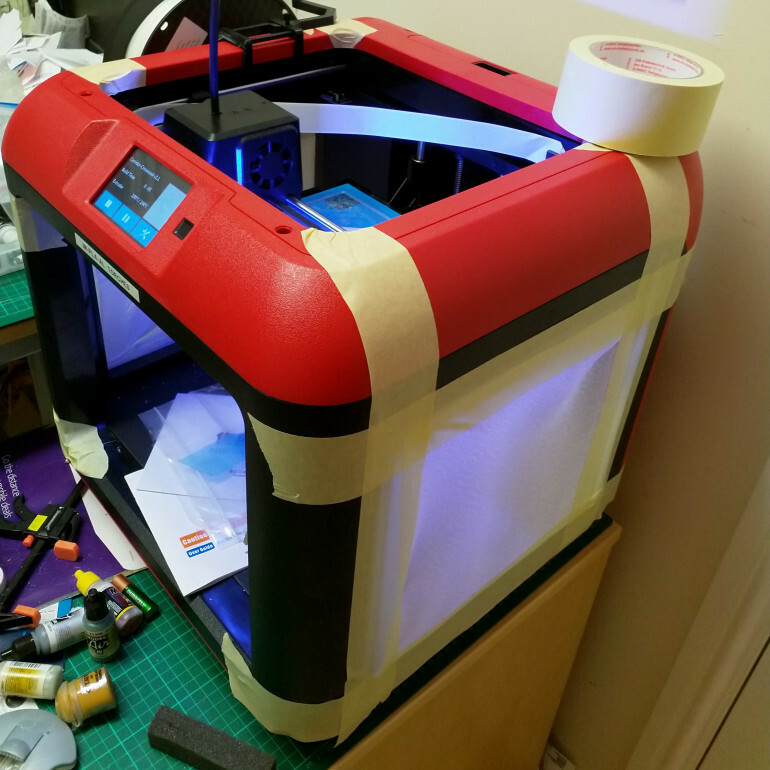 Cutting down the temp from 220°C as this helps reduce warping. 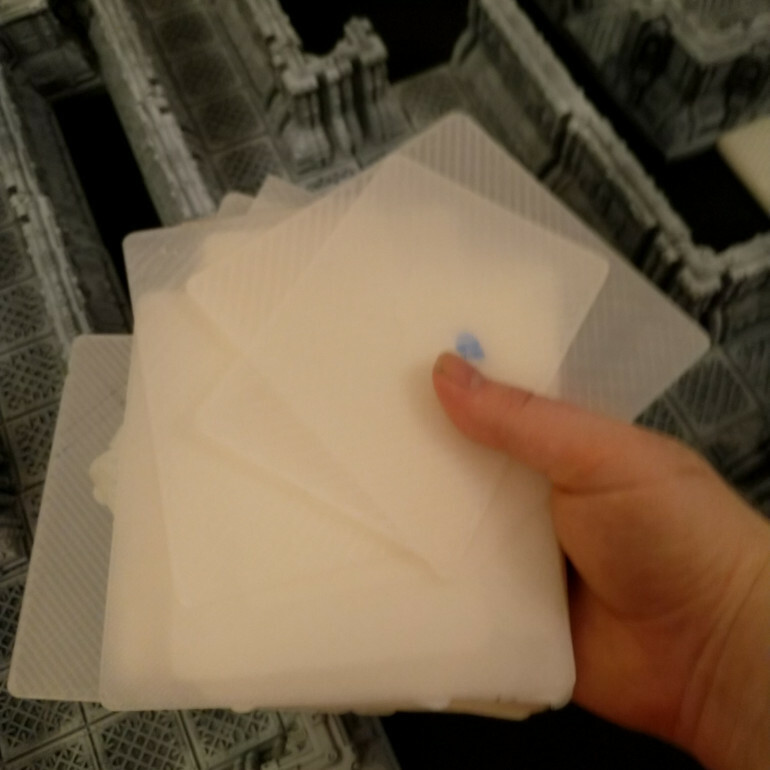 ( a small degree of warping is ok – it usually just affects the outside edge, not the inside, so you can just fill with milliput. 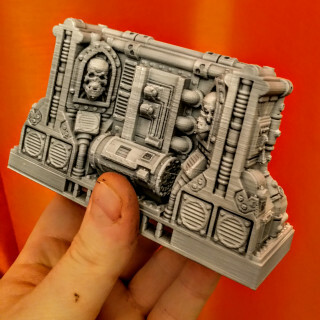 I use the old loyalty card to prise the print from the bed without scratching the build surface (I did already scratch the surface while using a scalpel – this is to stop it getting worse until I can get a new build surface at a not ridiculous price). 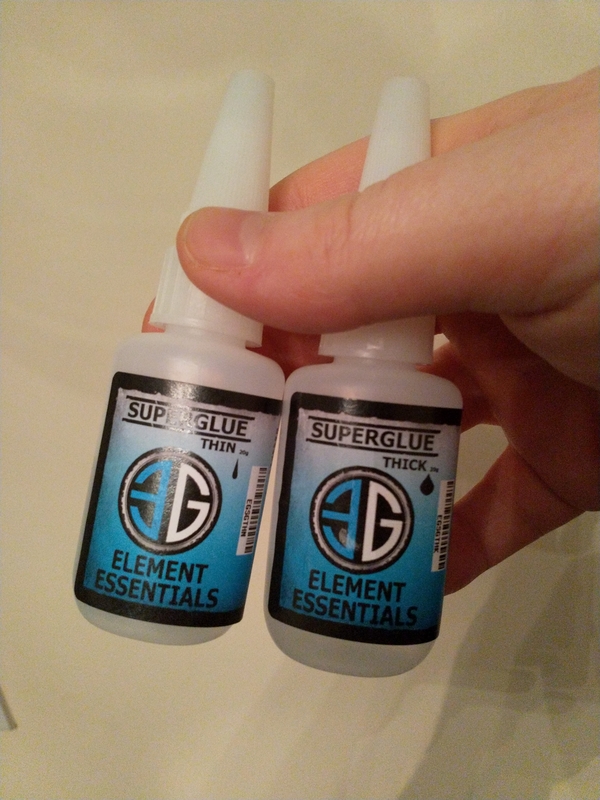 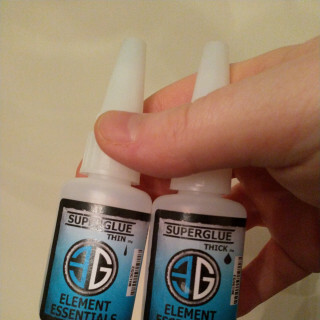 Thick and Thin Superglue – The thick stuff really helps gluing the big blocks together, then you can fil the gaps using the thin stuff for extra rigidity. 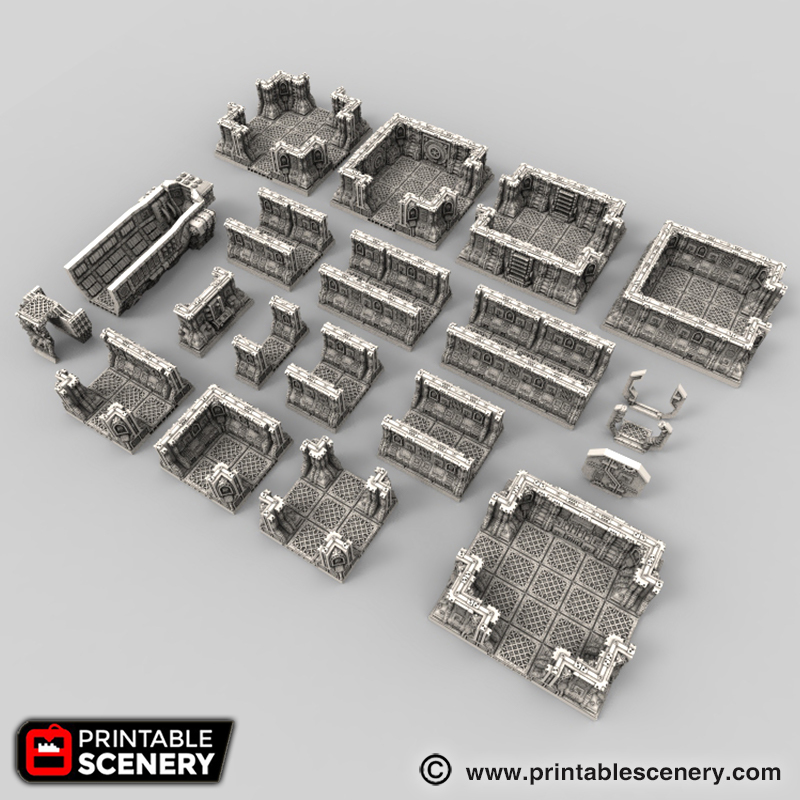 I used models from Printable Scenery with my fantasy terrain project and have printed 10 buildings for that using their models. 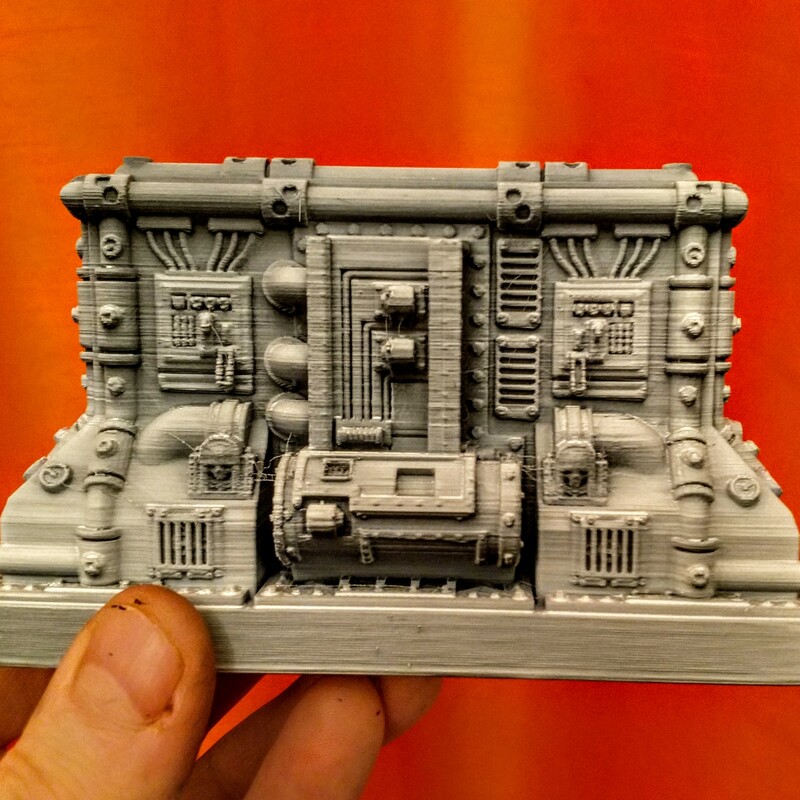 I’ve found the models I’ve already used from Printable Scenery easy to get going with, the models thus far have printed with just a brim and no need for support structures which need clean up or a raft, so I’m happy to continue with this. Also worthy of note is the extra support for small printers, with extra copies of the objects pre-cut to work with smaller print beds – this is useful for me as it meant that I could print the objects without having to learn how to slice them up (though this is actually pretty easy with the software that comes with the printer) . 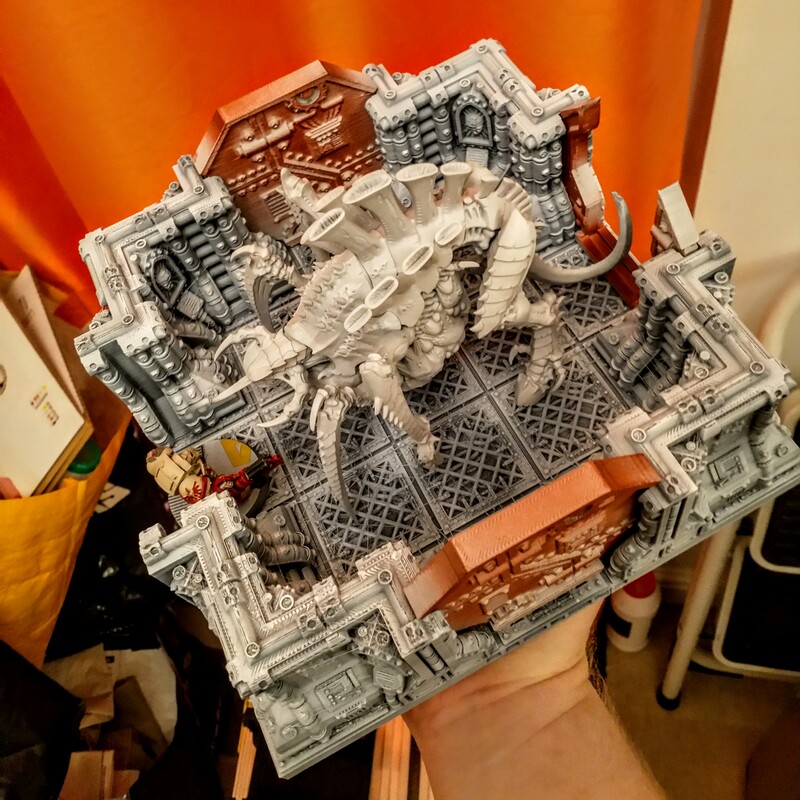 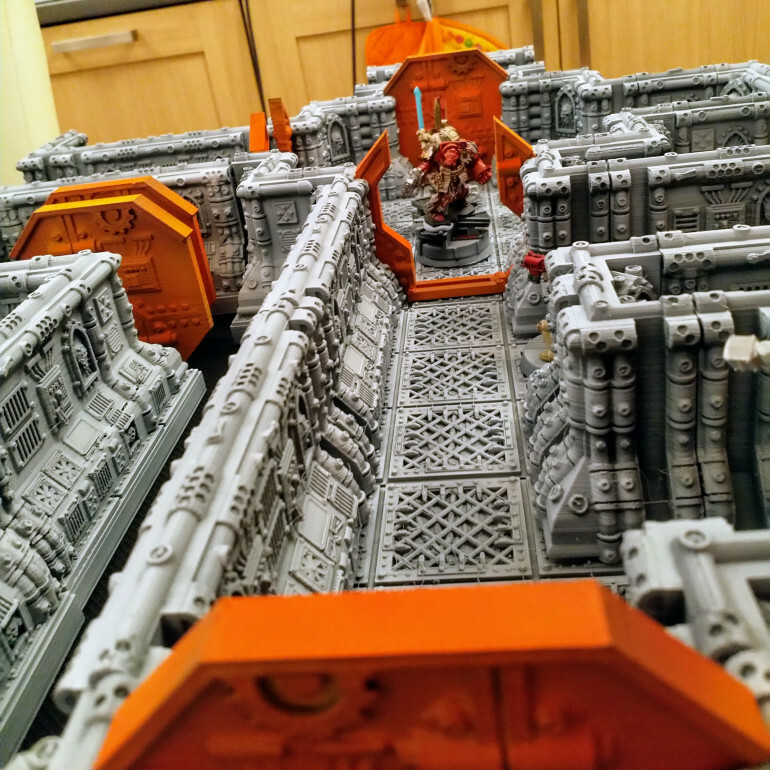 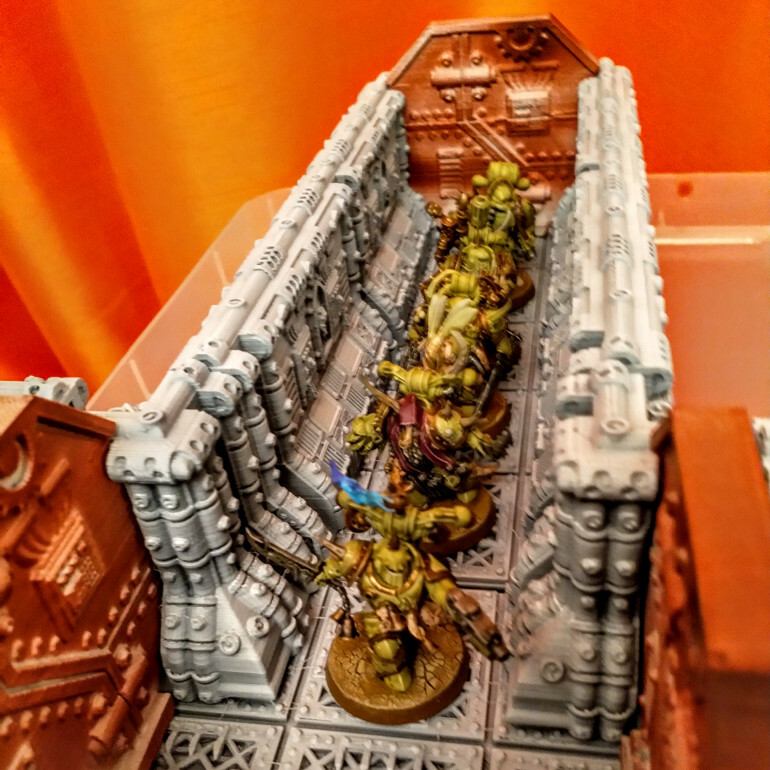 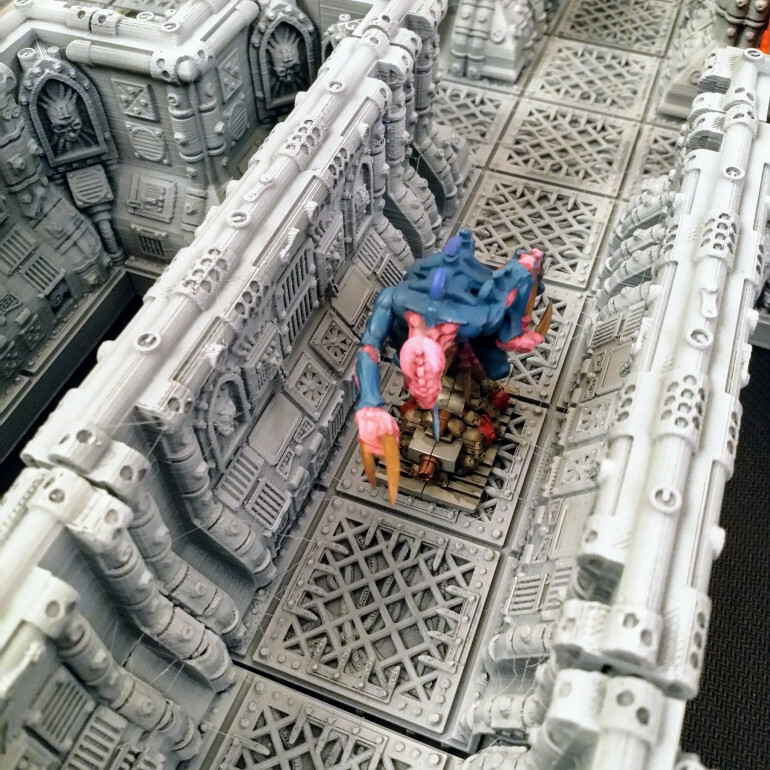 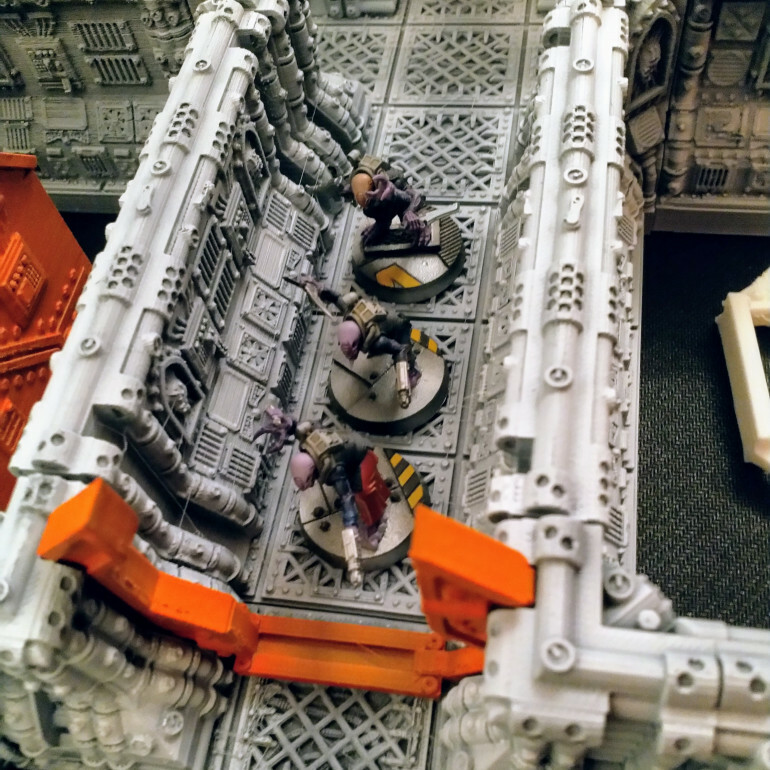 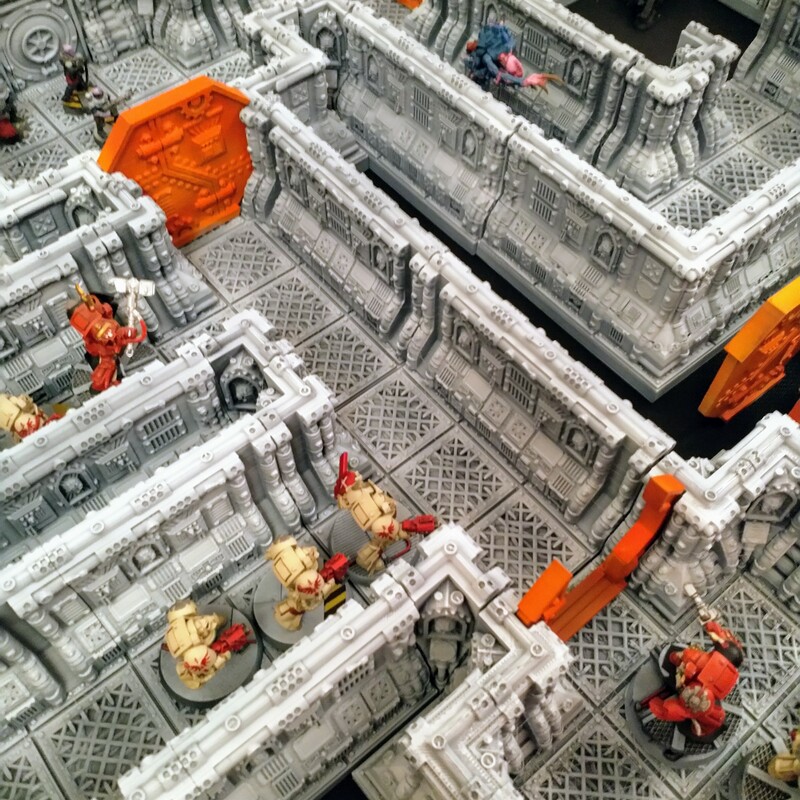 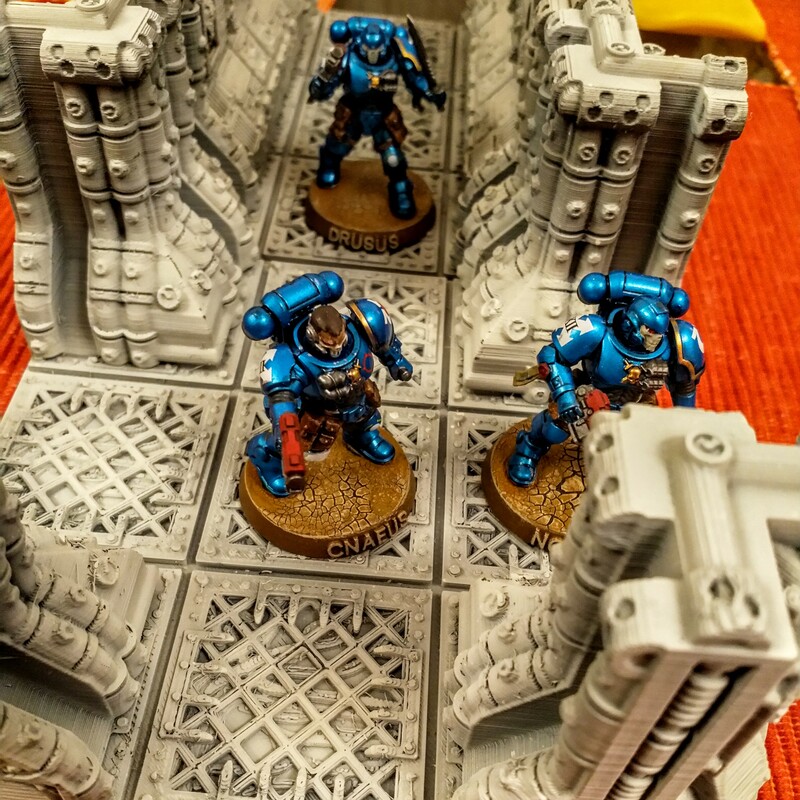 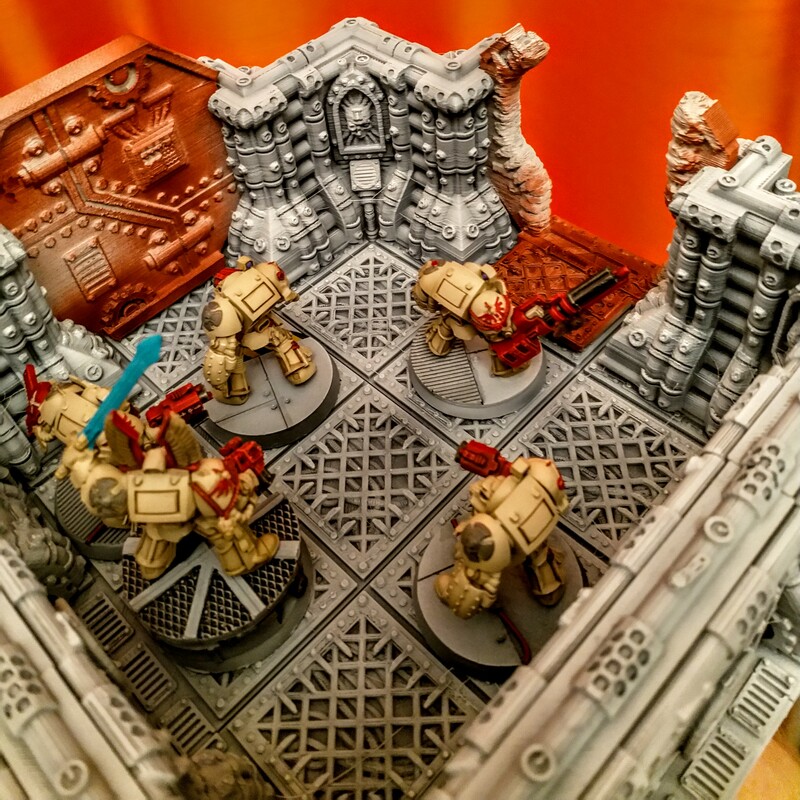 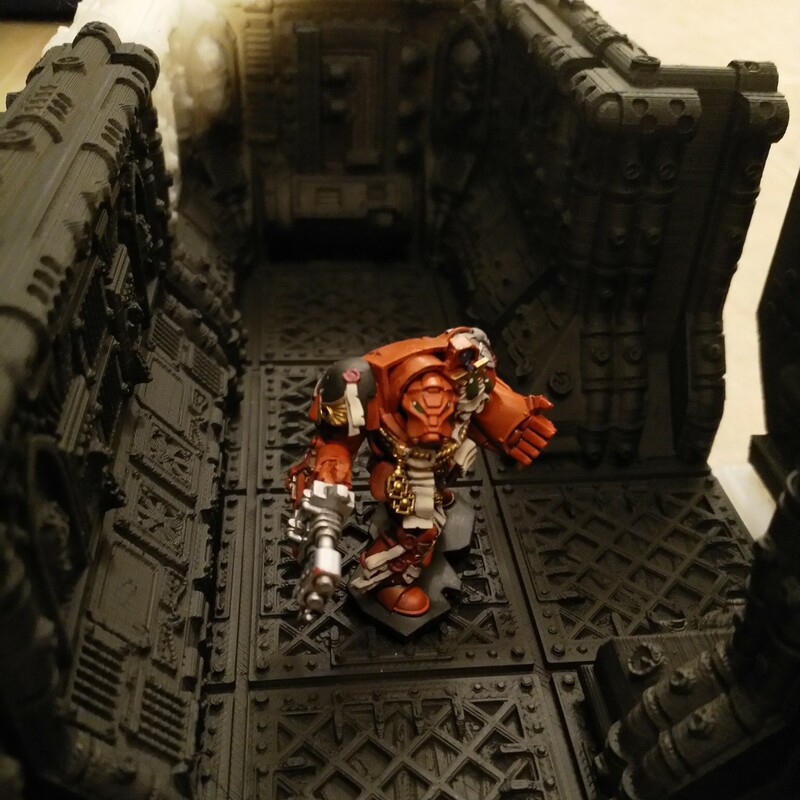 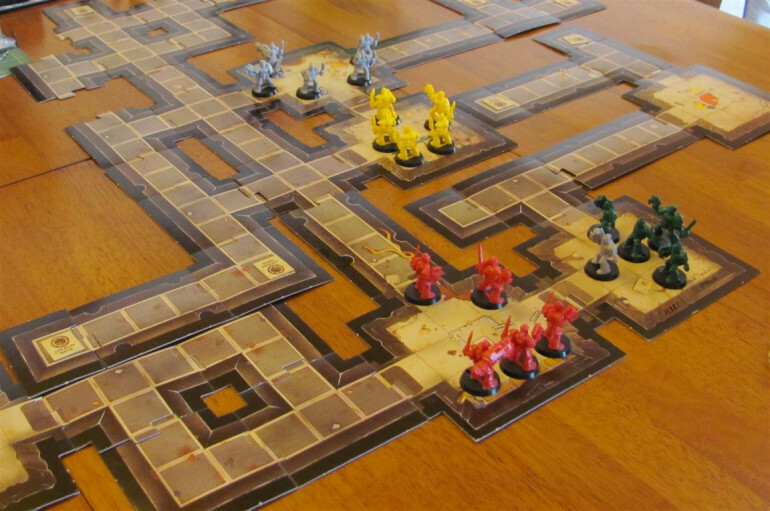 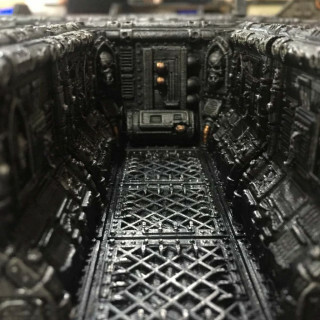 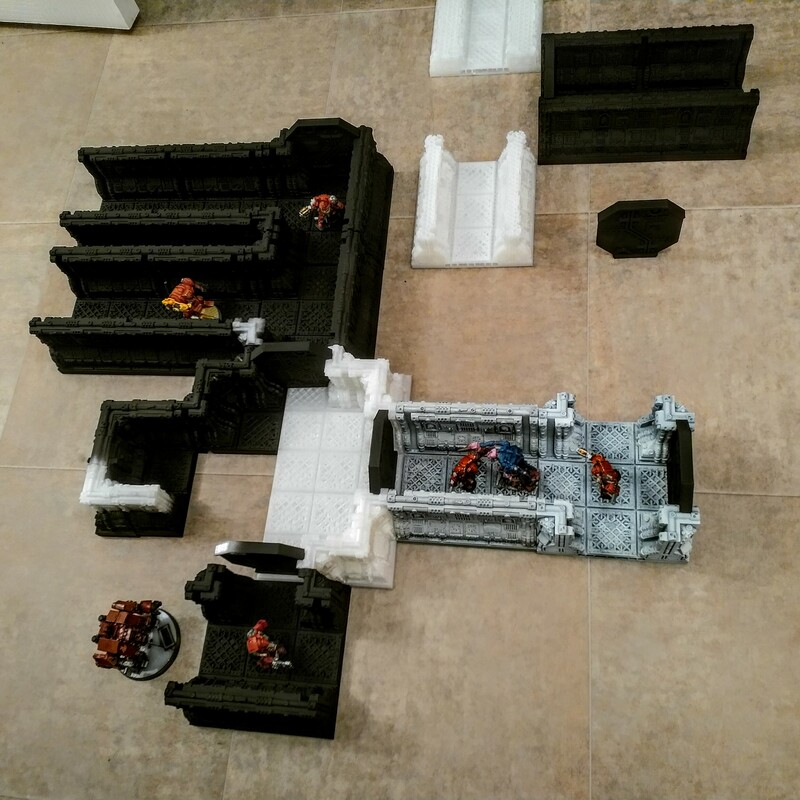 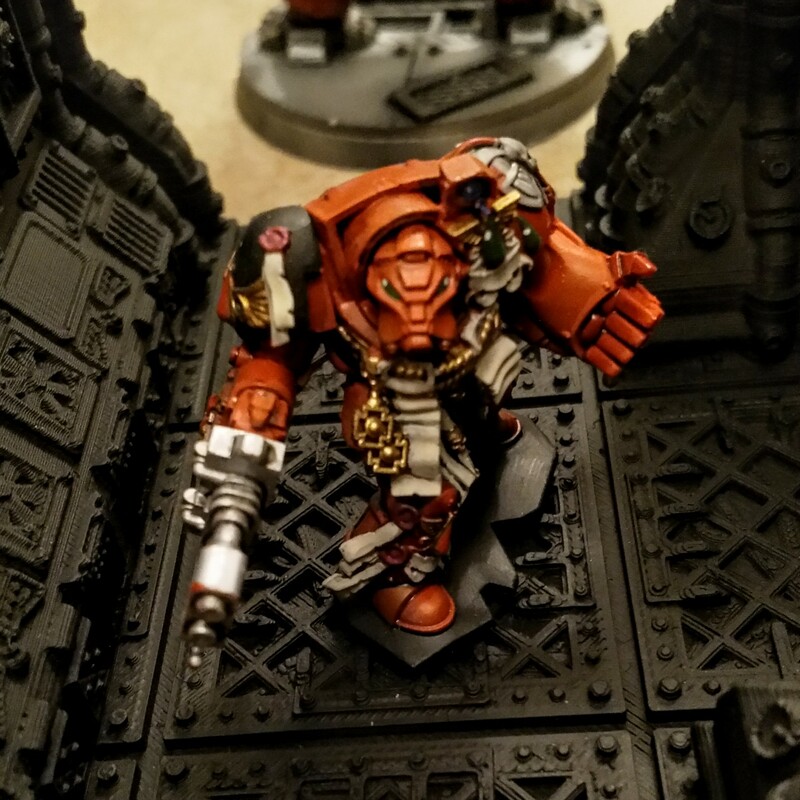 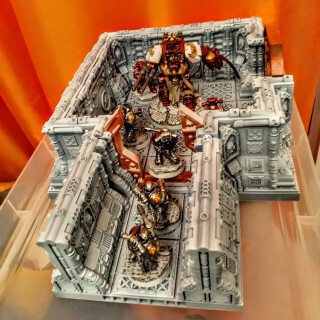 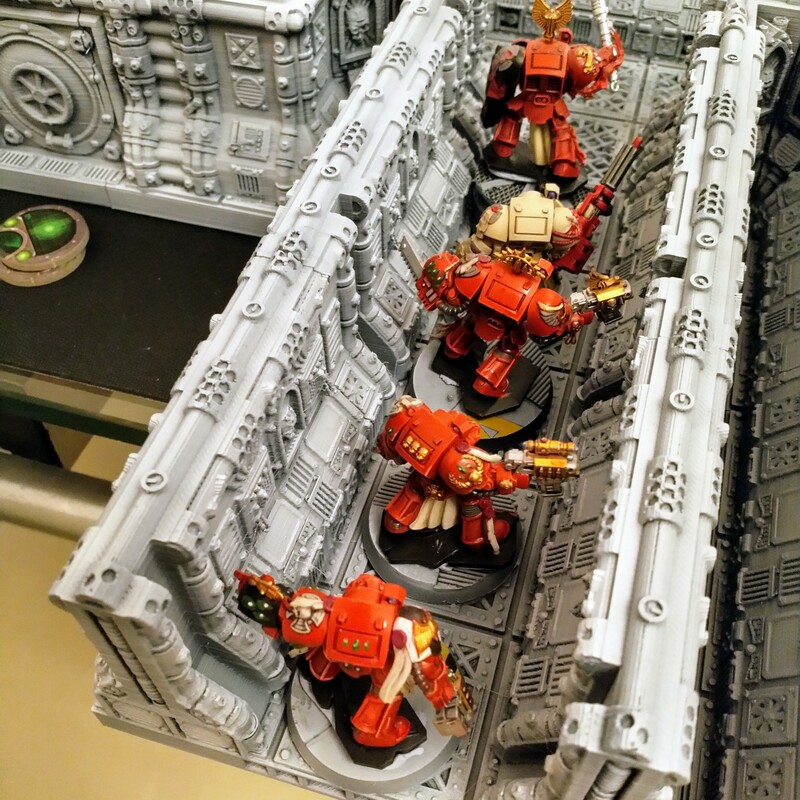 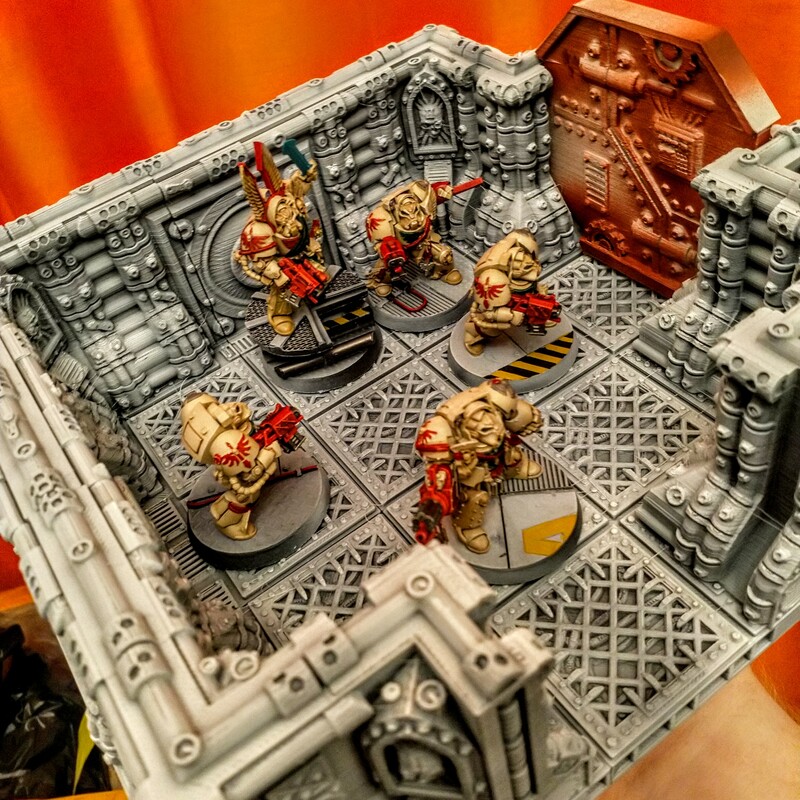 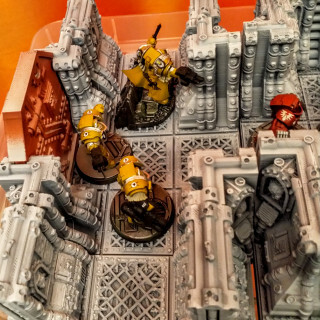 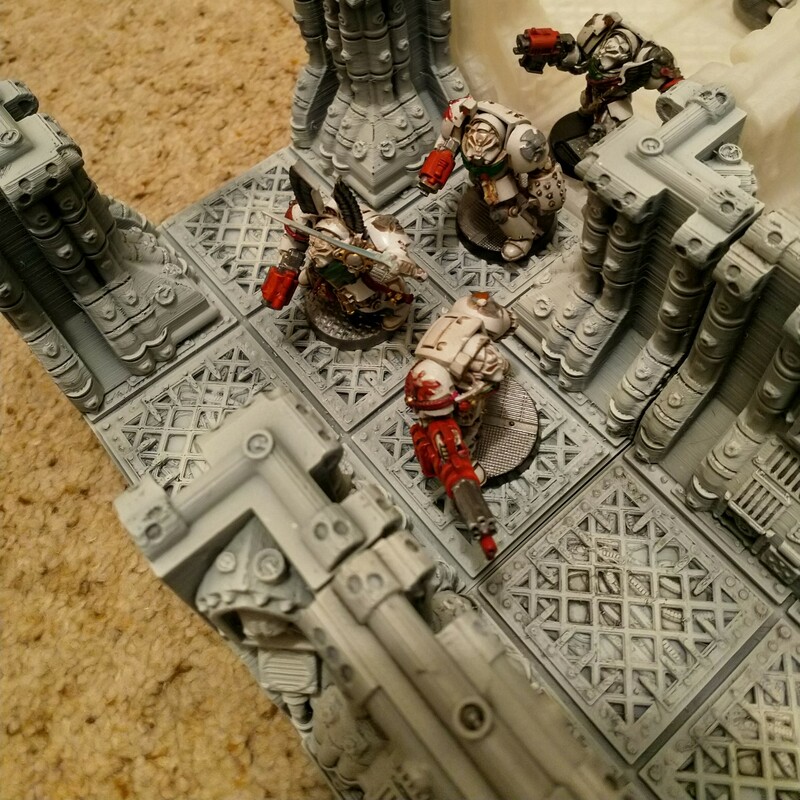 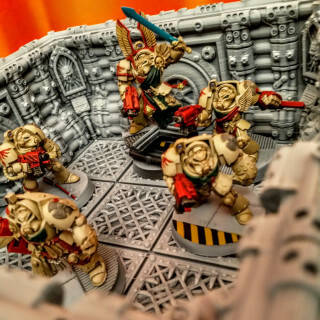 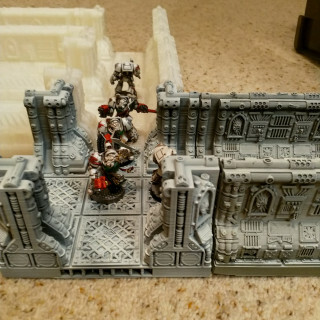 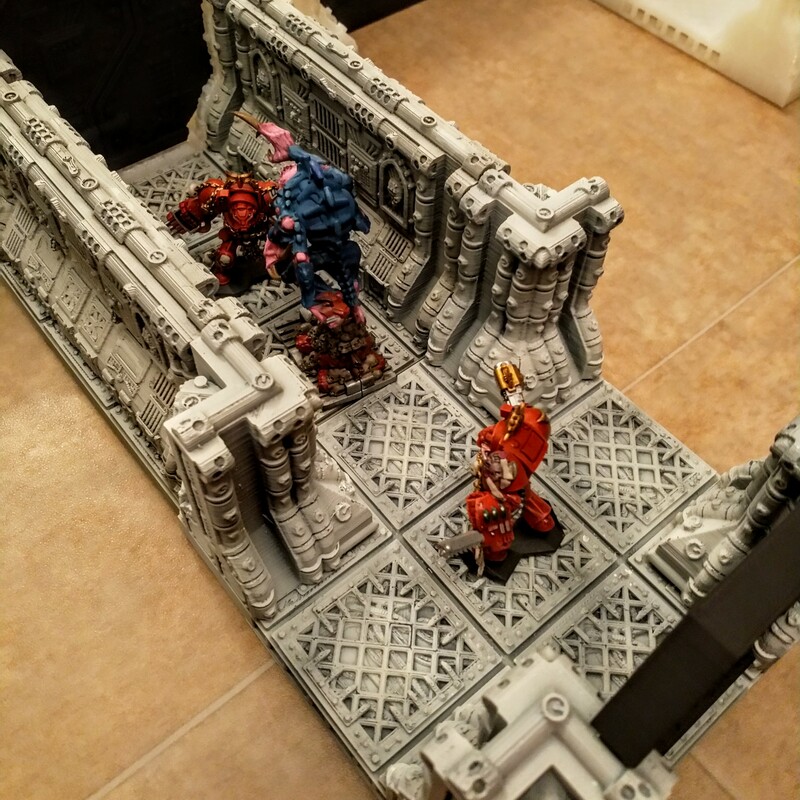 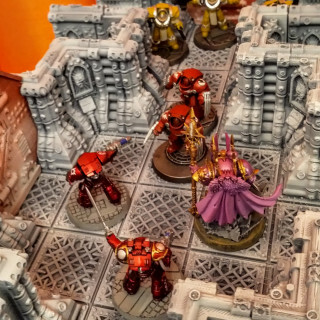 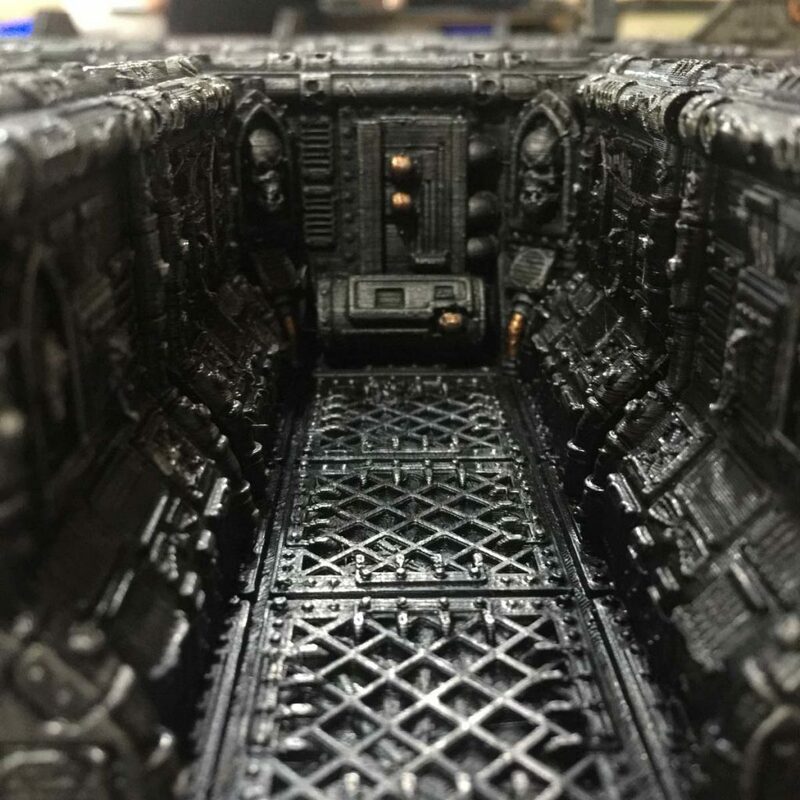 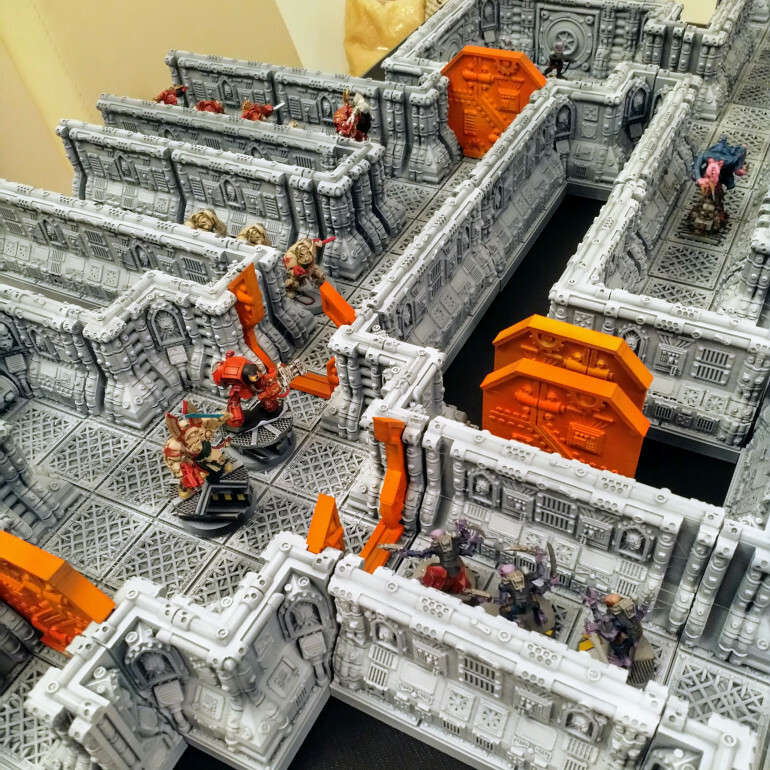 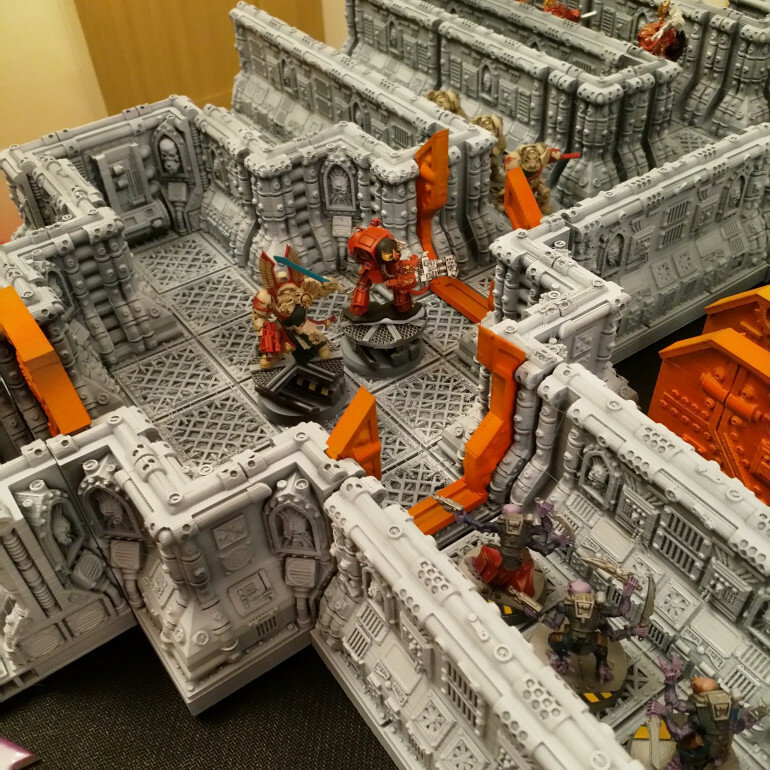 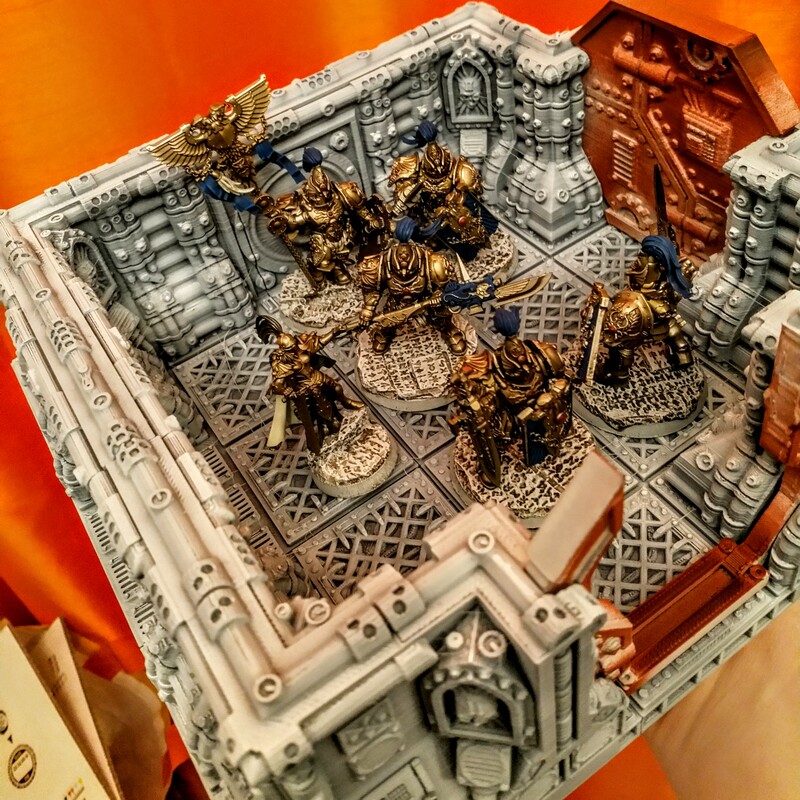 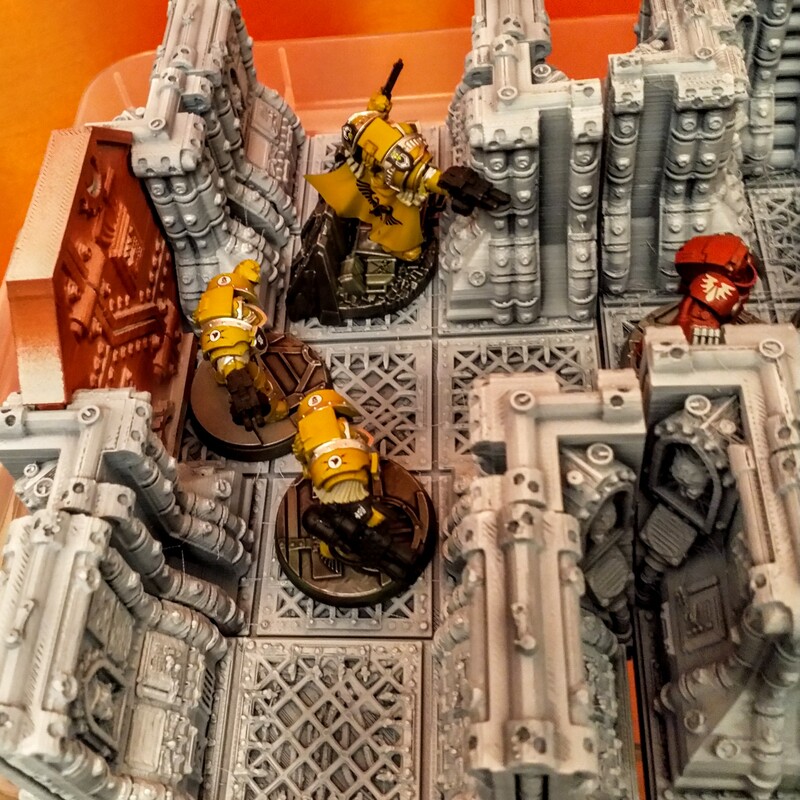 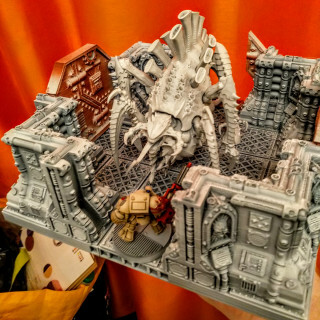 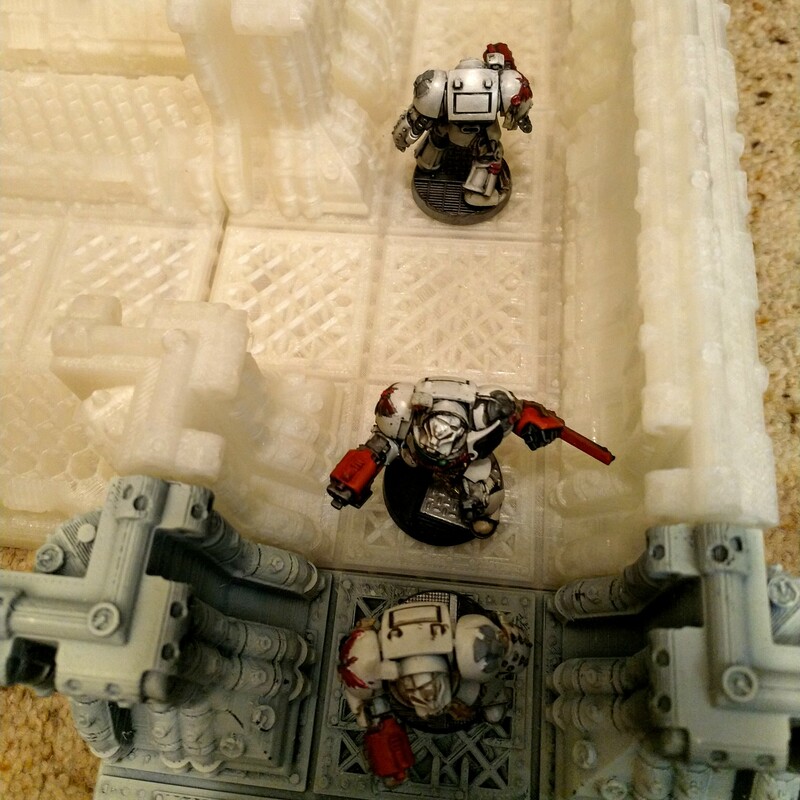 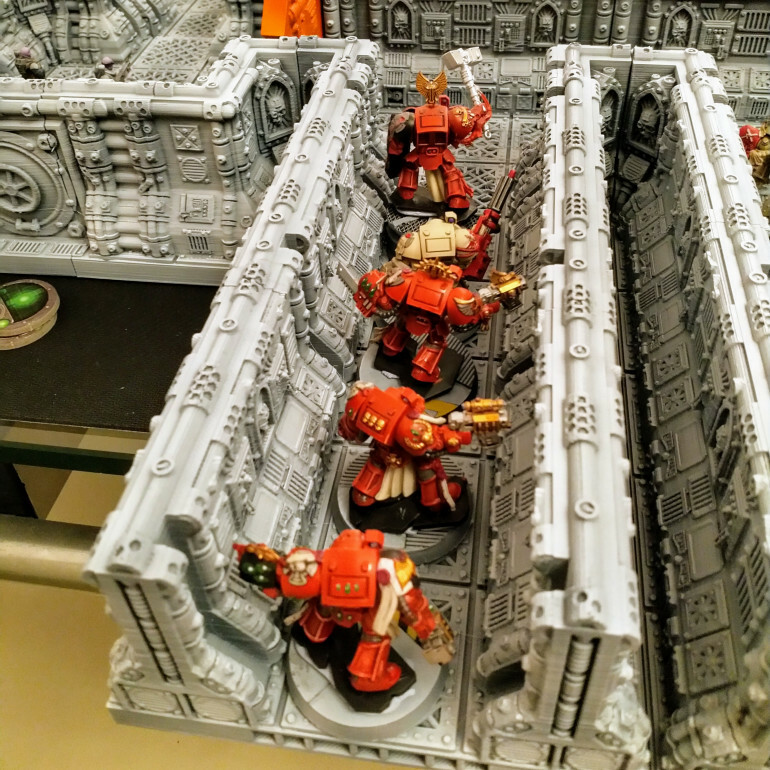 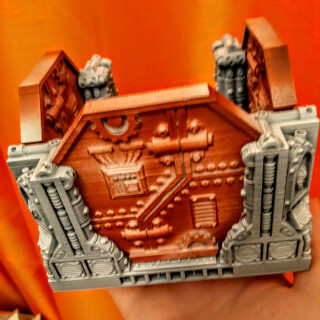 The models seem very Space Hulk focussed – that is the corridor tiles seem to fit neatly on a tile-for-square along the original board lines and the rooms and corridor pieces all seem to be covered. 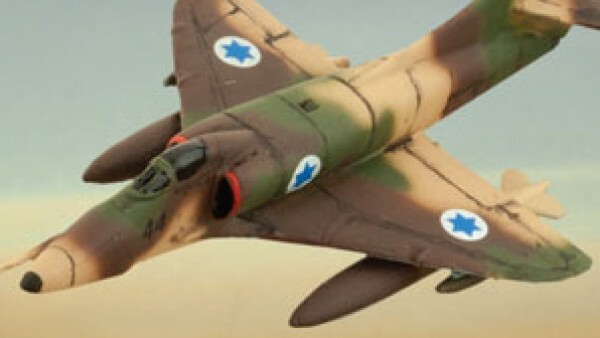 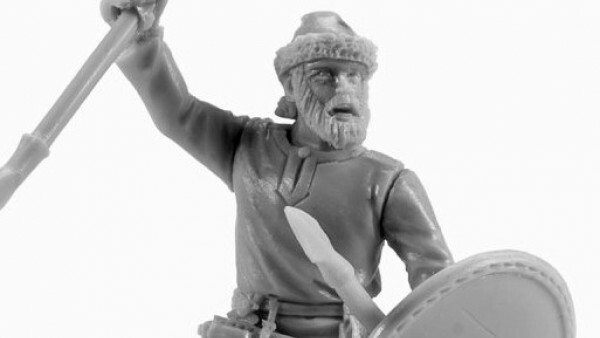 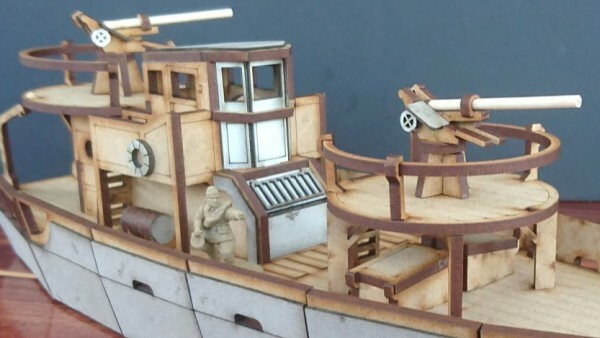 Boarding Rams introduced in 4th Edition are also modelled. 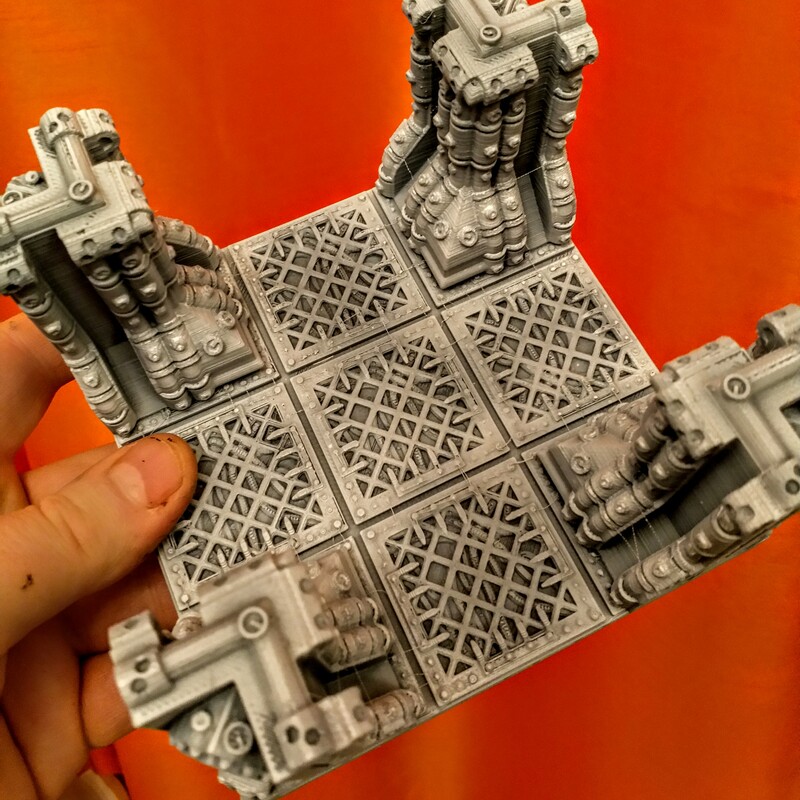 The tiles are scaled at 30mm in this set – a decision that I will have to make is whether to print as is, and use the models at that size or to print them at 133% (or so depending on tolerances) and use terminators at their modern base sizes. 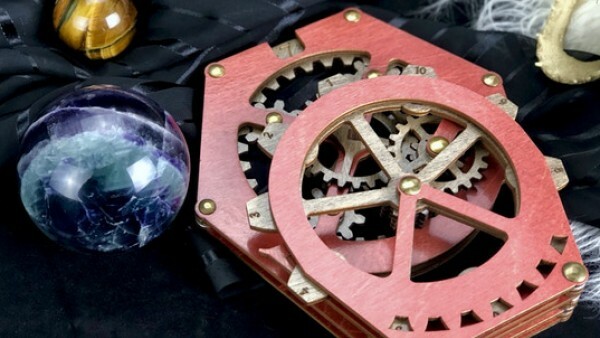 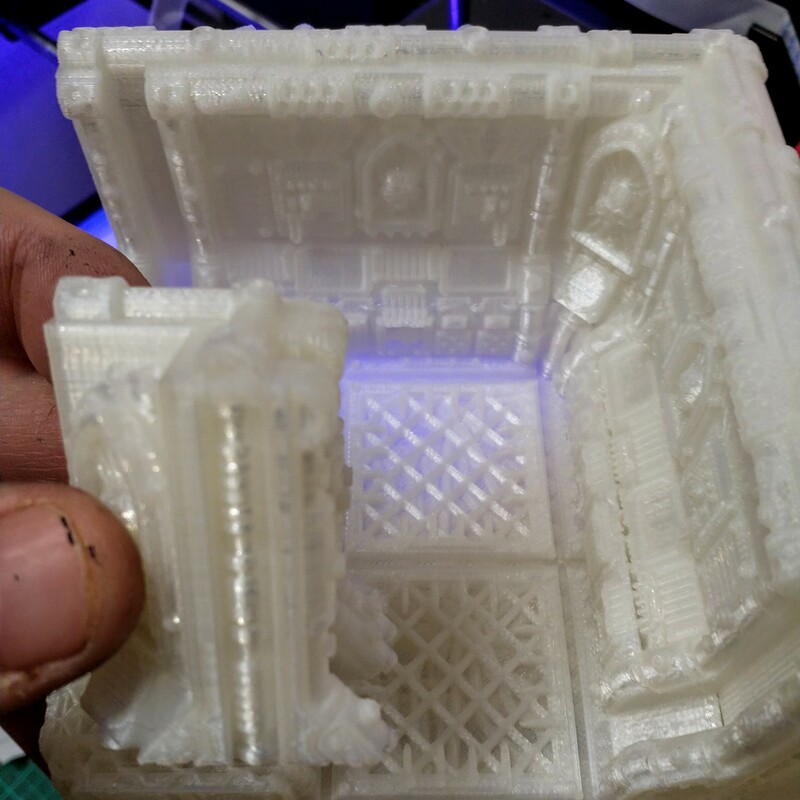 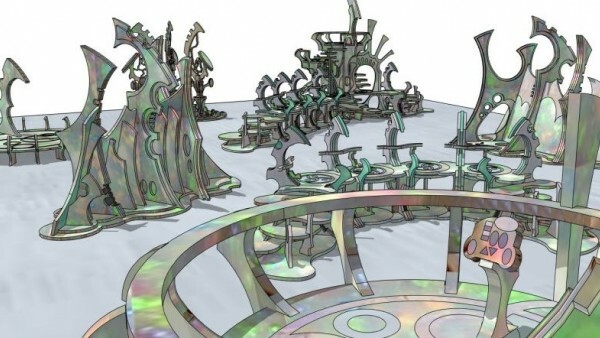 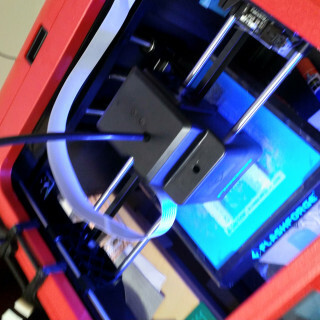 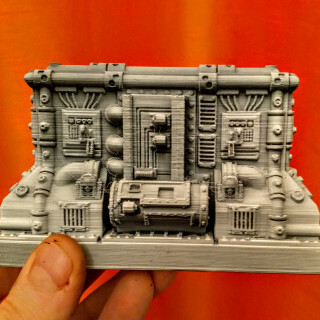 The 3d objects are (Barges aside for obvious reasons) OpenLOCK compatible, which allows the pieces to be connected together with clips that you also print. 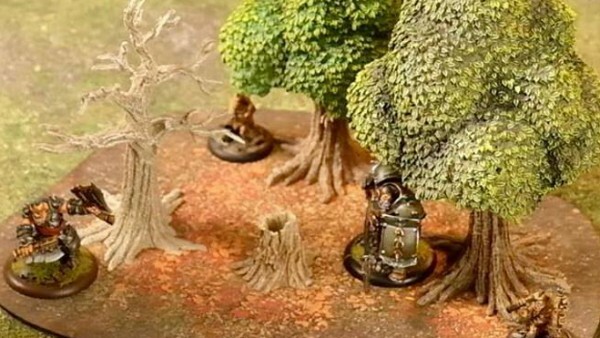 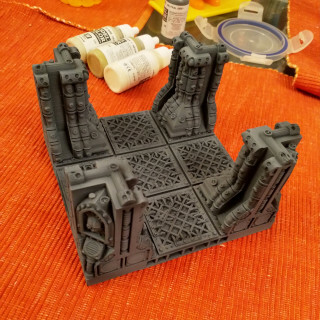 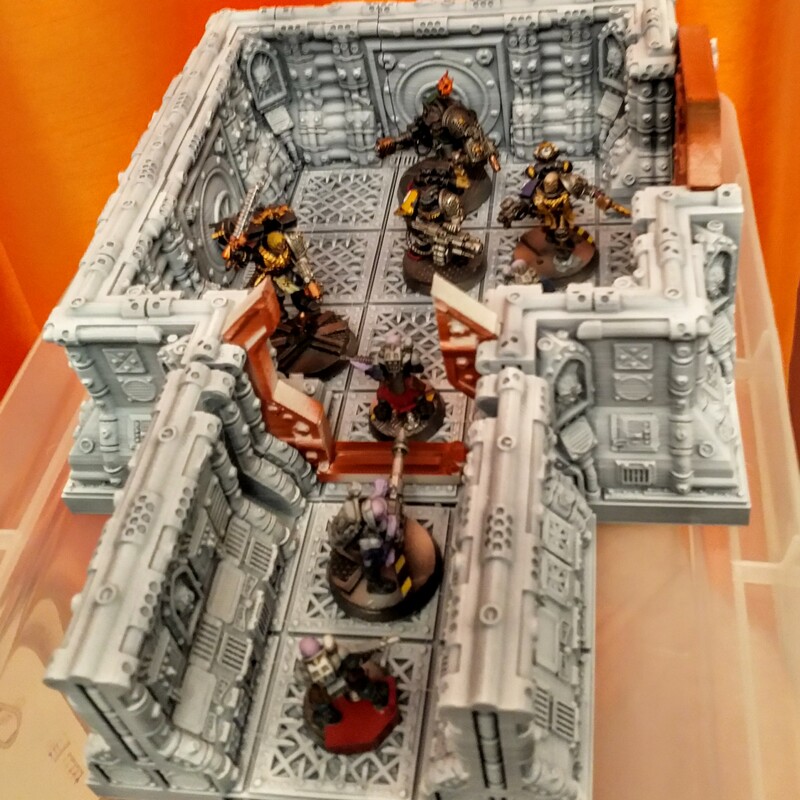 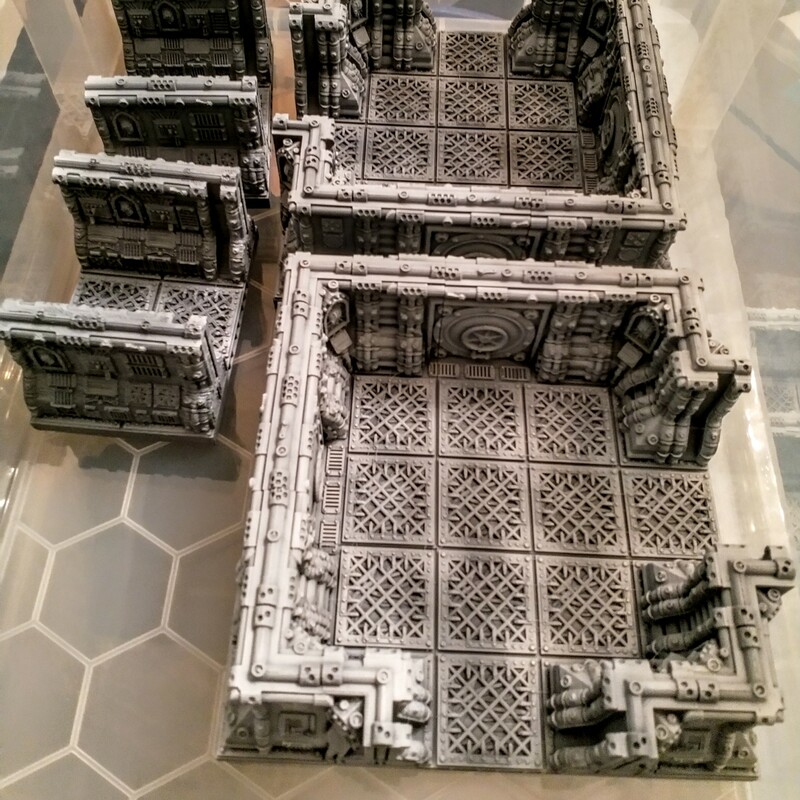 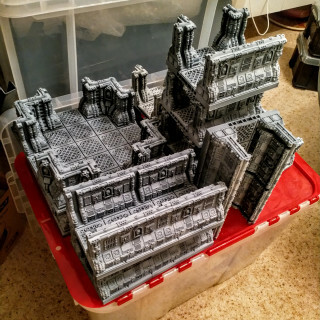 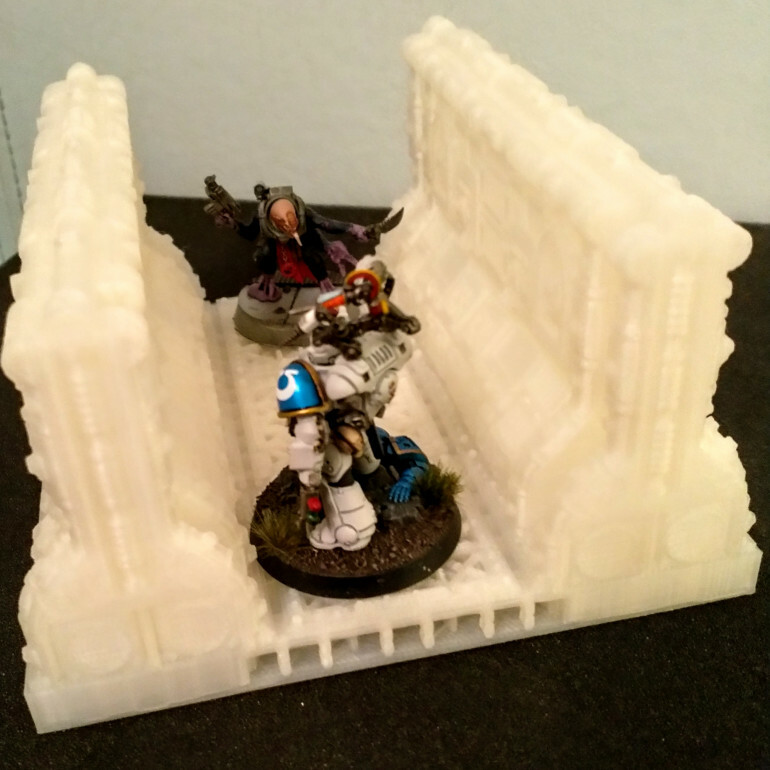 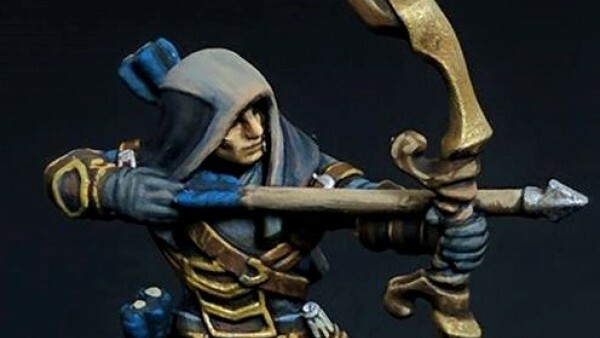 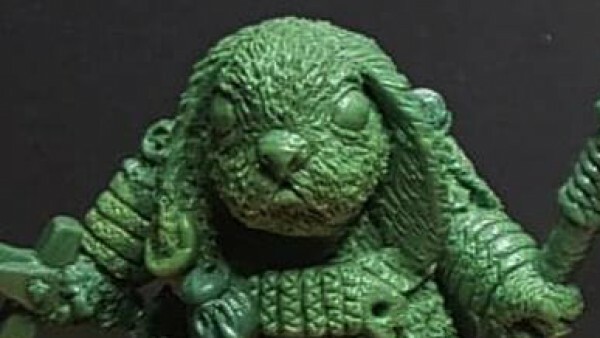 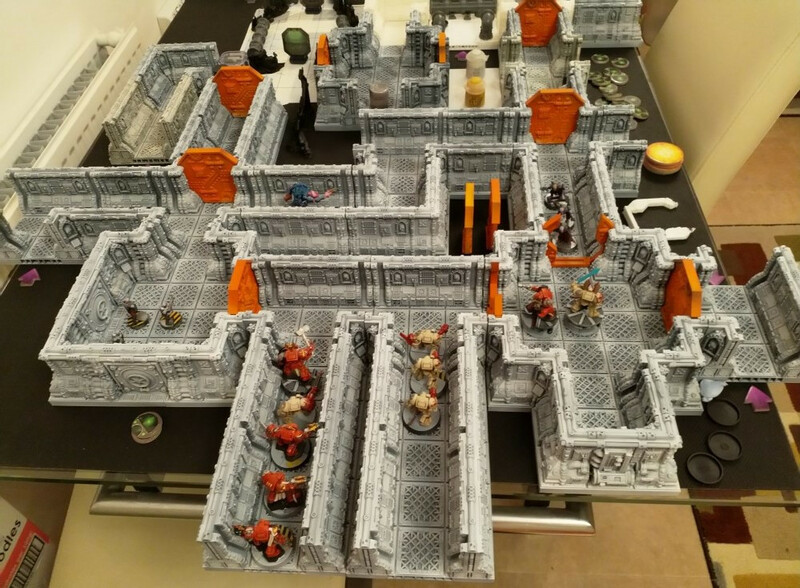 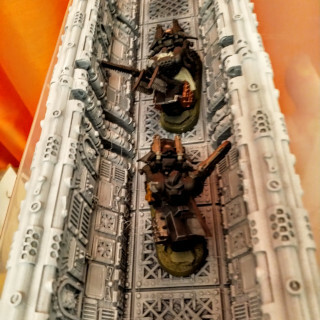 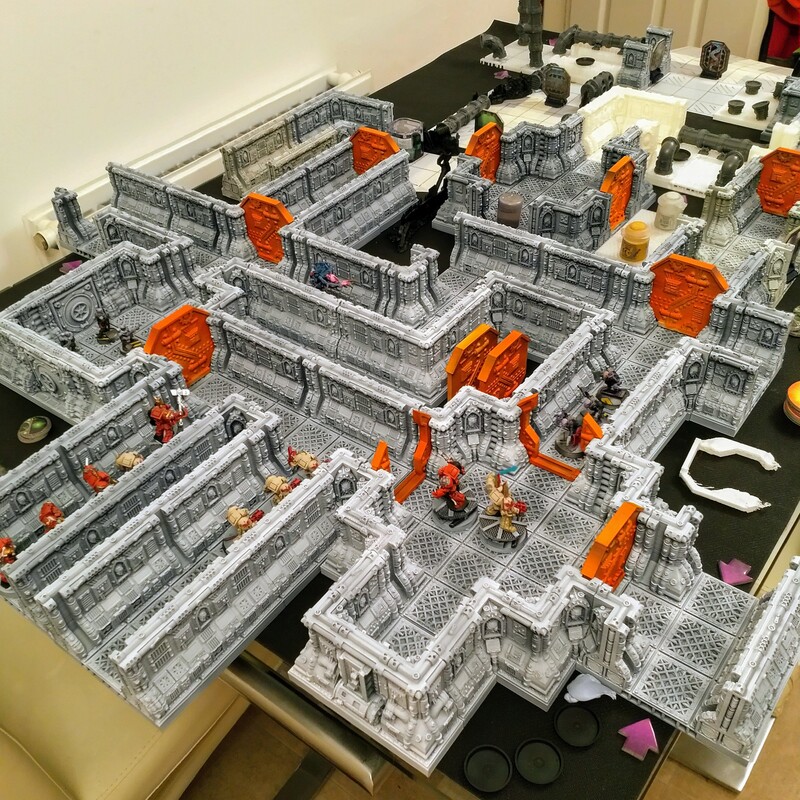 This system is also used on dungeon crawlers and I have seen it appear as a feature on a number of 3d printable Terrain over the last 6 months.